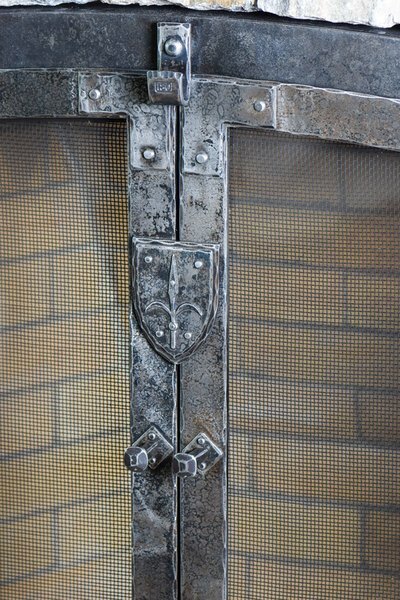 This design features offset hinges so the doors could open flat against the stores, a large screen door, sliding vent and a hand-chiseled coat of arms from my clients hometown in Italy. 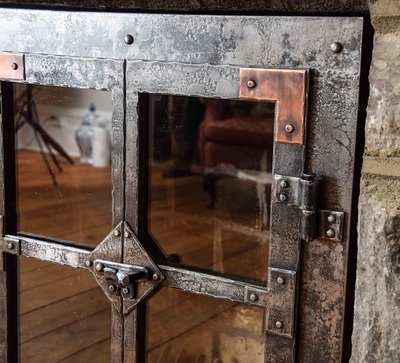 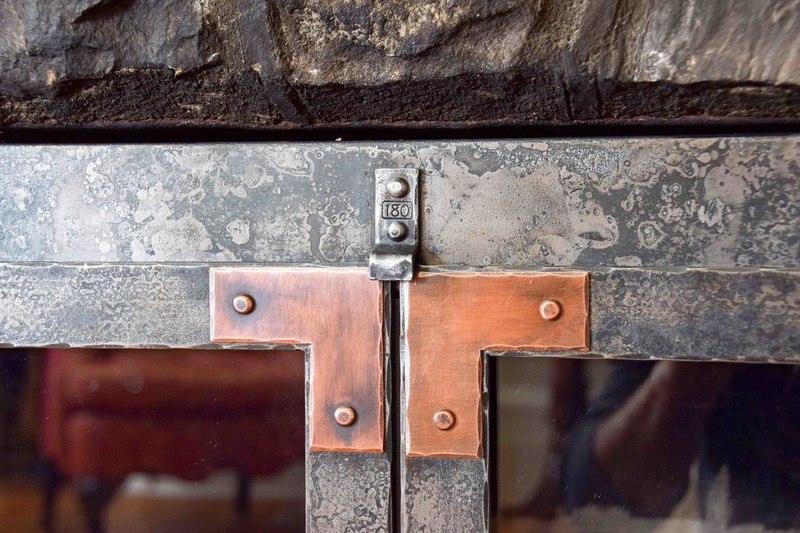 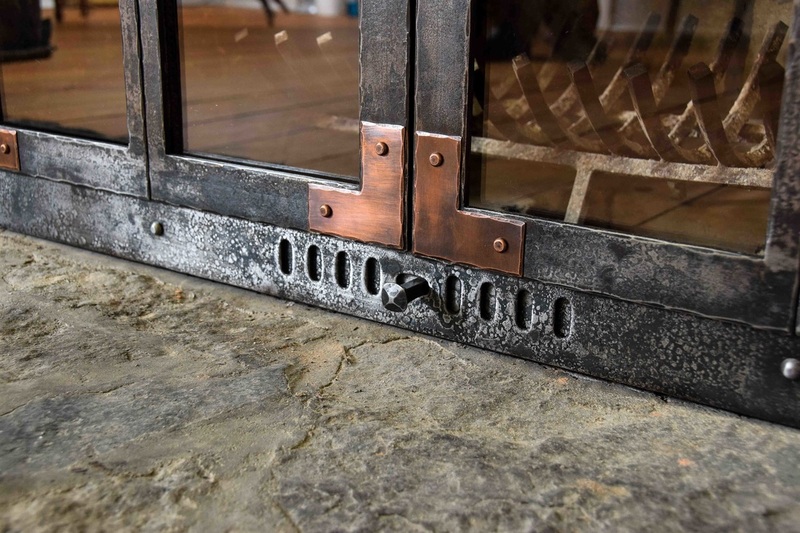 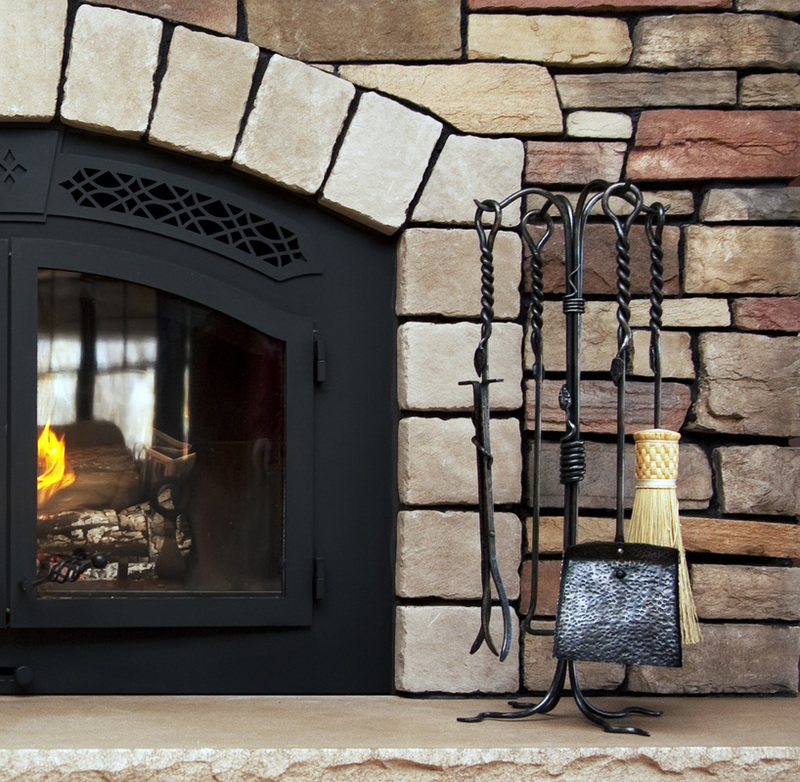 This fireplace frame and bi-fold doors features copper accents, hand-forged hinges and latches. 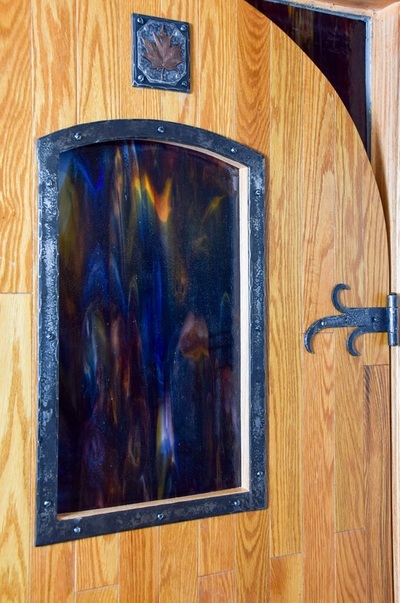 The doors are equipped with special ceramic glass panels. 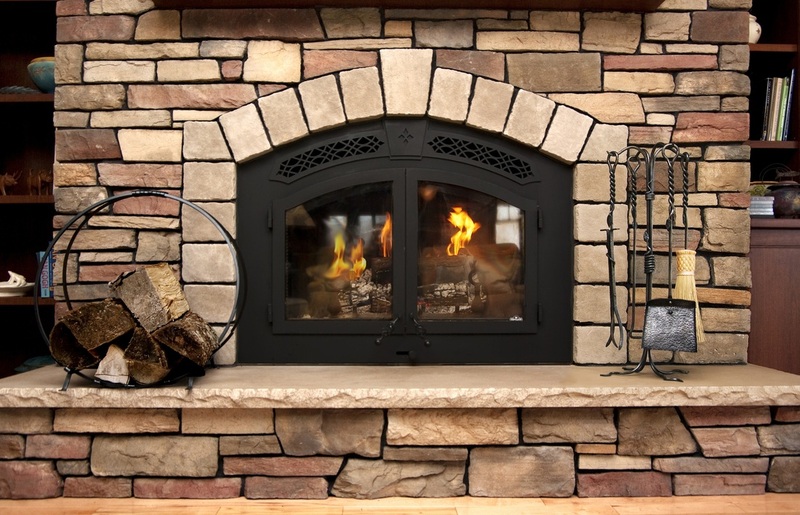 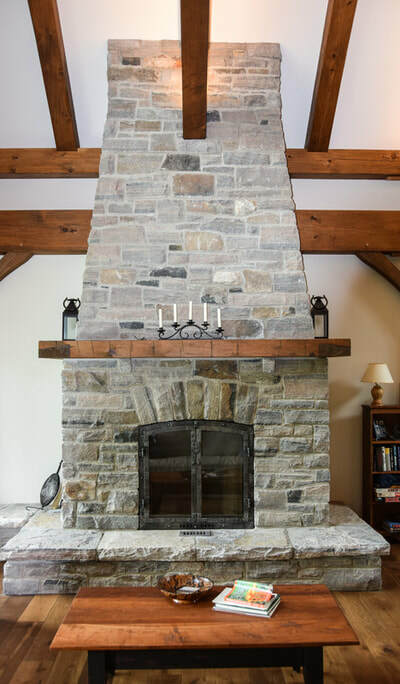 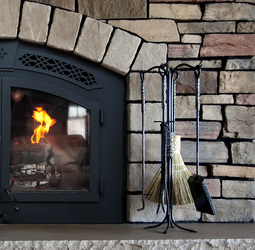 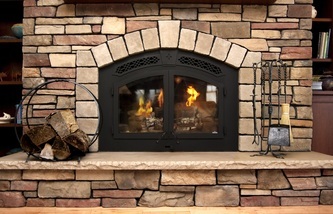 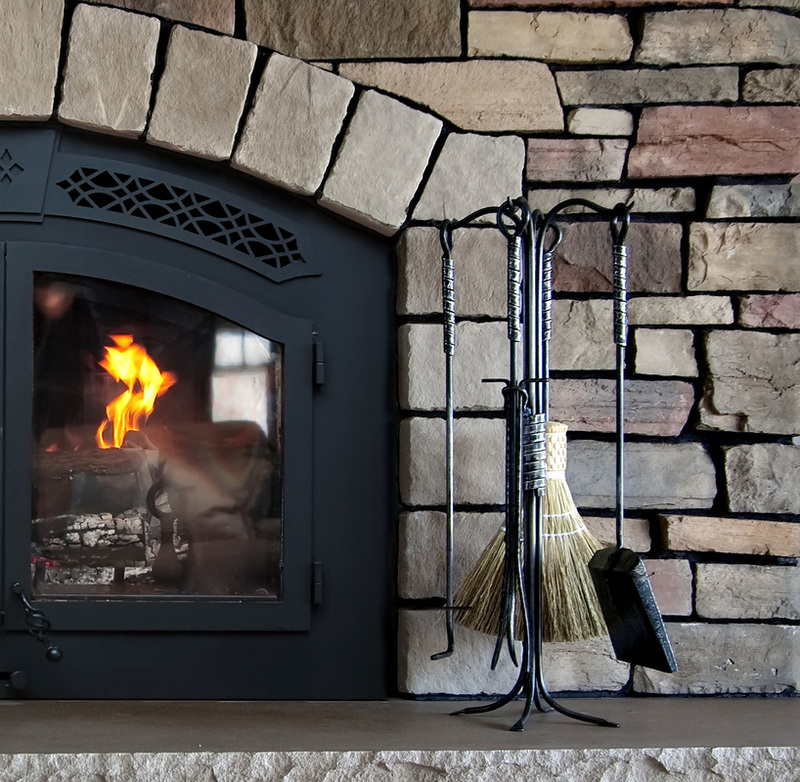 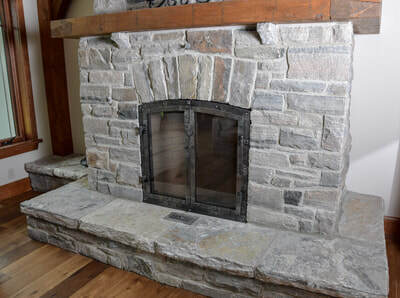 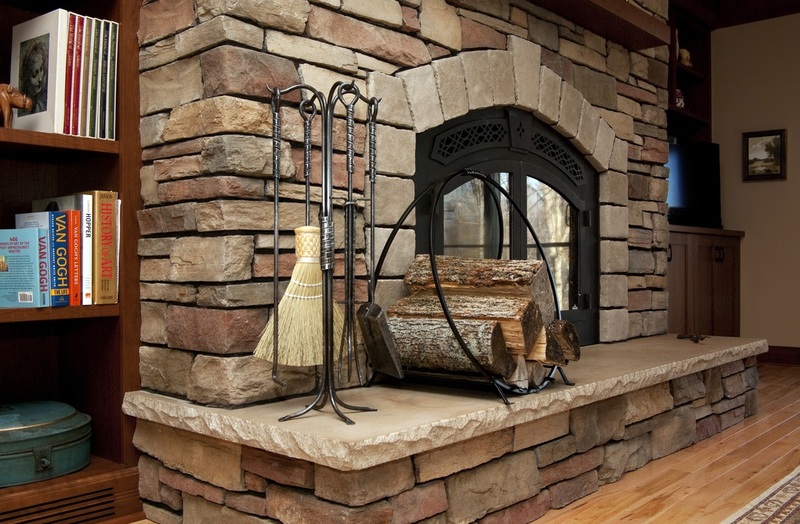 This fireplace went into a beautiful stone home. 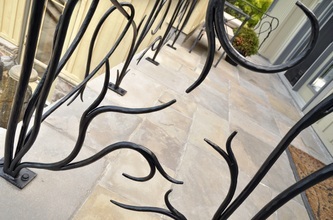 Pictures are shown pre-grouting of the perimeter. 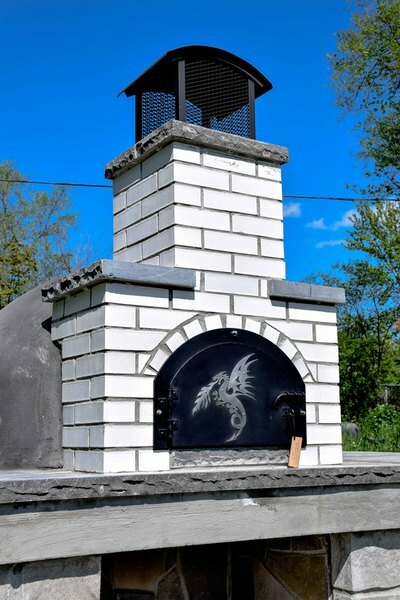 Commissioned from Belleville, Ontario, this outdoor pizza oven features hand-forged hinges, latch and lock with skeleton key. The cap shape was designed to follow the arch of the door. 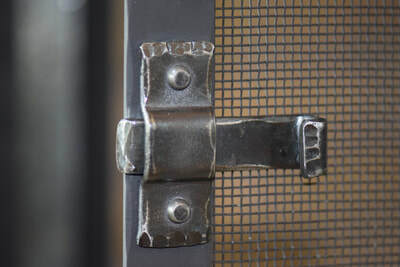 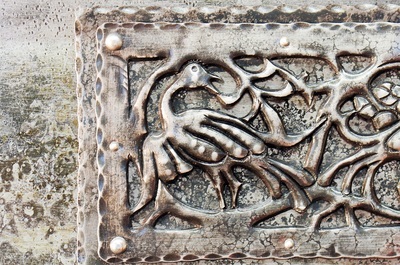 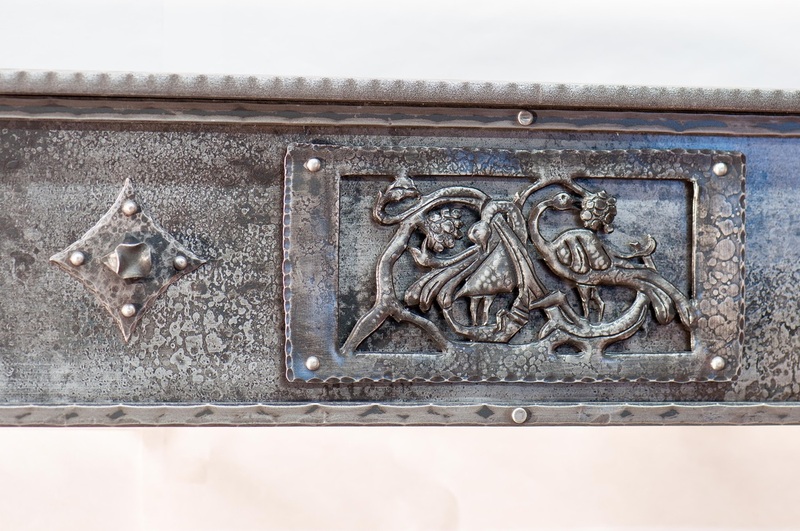 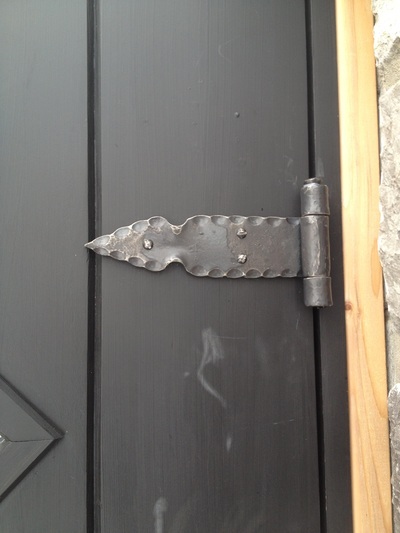 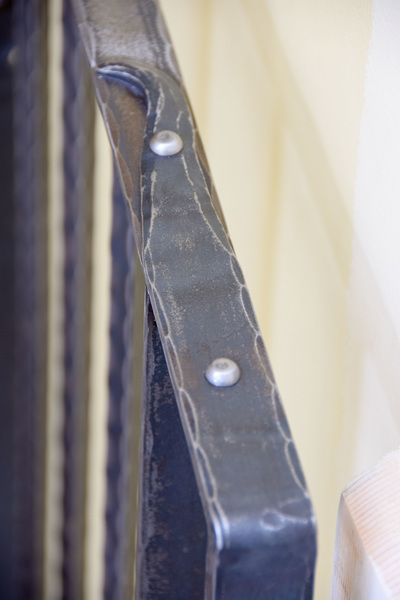 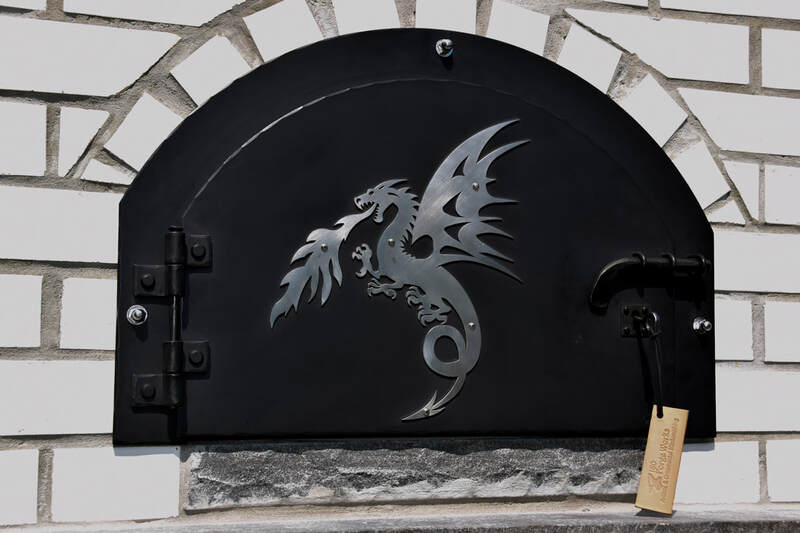 A stainless steel dragon feature is riveted to the door with stainless steel rivets. 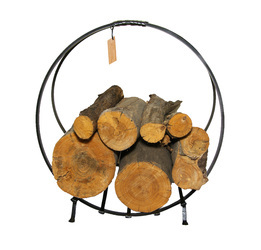 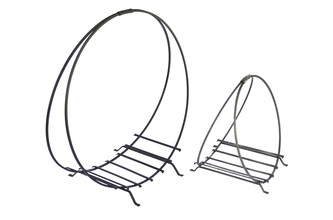 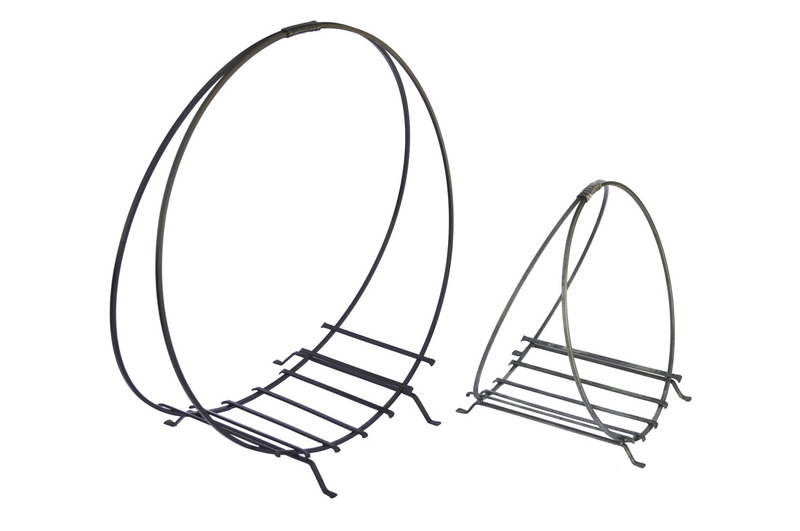 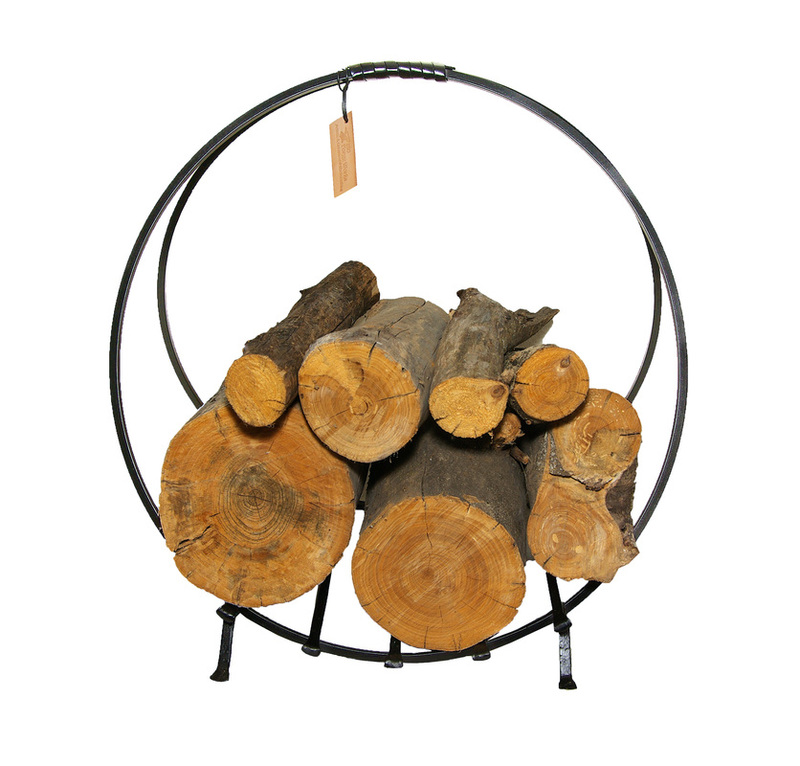 This fireplace set commission features a side holder for paper and another for kindling. 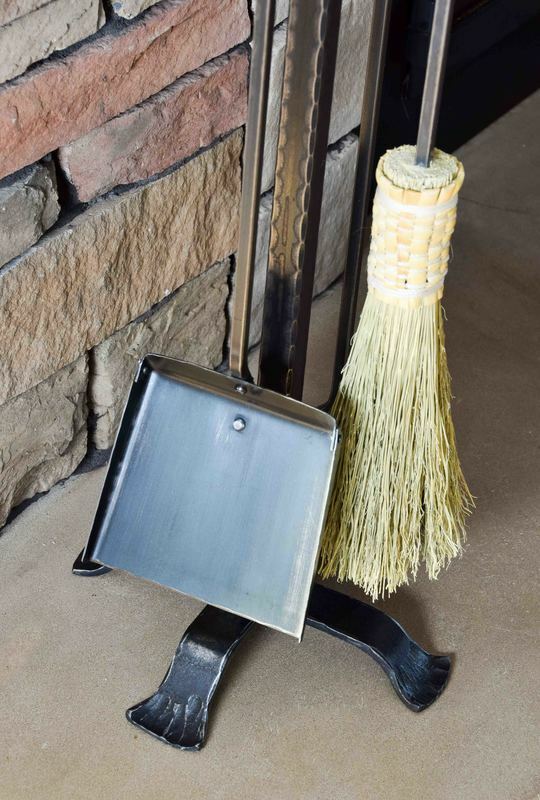 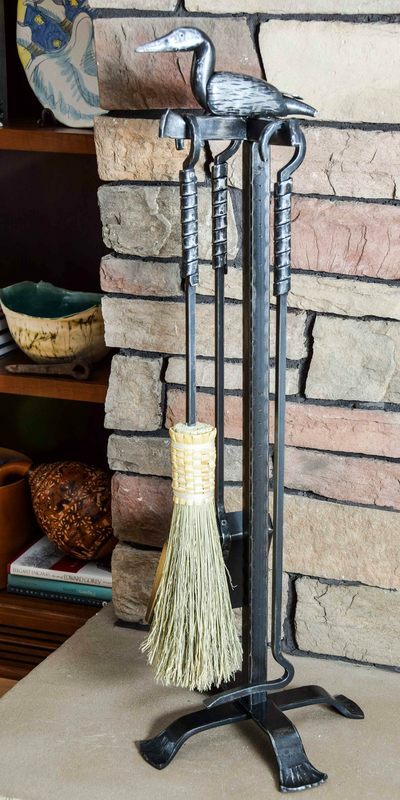 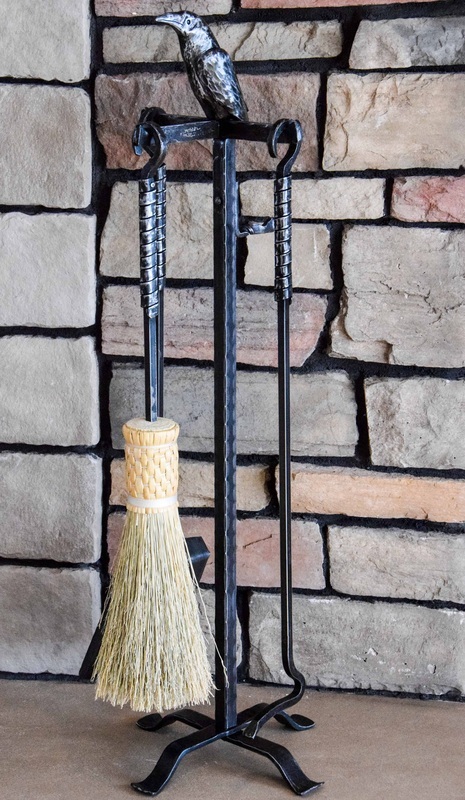 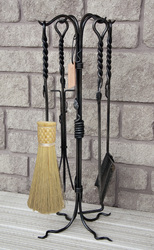 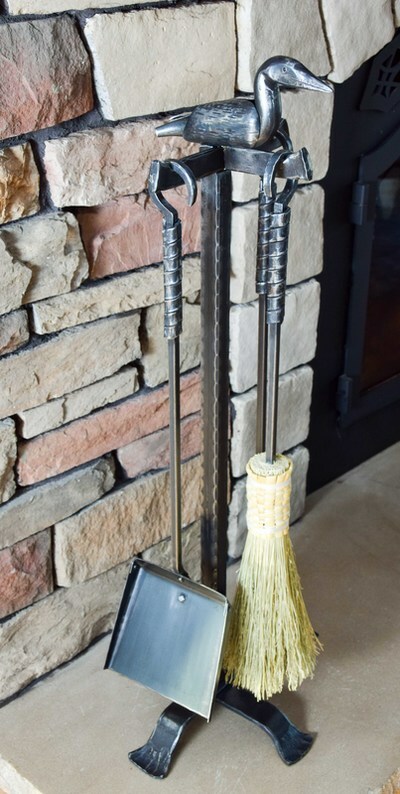 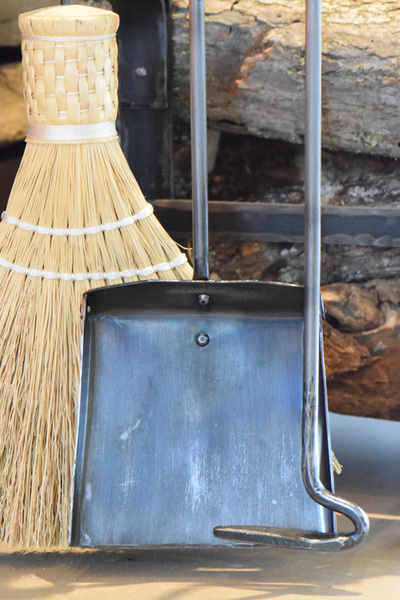 Included with the set is a stoker that also functions as a coal rake, a hand-tied broom and a shovel. 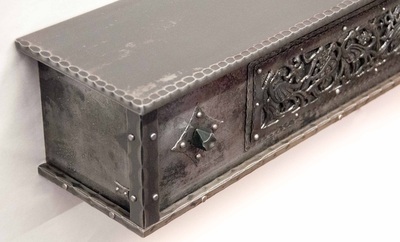 The customer brought me the design concept and I added a few of my own touches to it. 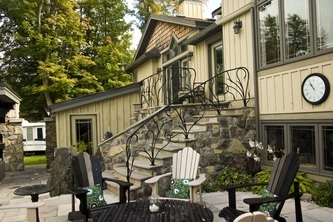 It is going to a beautiful cabin deep in the woods not too far from my forge. 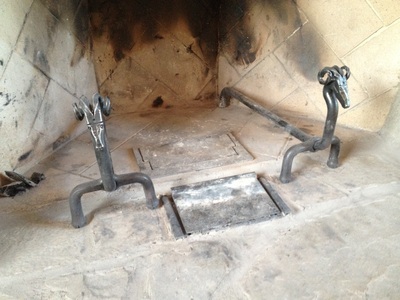 Andirons go inside the fireplace to support the burning logs up & out of the ashes. 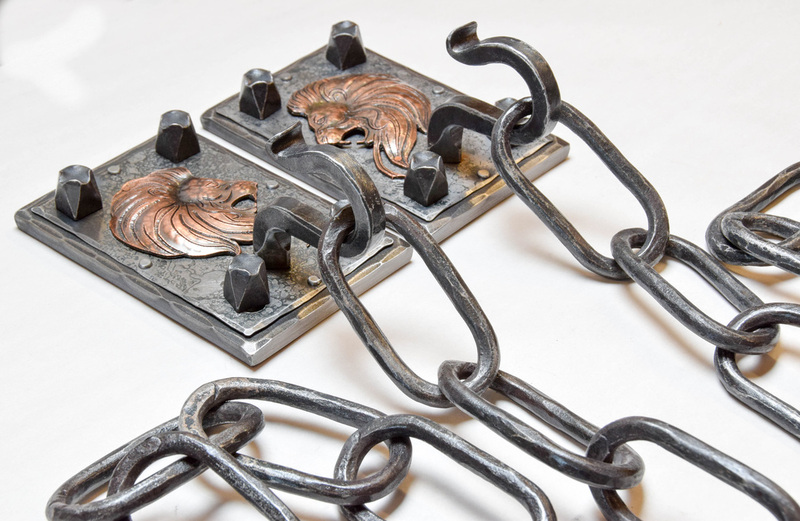 These Rams Head Andirons are an example of commissioned work. Just about any shape, style or theme can be created. 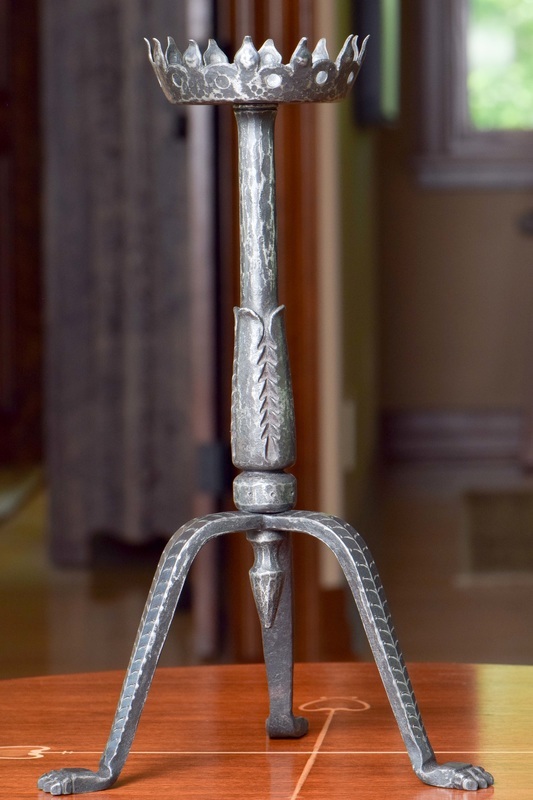 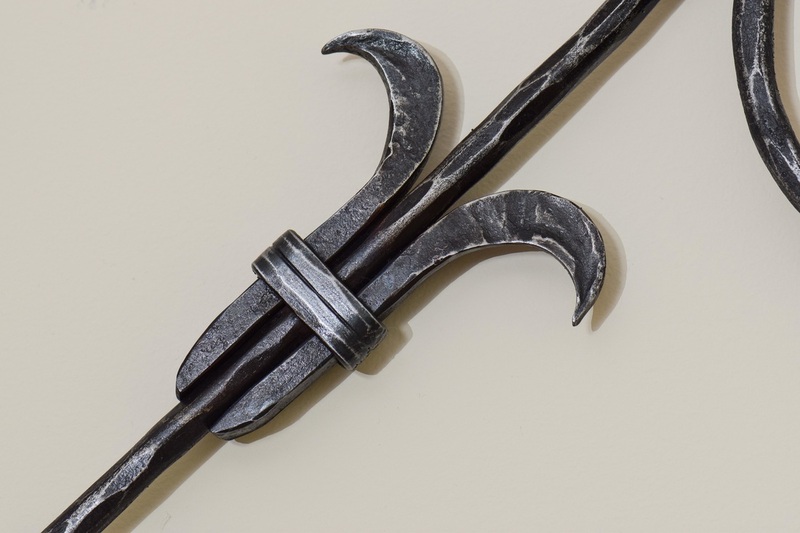 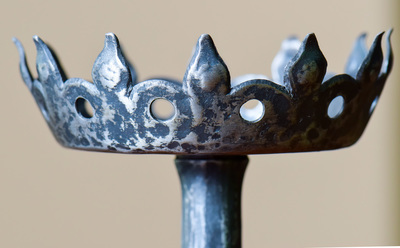 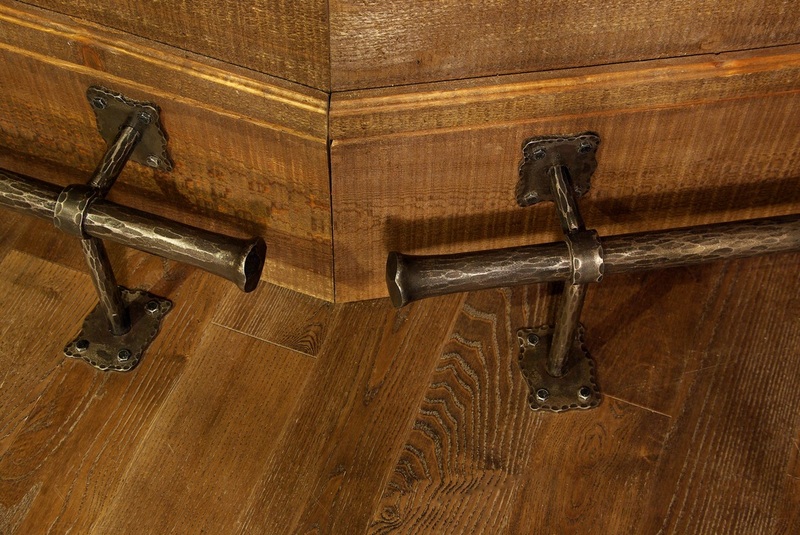 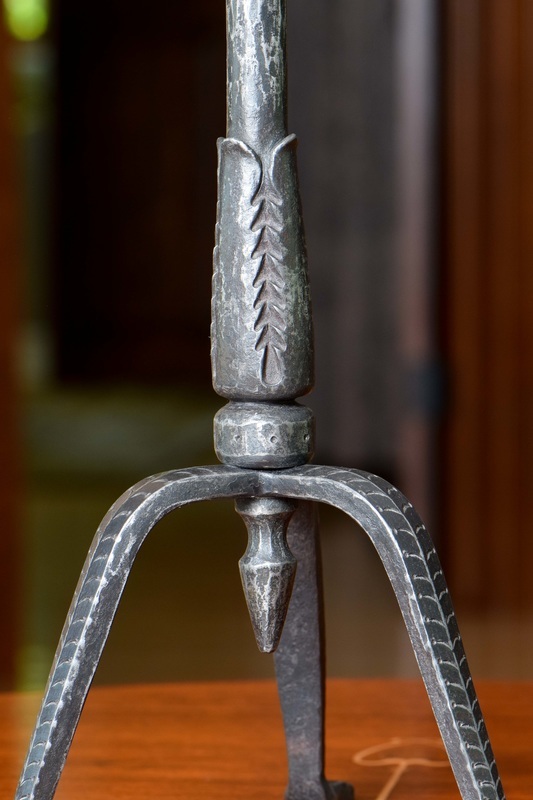 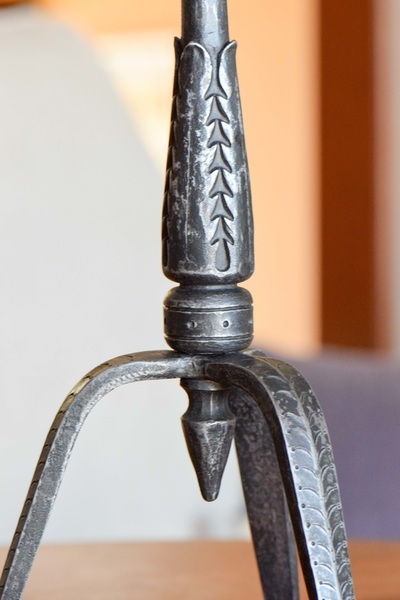 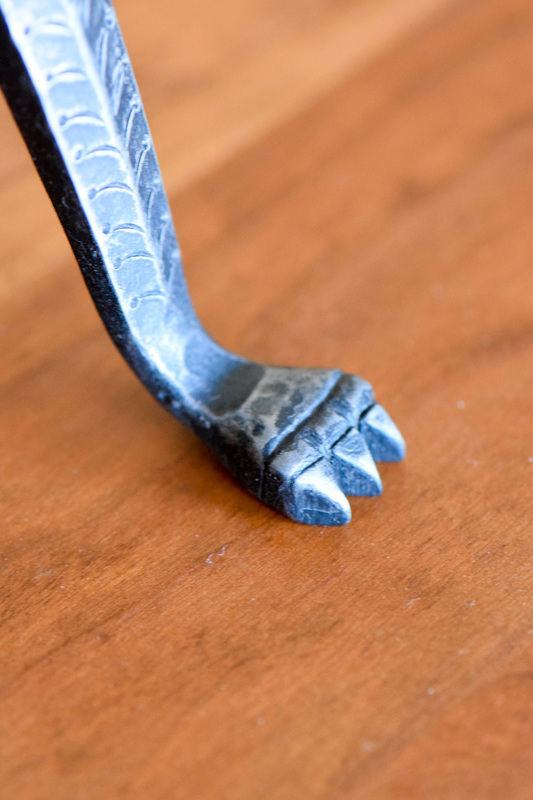 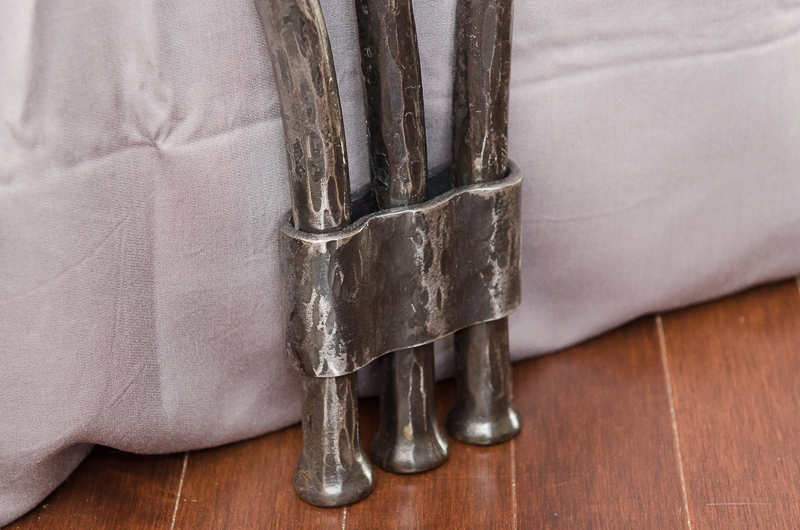 The style forged for the andirons can be carried to log holders, fireplace tools and even accents on screens. The screen shown was from a commission. 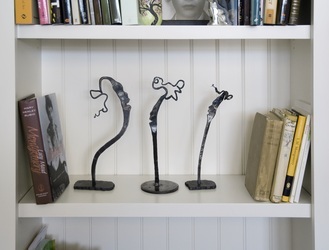 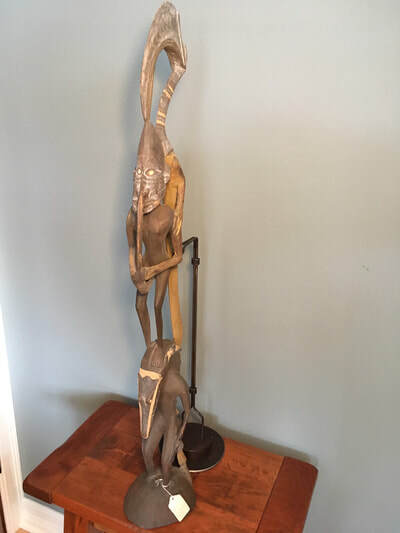 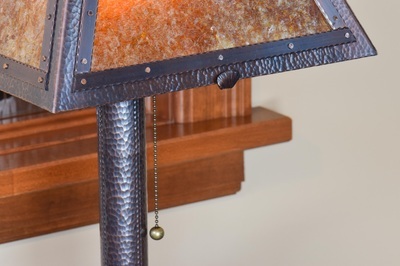 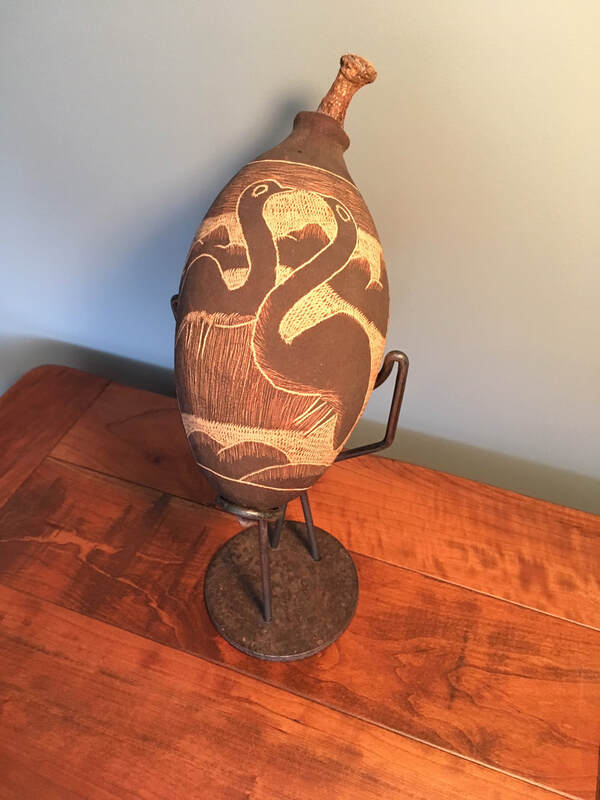 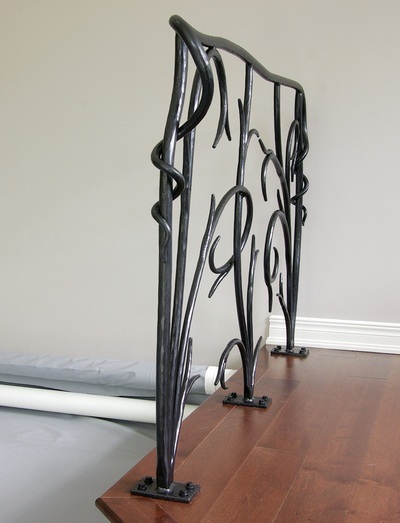 I truly enjoy working with my customers to create functional art for their home. This is a set of large mantel corbels that were commissioned. Heavy stock indeed! 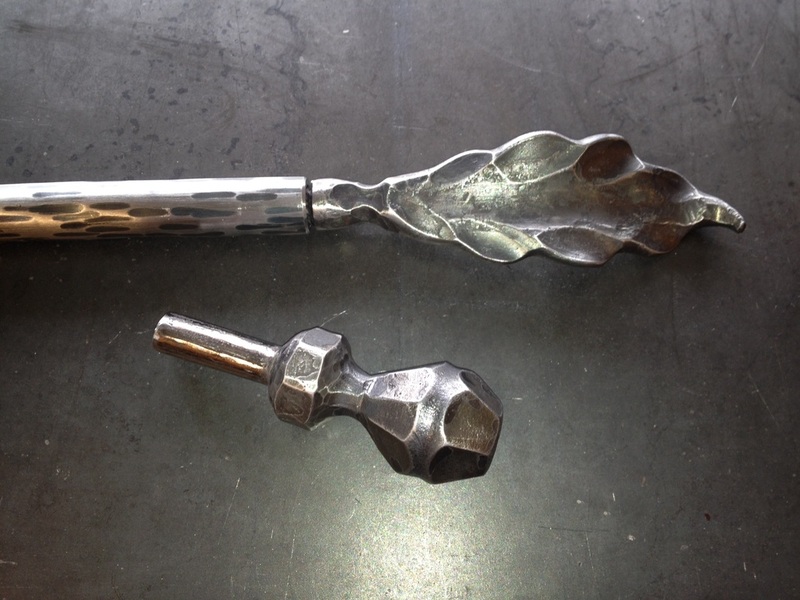 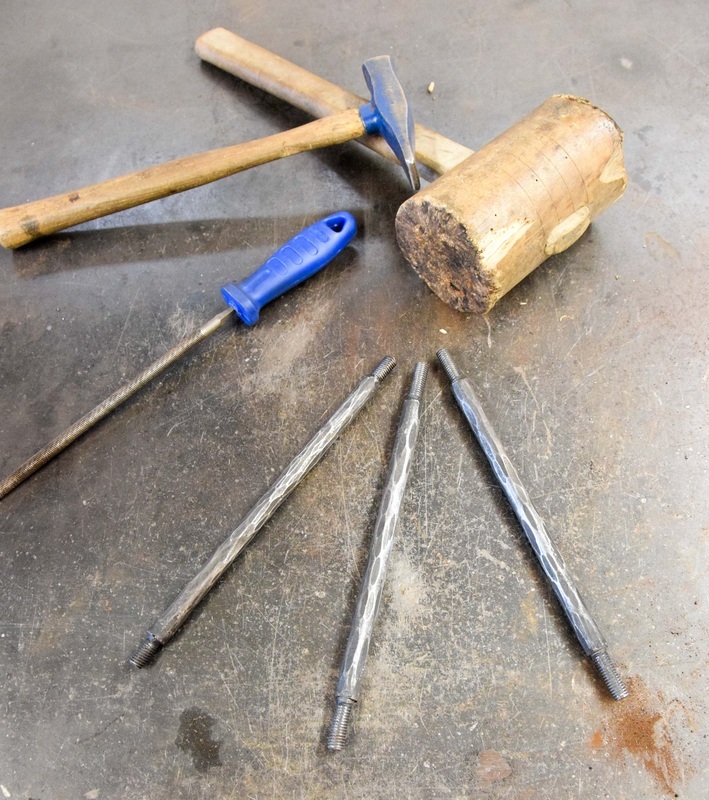 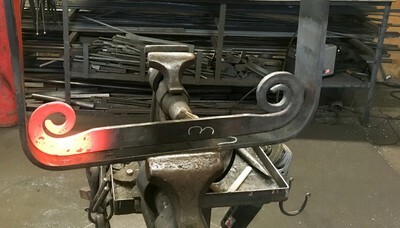 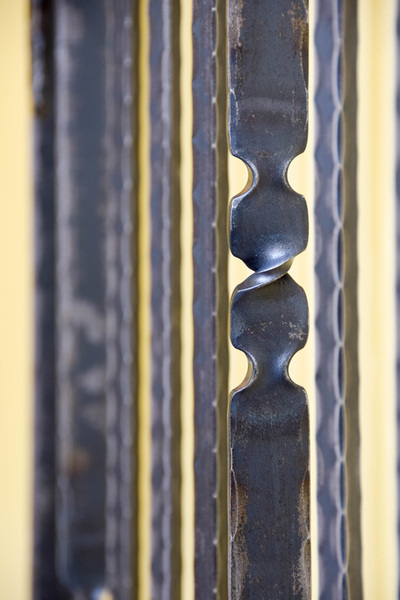 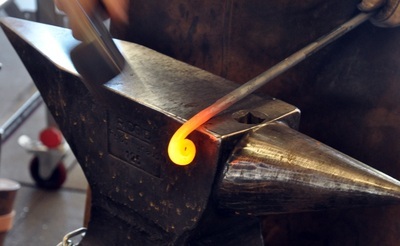 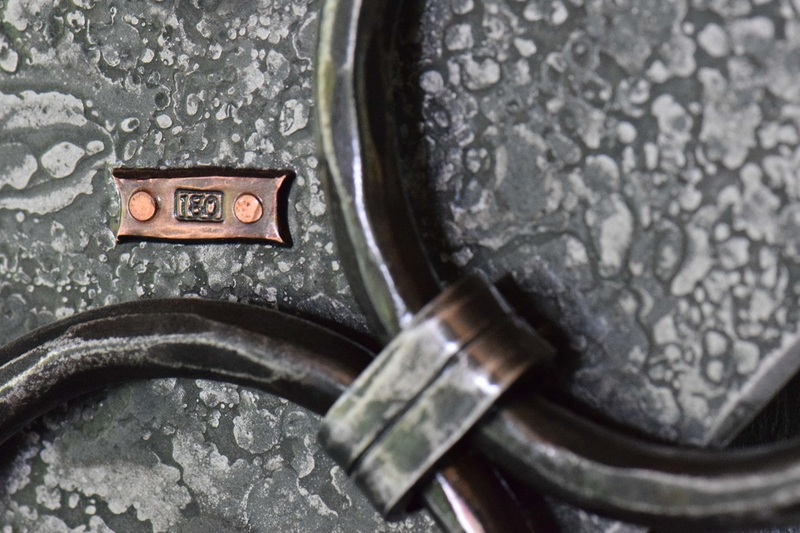 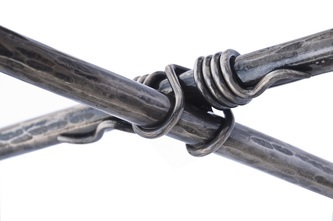 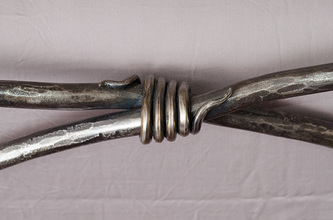 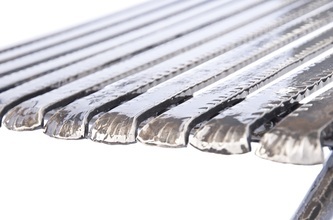 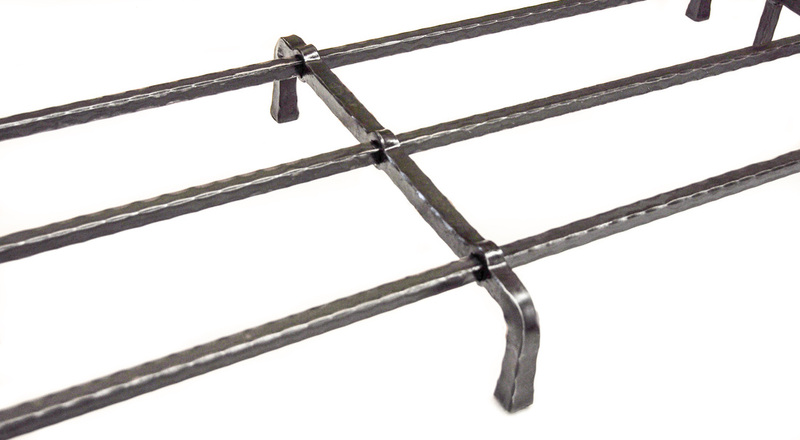 The curled pieces were forged from 3/8" x 3" bar. 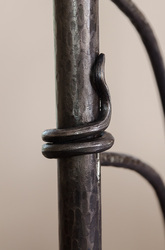 The very tips of the curls were given a slight fishtail feature. 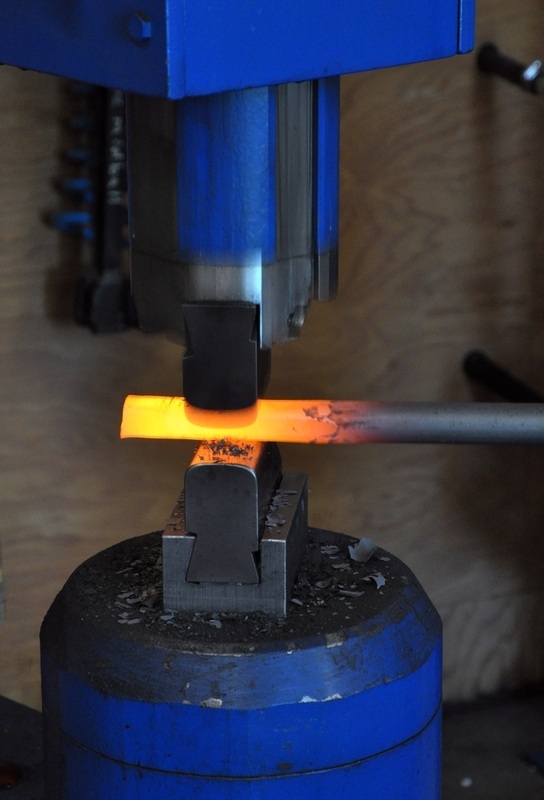 Heavy stock like this gives off quite a bit of radiant heat when being forged. 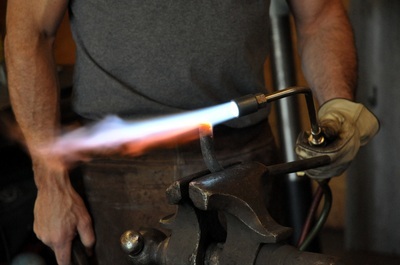 I rarely have to pull out my super duty welding gloves, but this was one time when I was happy to have them! Overall size was 13" x 12". 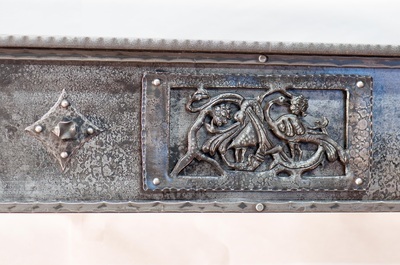 This commissioned old world fireplace mantel piece features 3 hand-chiseled panels. 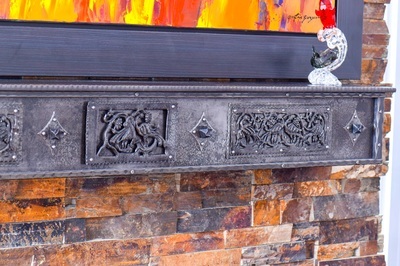 The two panels on the ends are themselves first mounted to a backing panel then riveted to the heavy face of the mantel. 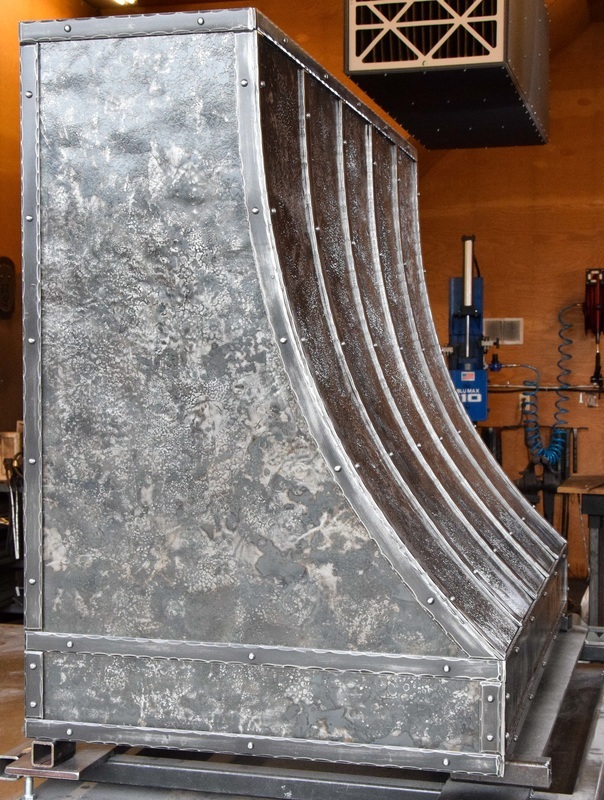 The center panel is also riveted to the face but is raised slightly from the surface. The marble-like surface patina for the heavy plates on the face, bottom and sides was created using a technique that utilizes the coals of a raging hot forge. 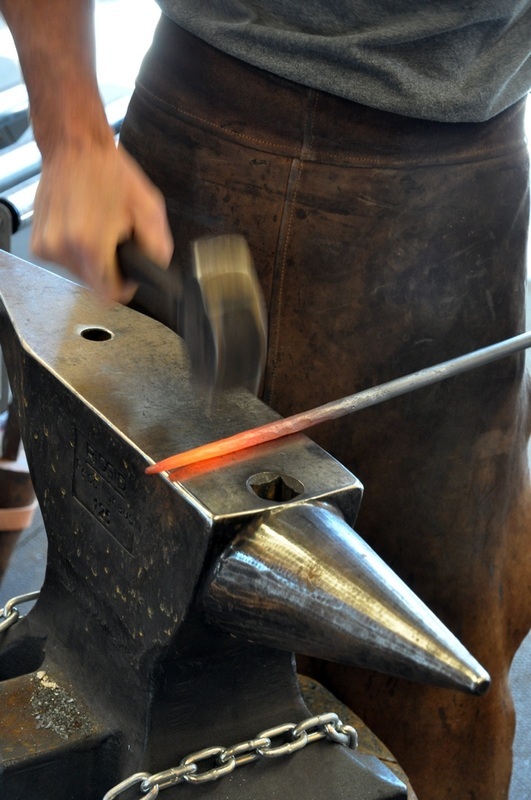 This pushes the forge to its extreme limits - well beyond any normal forging heat. 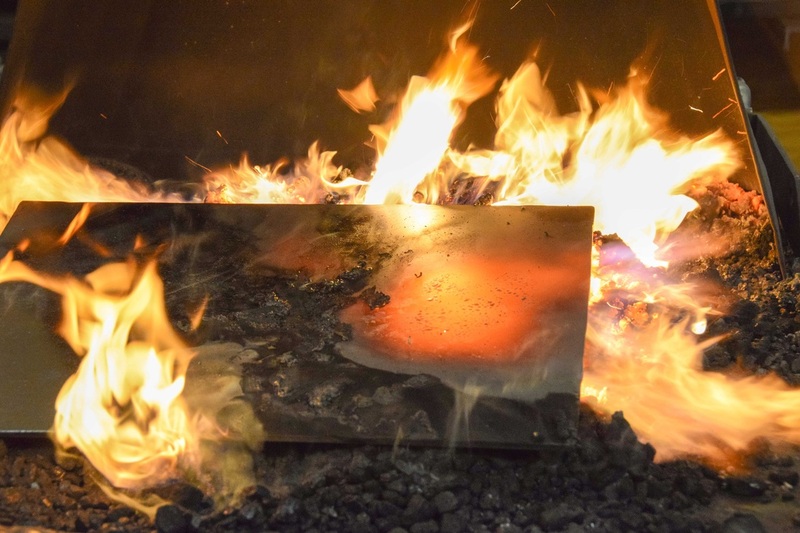 The panels had to be soaked in the coals at this temperature for the scaling to form. Afterwards, all panels were hand sanded. 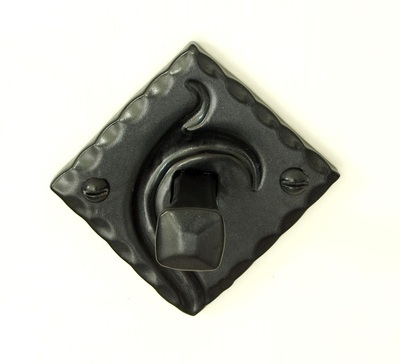 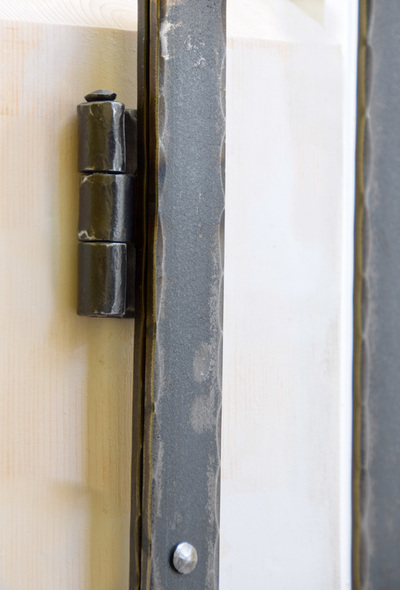 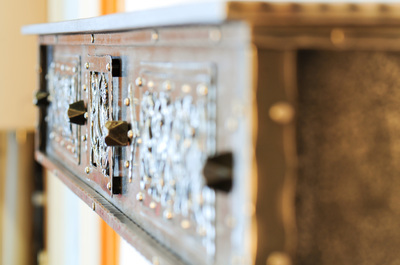 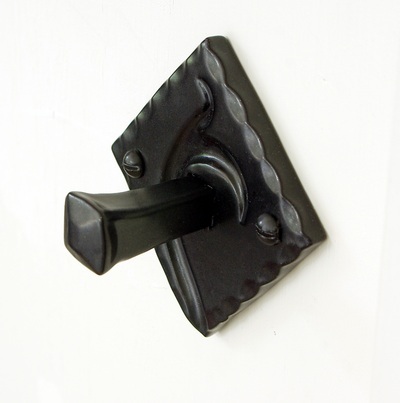 The fully functional mounting bolts feature hand-forged heads with decorative escutcheons. 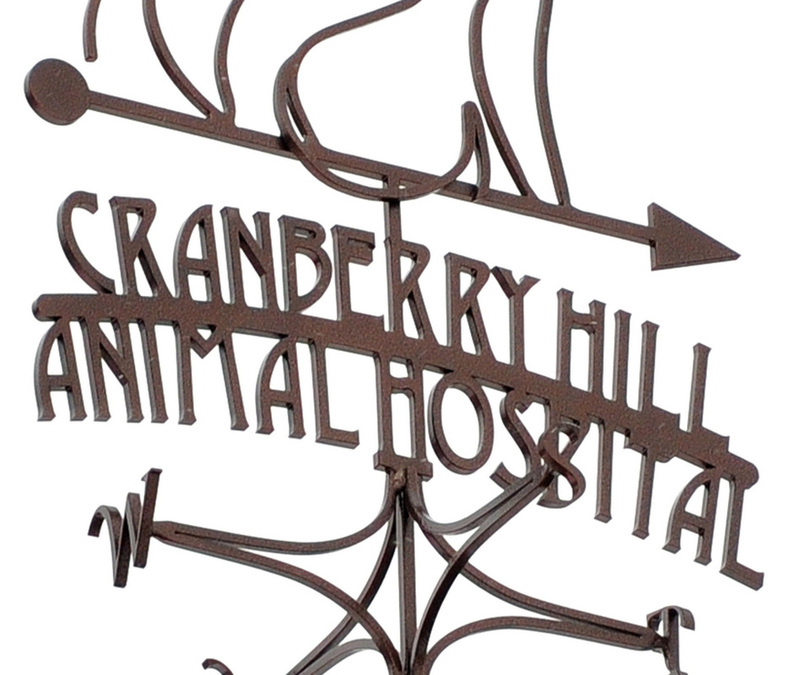 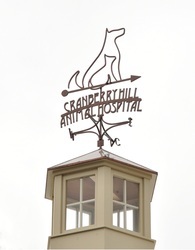 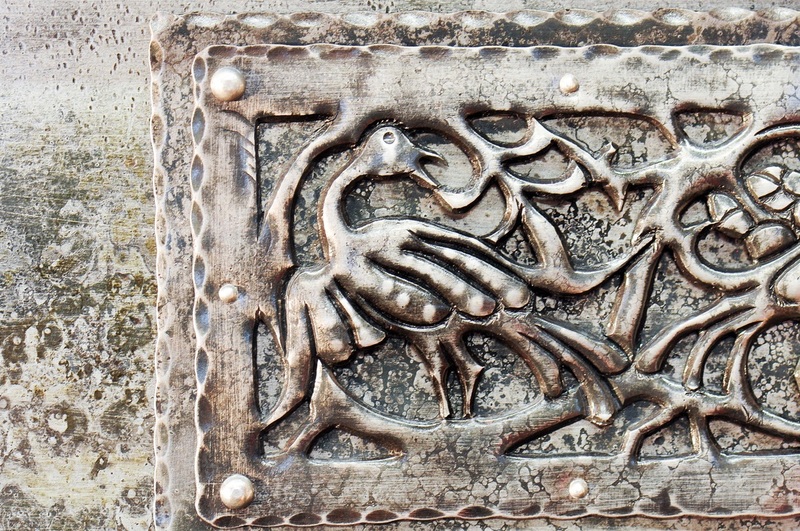 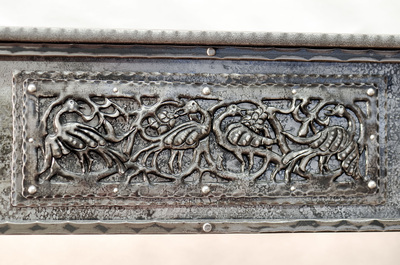 The peacock features on the panels were inspired by a study of the Samuel Yellin chasing / repoussee work for a letter box that was originally crafted in 1929. The techniques I used in my forge to create these panels would have been the same as those employed 85 years ago: treadle hammer and chisels with some no wider than 1/8". 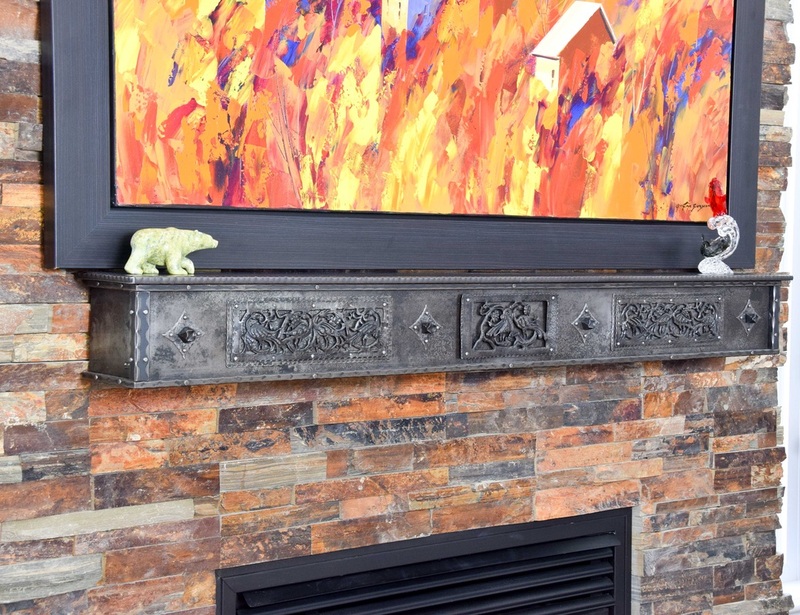 Click on the thumbnails below to see more detailed pictures of this mantel. 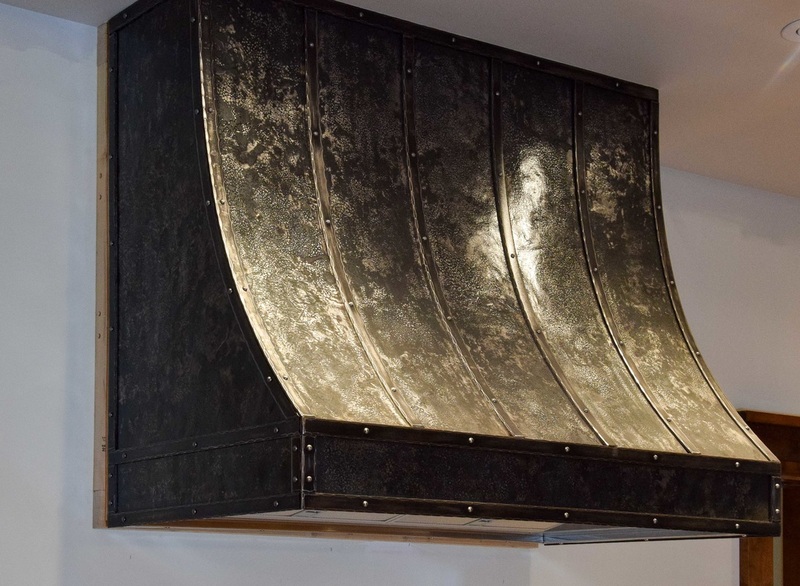 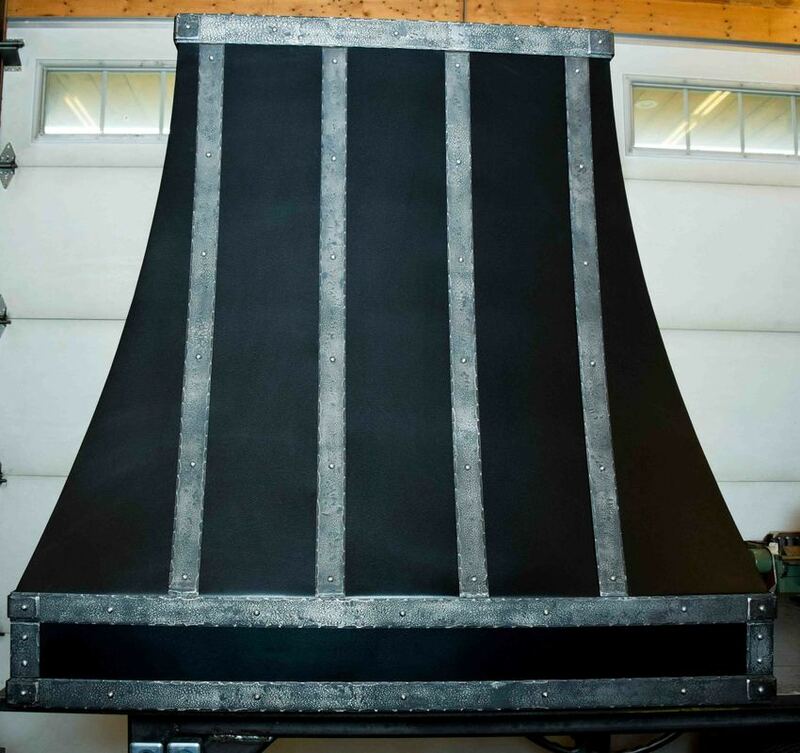 At 52" tall by 53" wide, this all-steel large custom range hood features a double french curve profile with fully welded seams along the length of the corners. 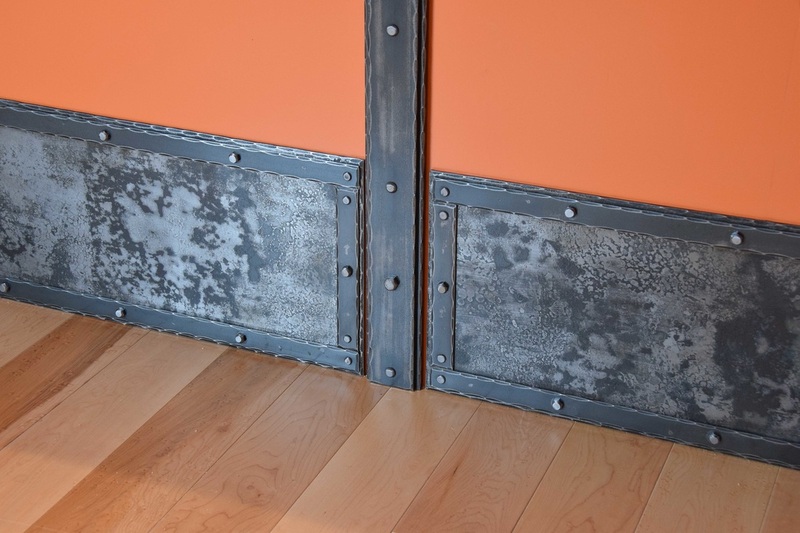 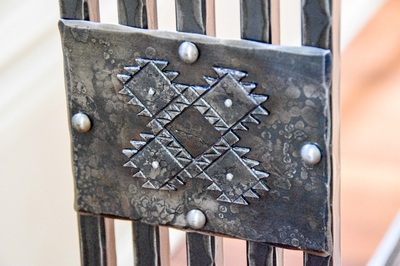 The trim is hammered and textured steel. The main body is powder coated paint. There is a purchased insert which fits inside the hood to handle the exhaust and lighting functions. This custom hood measures 42" wide x 35" high. 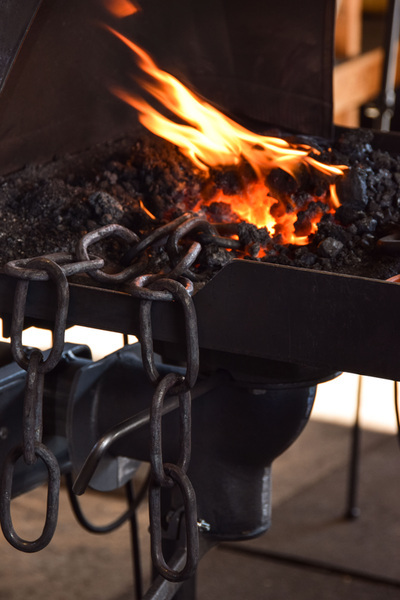 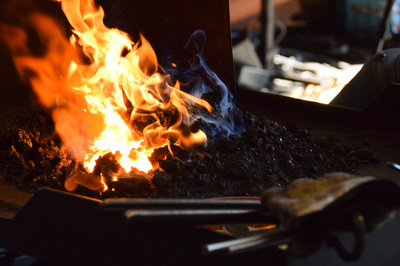 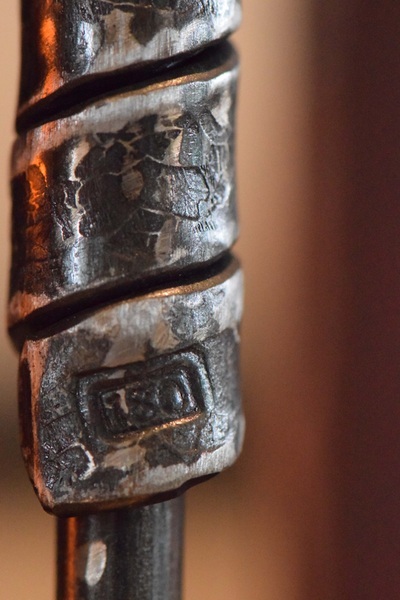 The patina is brought about by soaking the steel in extremely hot coals. Too much localized heat and the steel would burn. Not enough and the scale would not form. 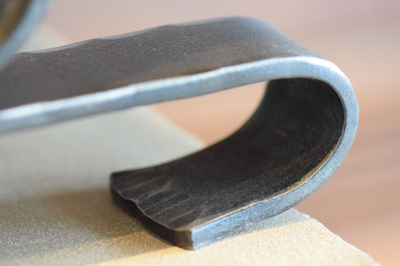 When it's just right, it forms a unique scale on the surface which gets hand-sanded then sealed. 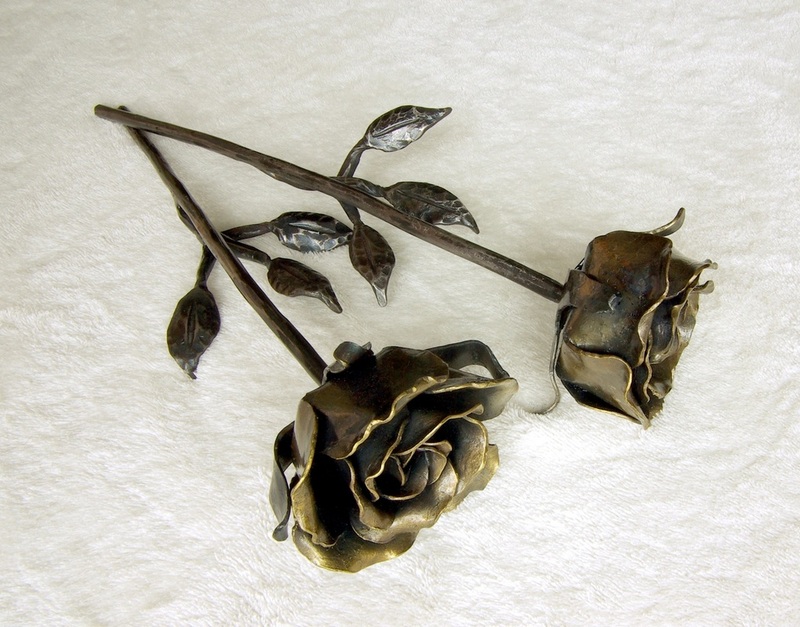 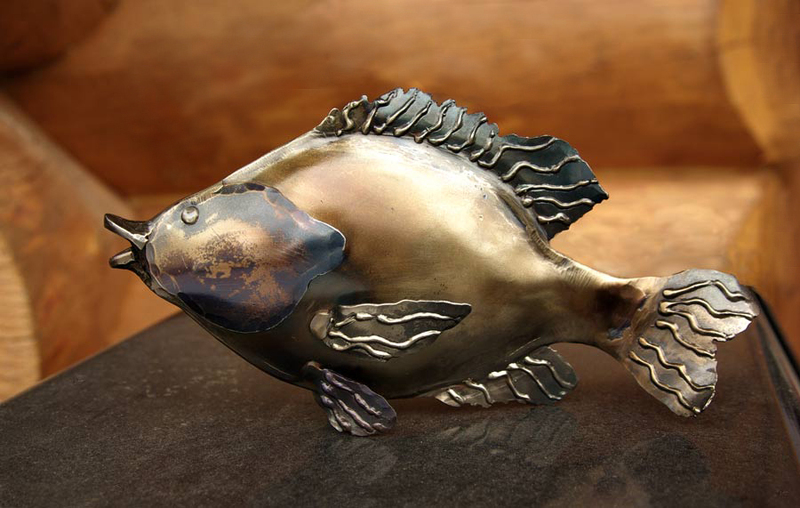 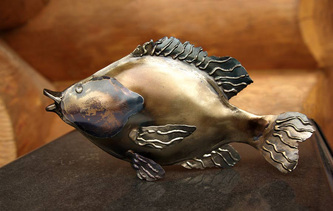 The idea is to create a patina that compresses hundreds of years of natural iron weathering down to a few days of effort. 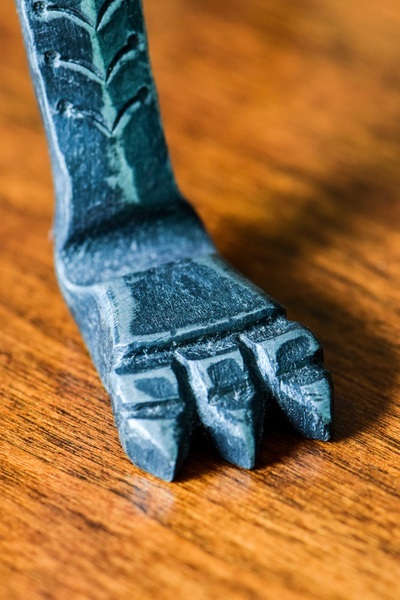 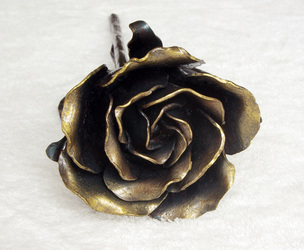 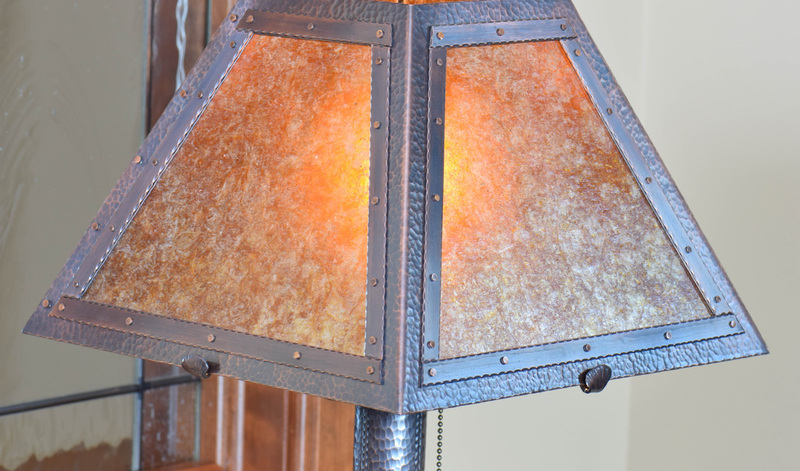 The richness of this patina is simply not available from any source other than a blacksmith's fire. 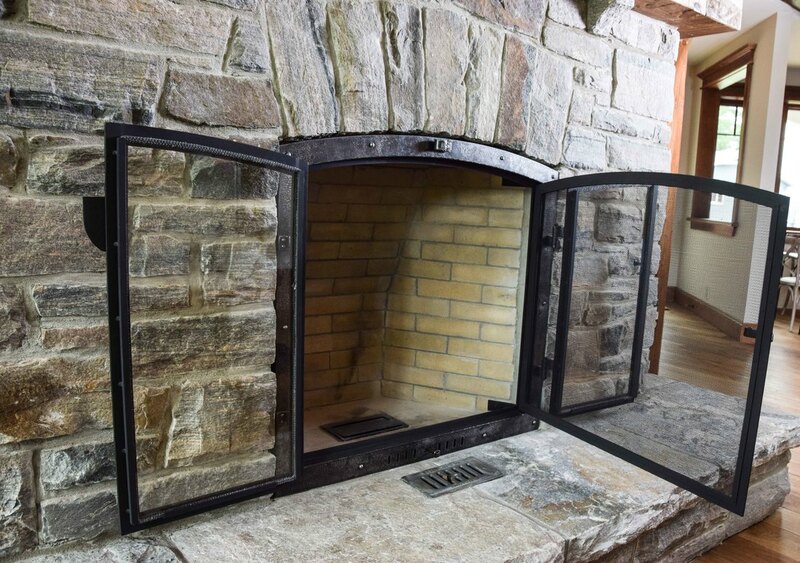 There is also a purchased insert which fits inside the hood to handle the exhaust and lighting functions. 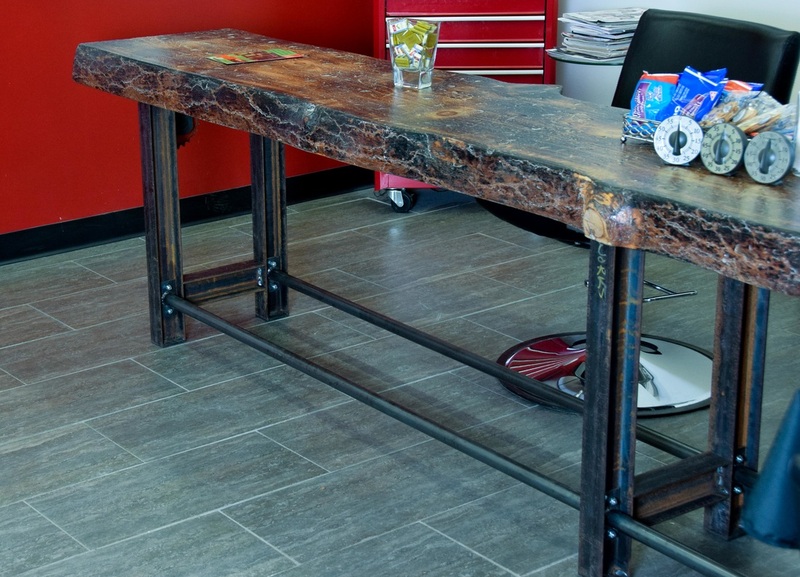 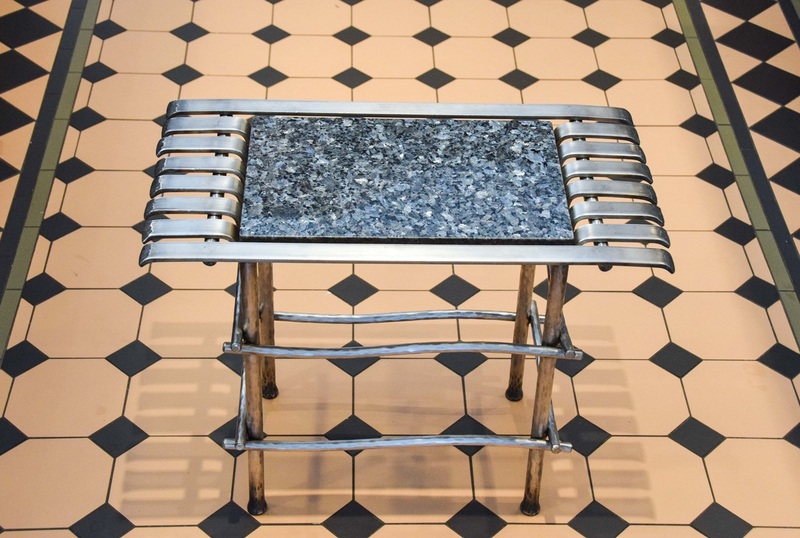 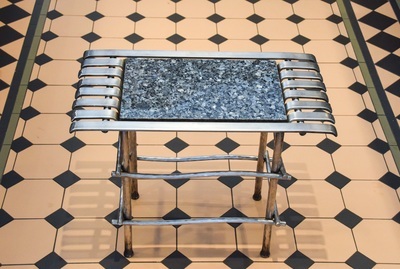 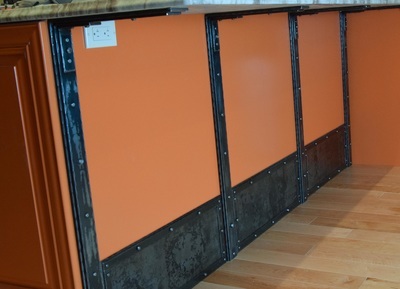 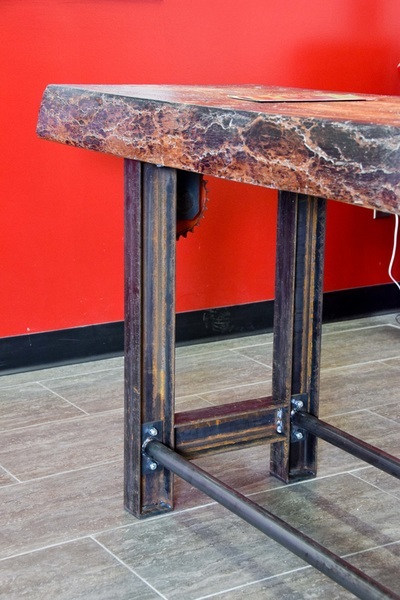 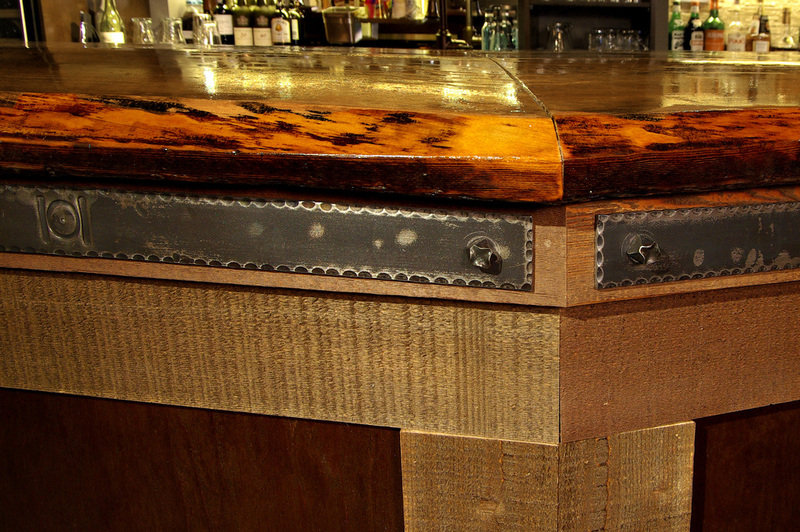 The granite counter supports feature layered, riveted steel. 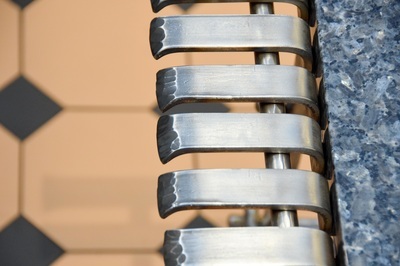 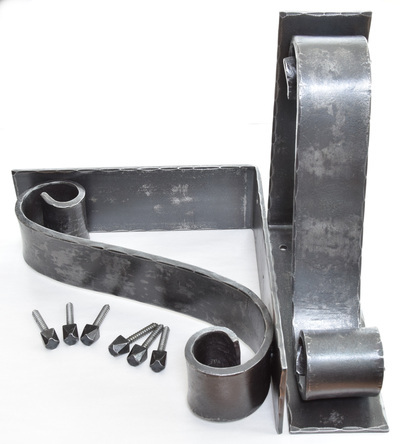 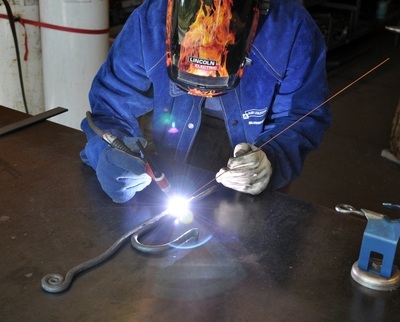 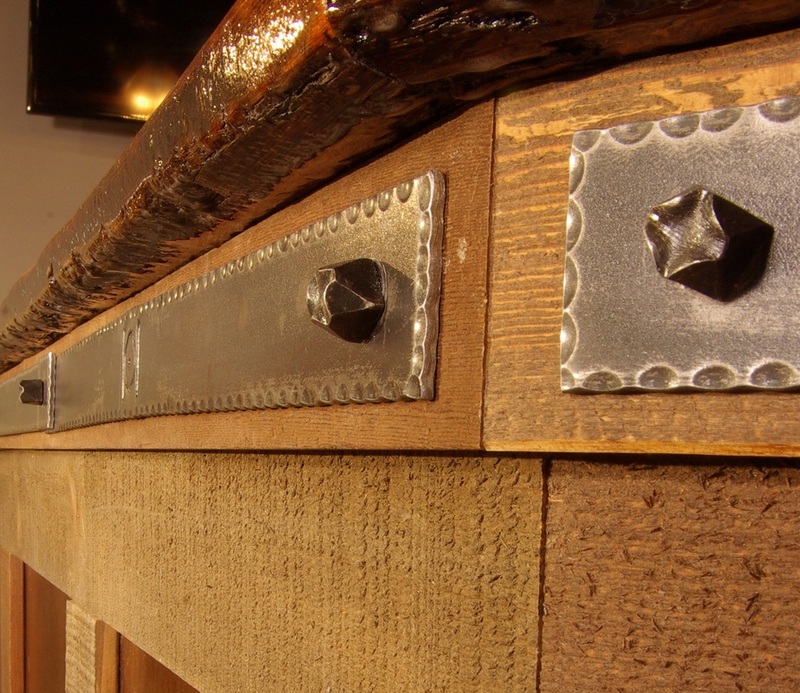 Hand-crafted bolts carry the riveted look to all fasteners. 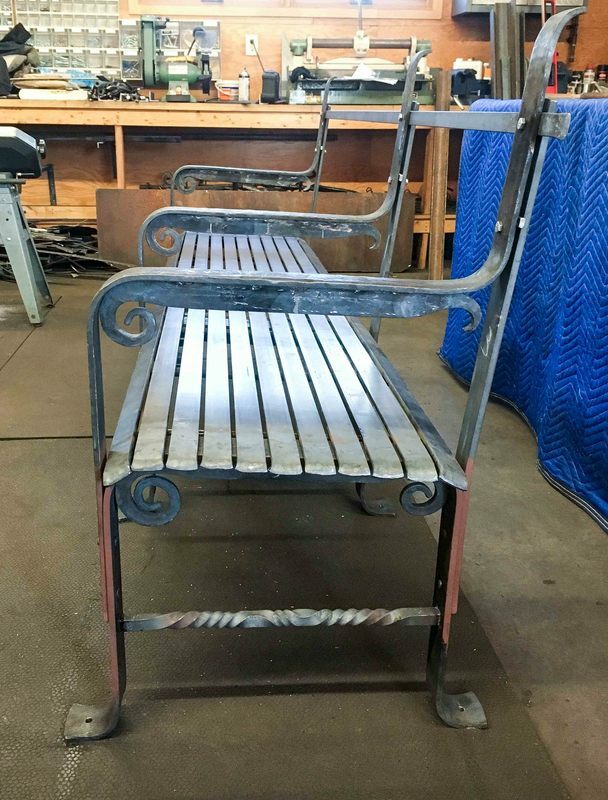 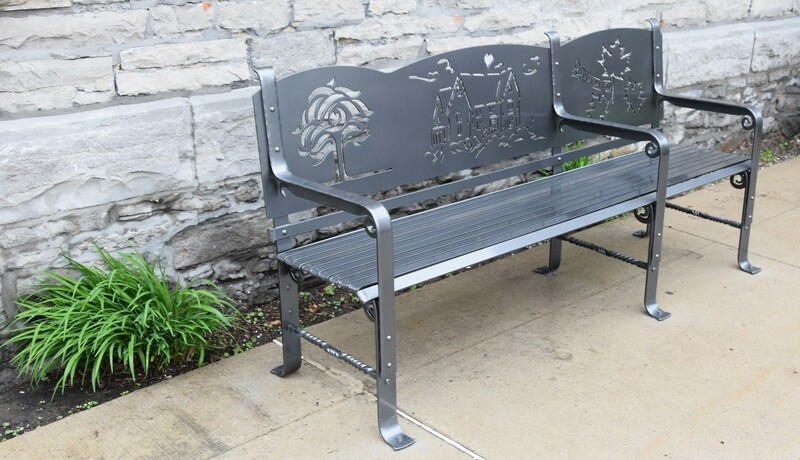 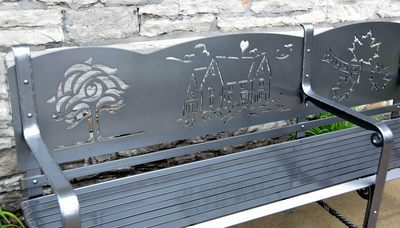 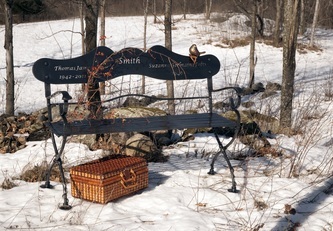 This 3-seat bench was commissioned by The Glebe Centre in Ottawa for the front of Abbotsford House through a grant from the provincial government. 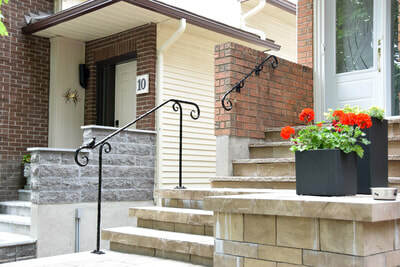 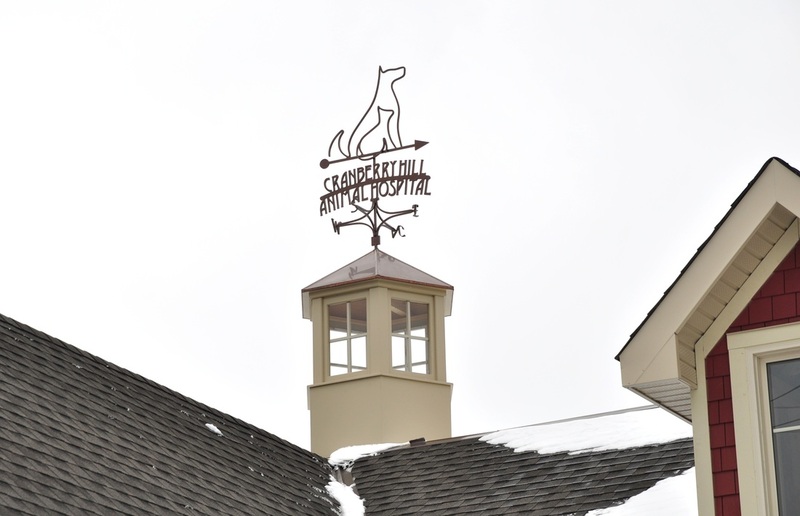 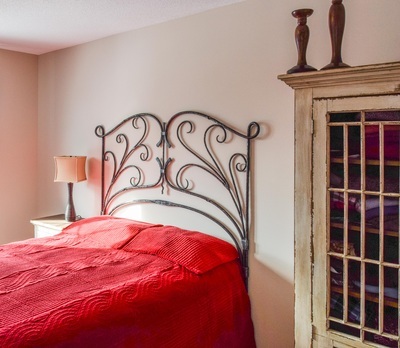 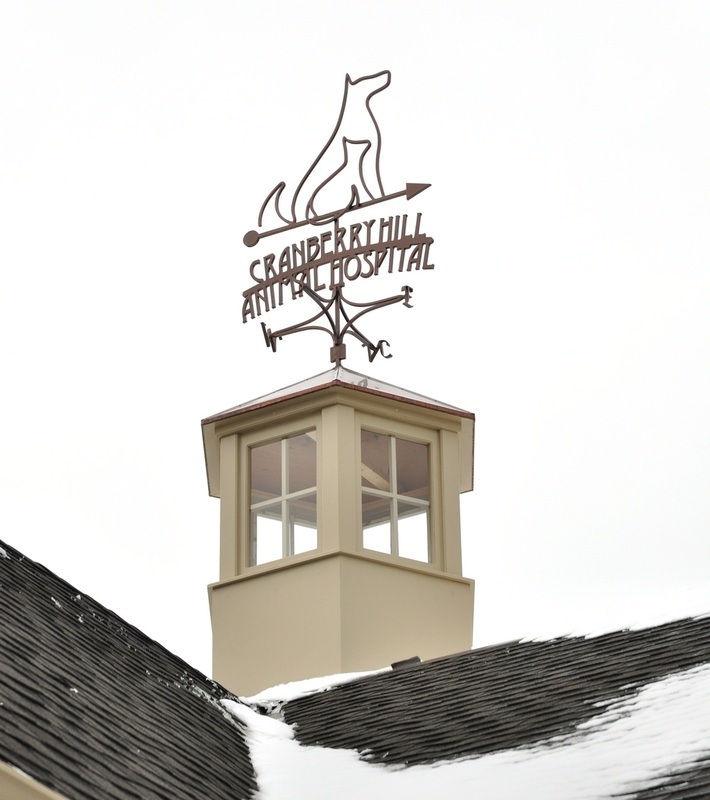 The Glebe Centre provides long-term care and serves seniors living in the community by offering programs and support services for adults aged 55+. 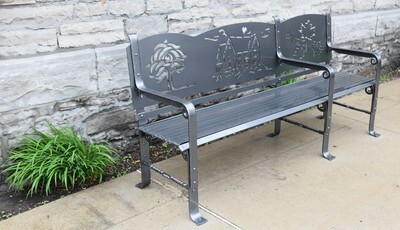 The design was a collaborative effort between my shop and the seniors who contributed the artwork for the backrest. 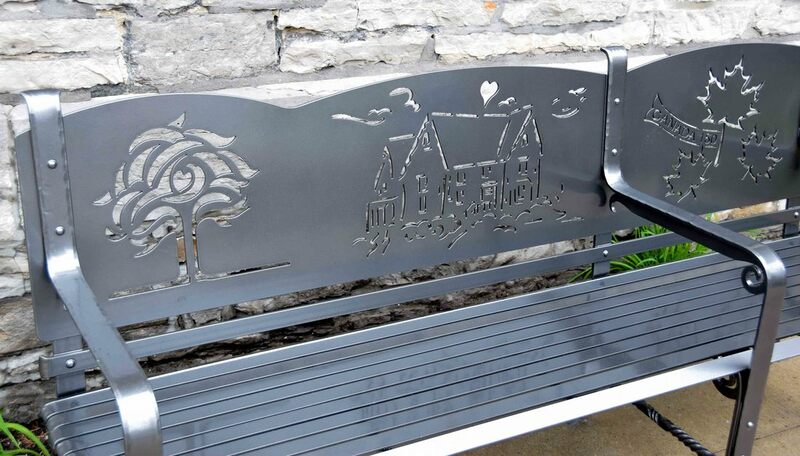 The artwork represents the Glebe Centre’s logo with the tree found on the left side of the backrest, the historic building of Abbotsford House found in the centre and maple leaves and banner commemorating Canada’s 150th on the right. The pictures also capture some of the process involved to create the bench. 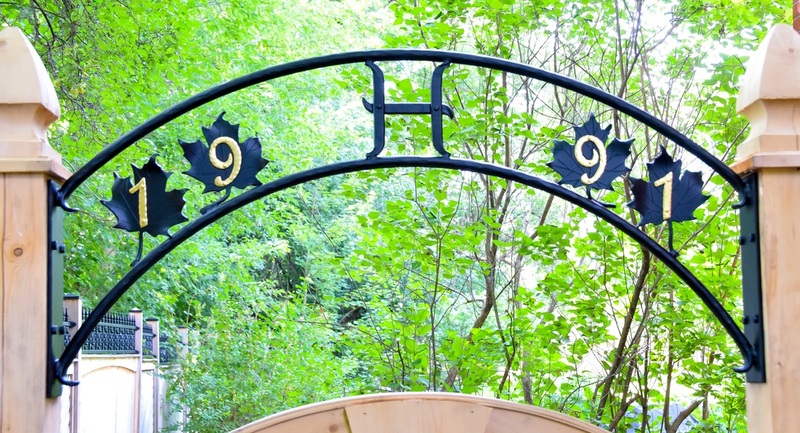 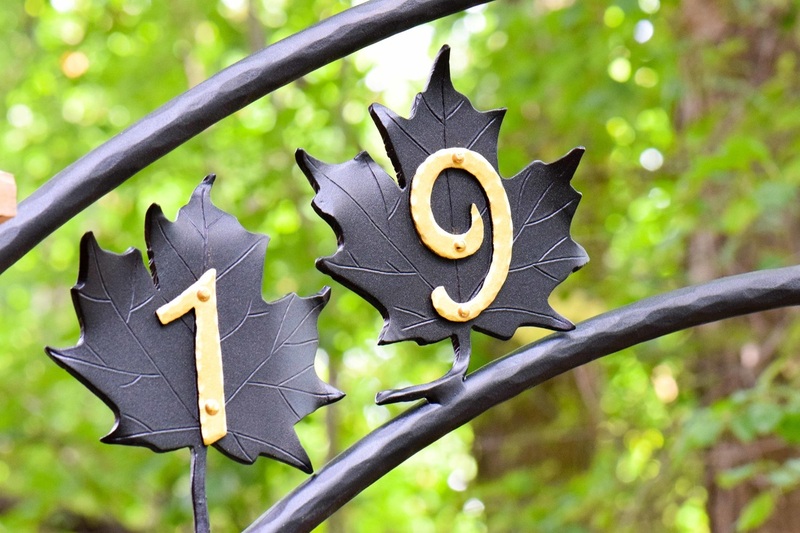 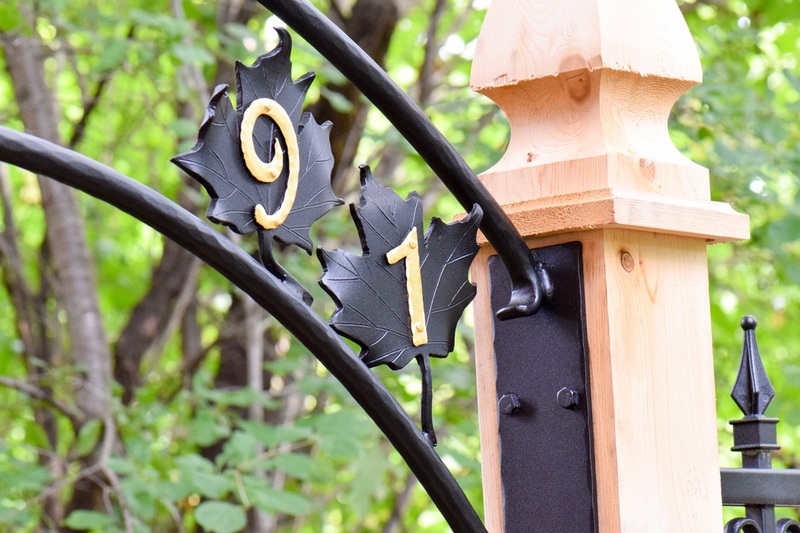 This forged gate arch features 23k gilded numbers on maple leaves and the initial of the client's last name in the centre viewed from either side. 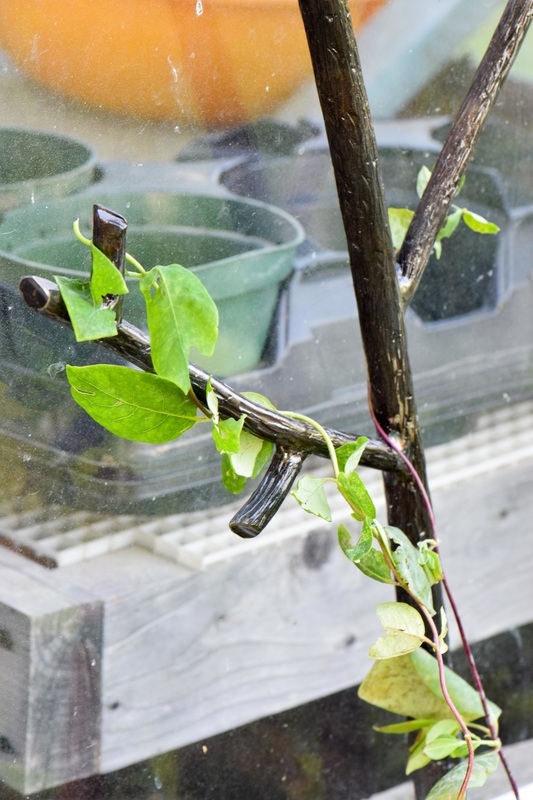 The client came to me asking what I could do to include her love of knitting into a trellis for her garden shed. 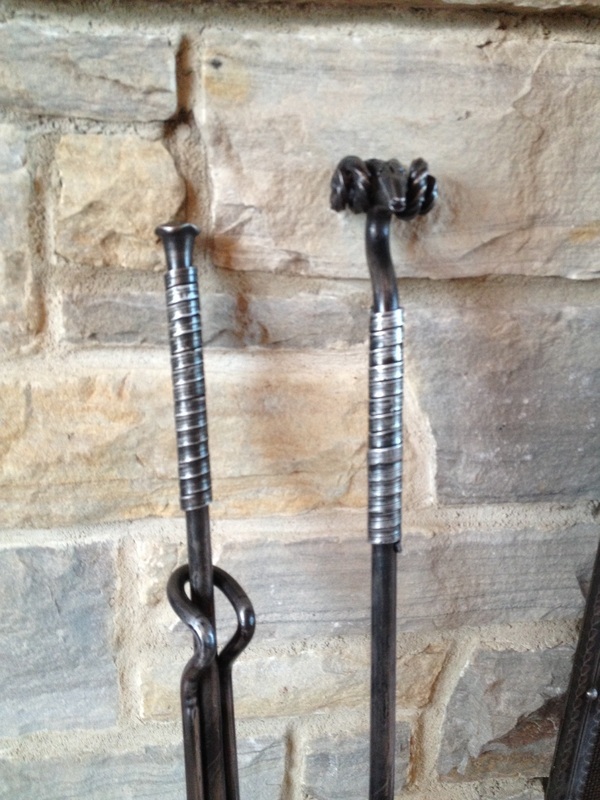 Knitting... with iron?? 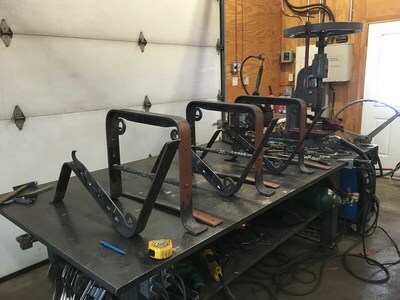 This was going to be a fun challenge! The inspiration came from sifting through a huge stack of the client's magazines and reference books. 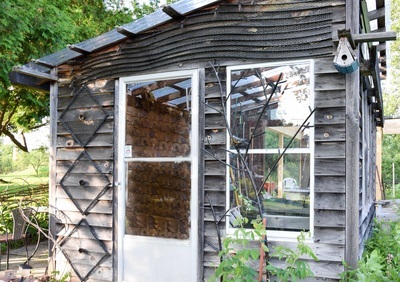 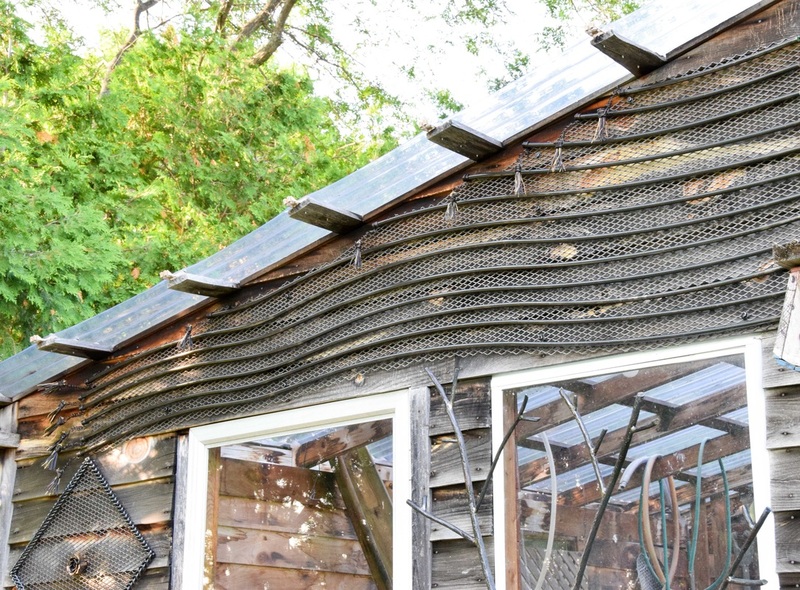 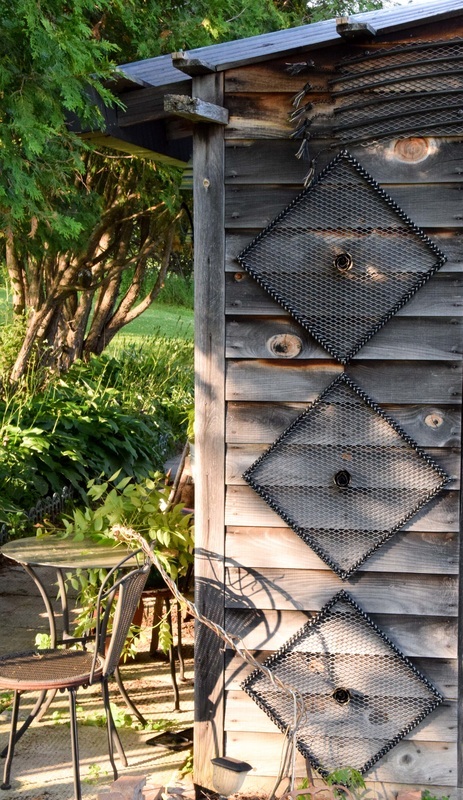 The three argyle pattern elements on the left of the shed feature braided bars for the frame, expanded steel as the knitted background and a central rose. 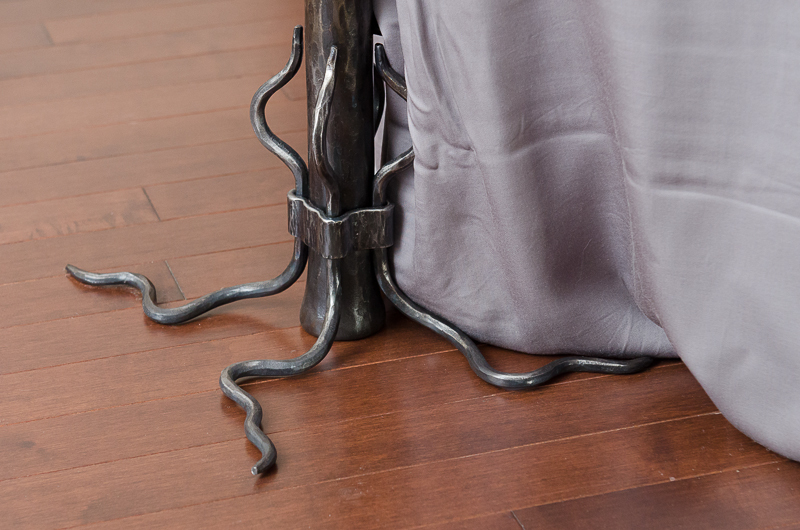 The top element is an 8 foot long flowing scarf with tassels of steel, copper and bronze. 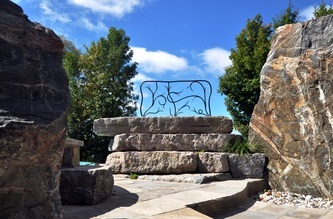 The tree elements on the right were forged from solid bar and feature a nest and bird. 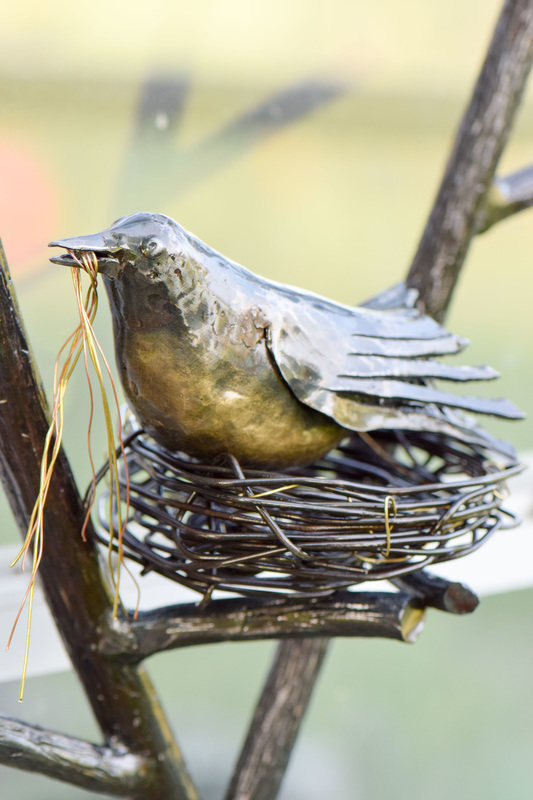 The bird has been naughty though as she has stolen a few strands of brass and bronze for her nest. This was yet another perfectly enjoyable commission. 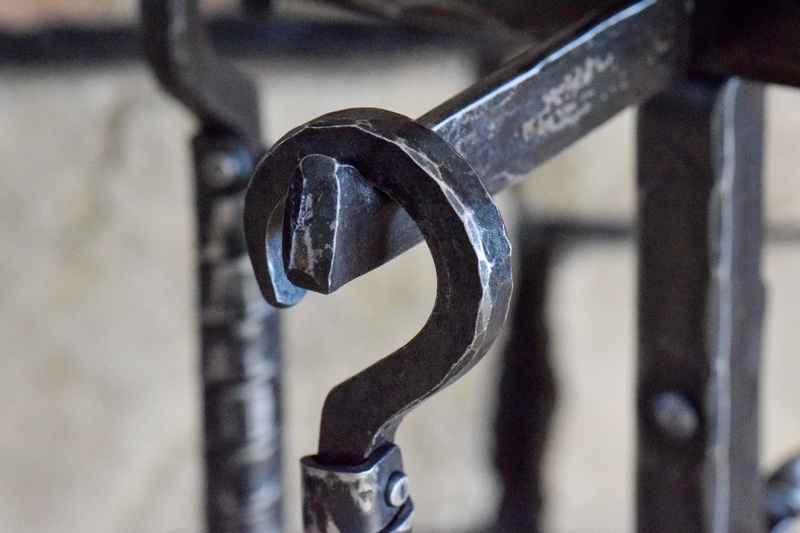 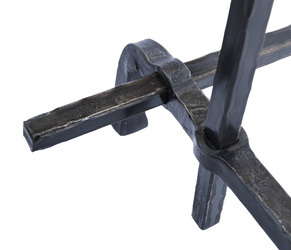 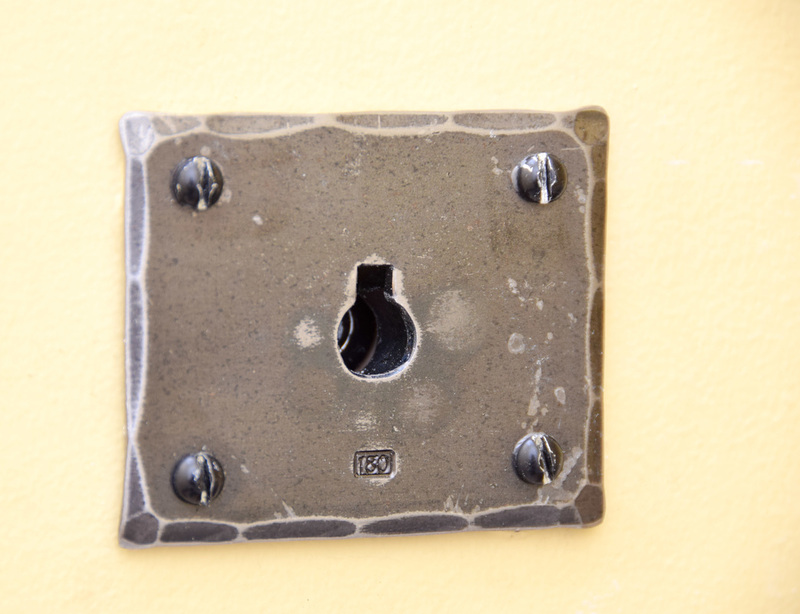 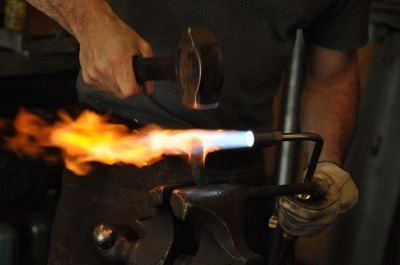 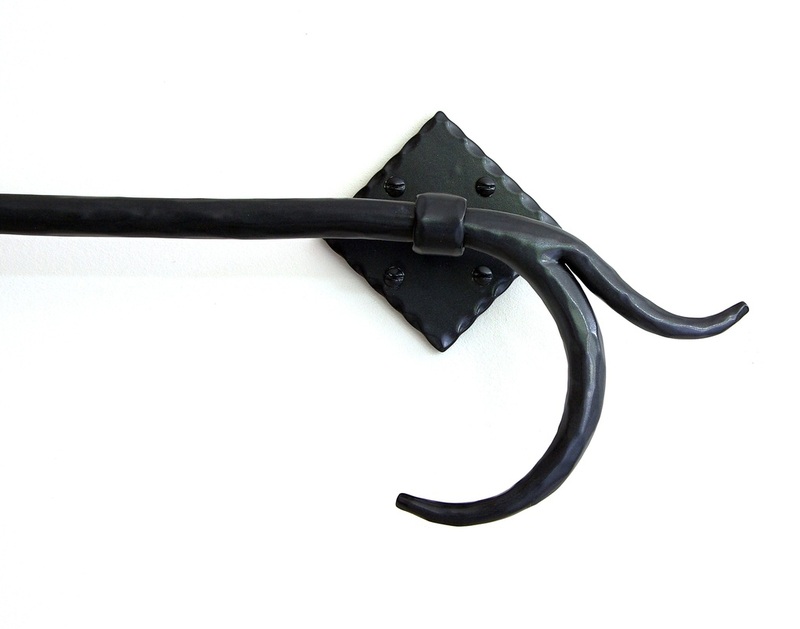 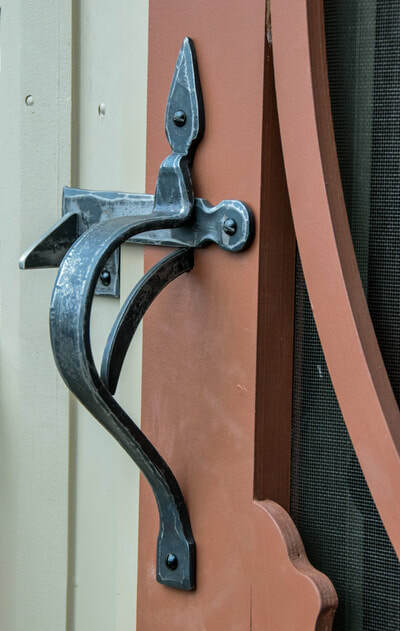 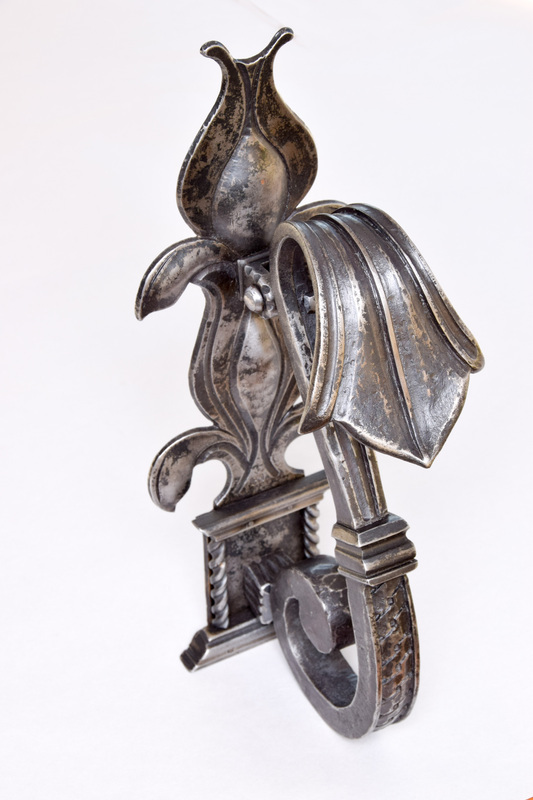 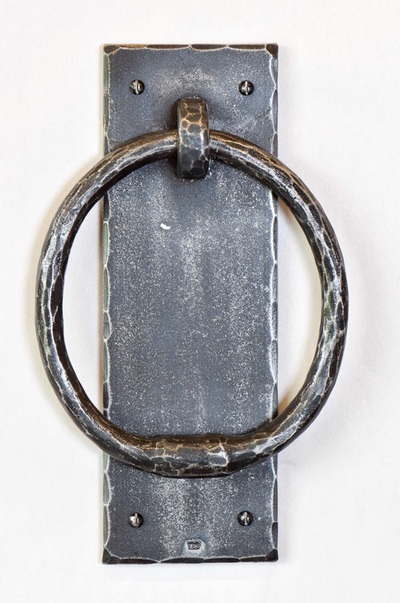 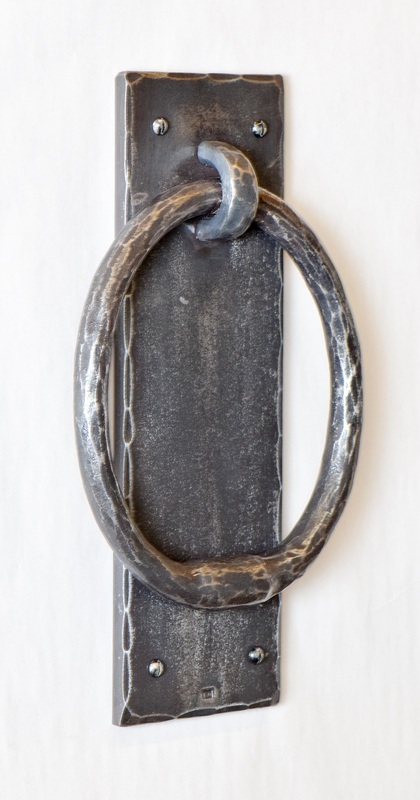 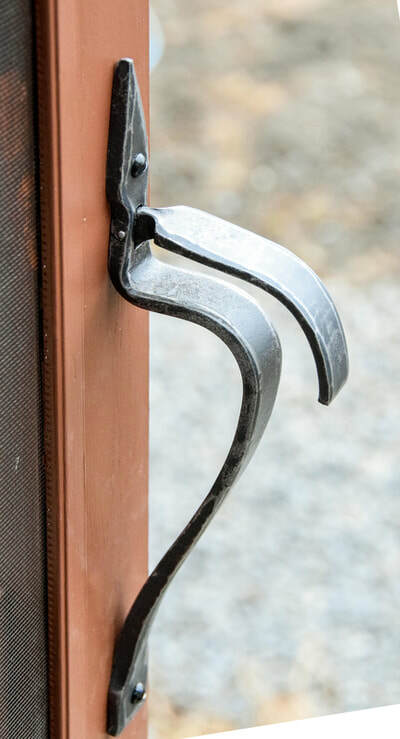 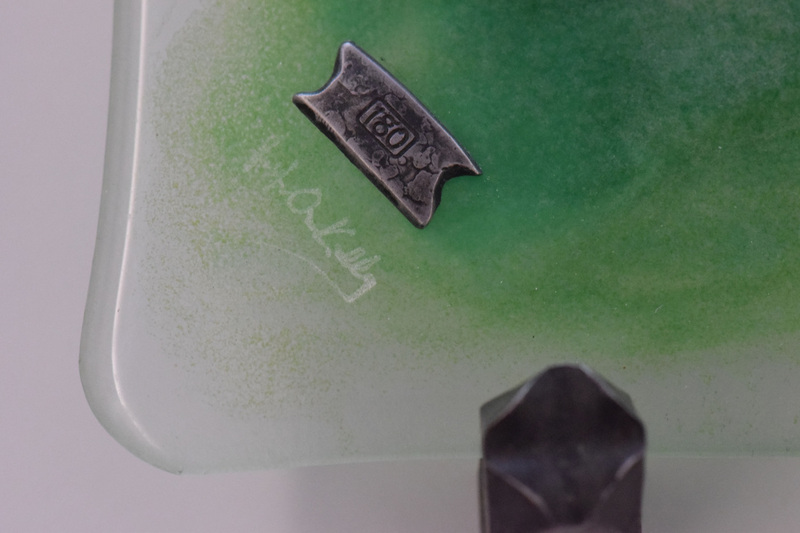 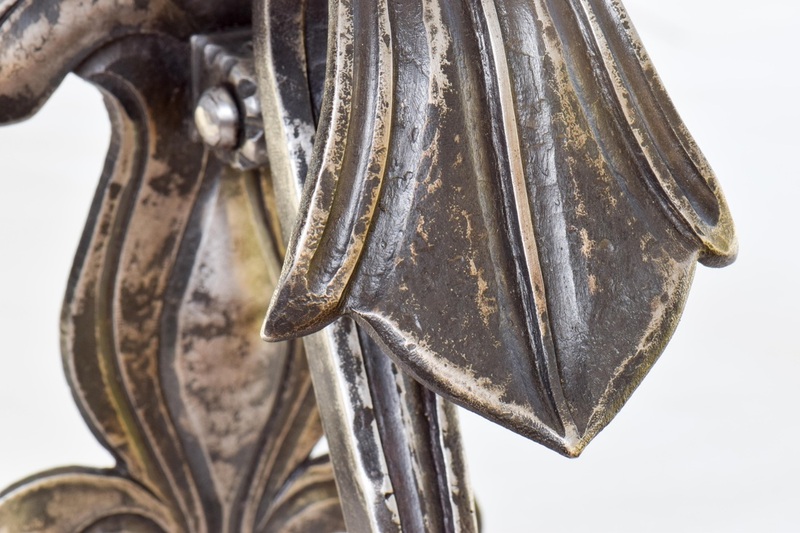 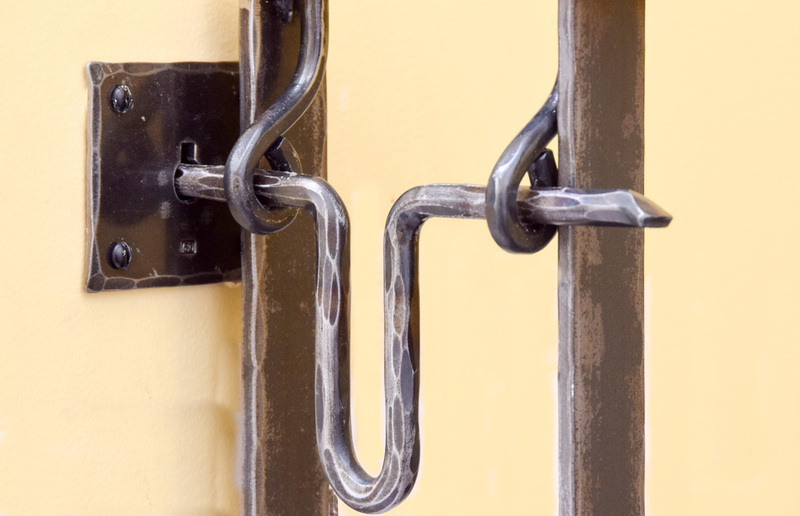 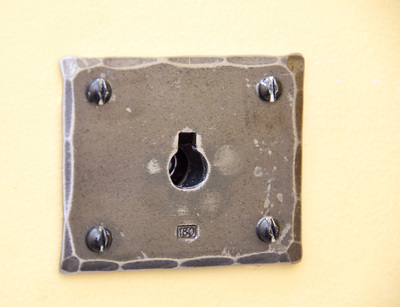 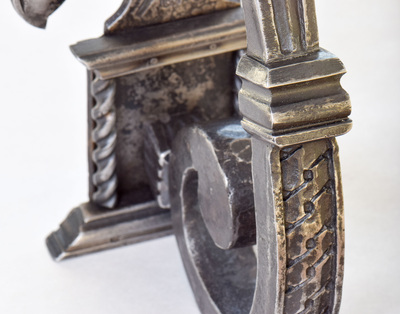 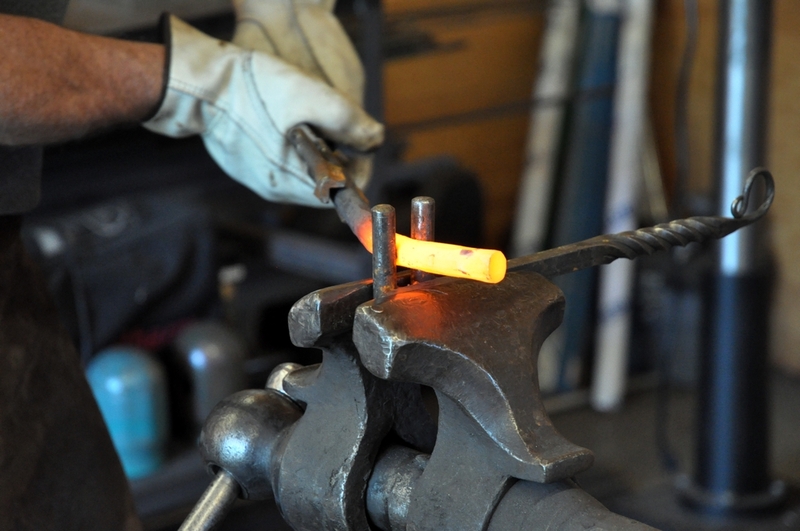 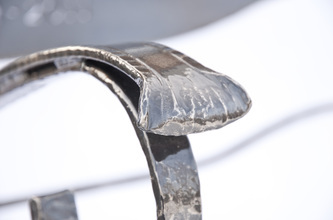 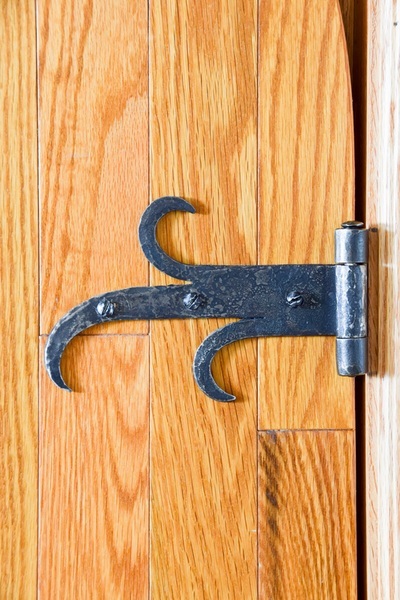 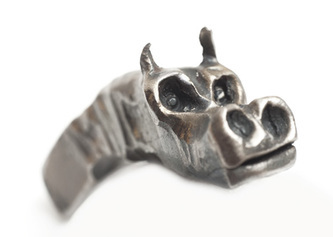 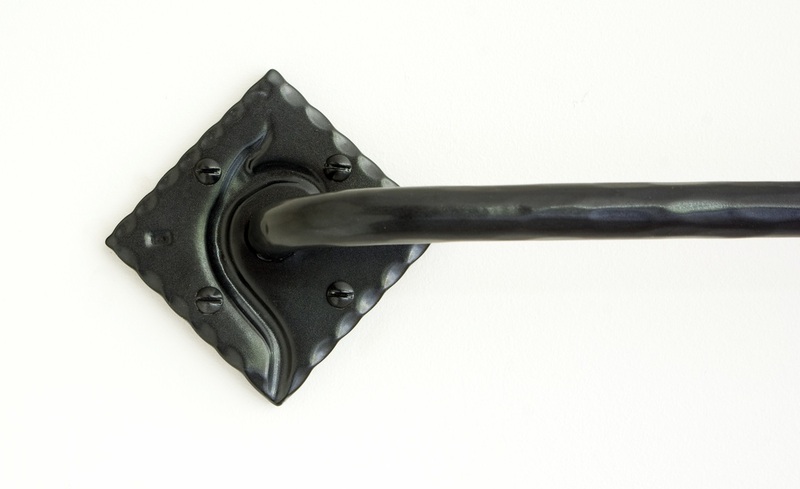 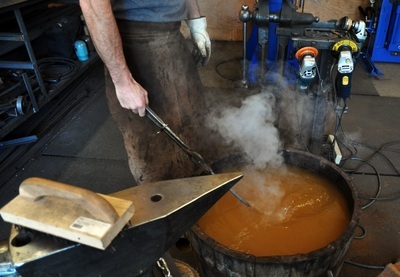 The knocker arm in its entirety was forged from a single, solid 1" square bar about 12" long. 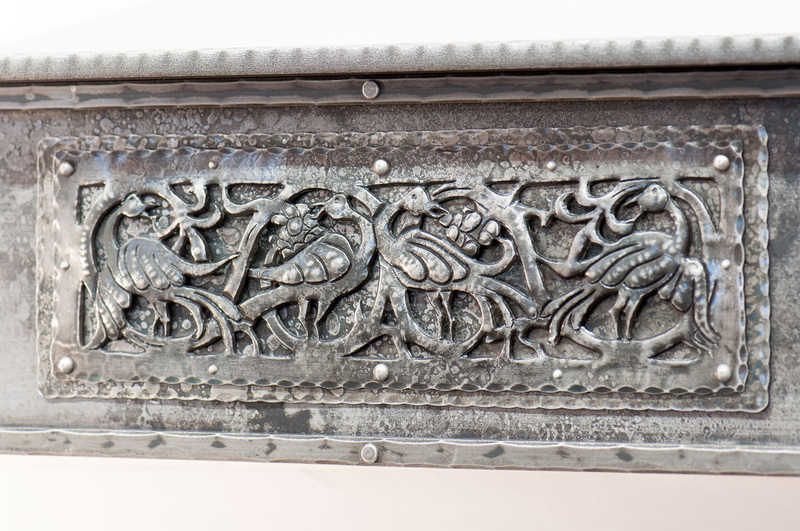 All of the detail was created by hand-filing and chisel work. 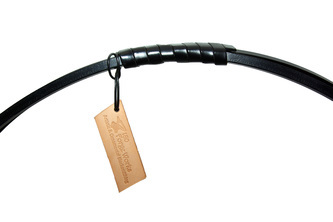 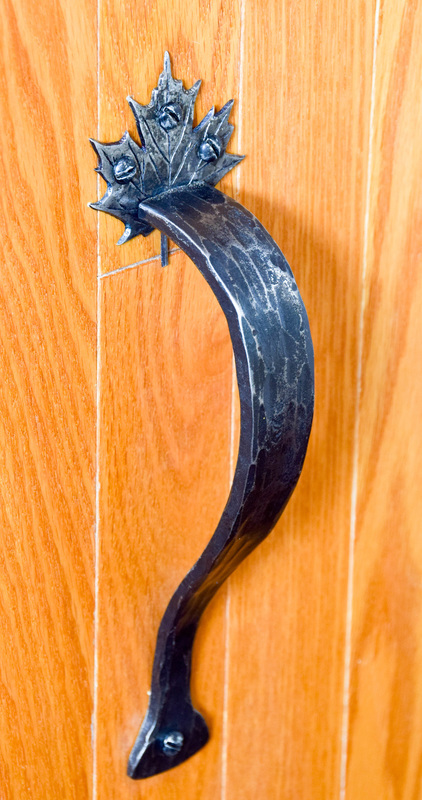 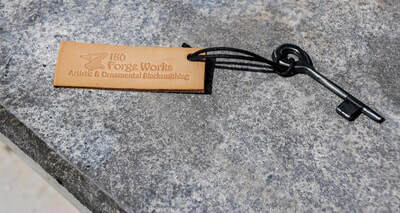 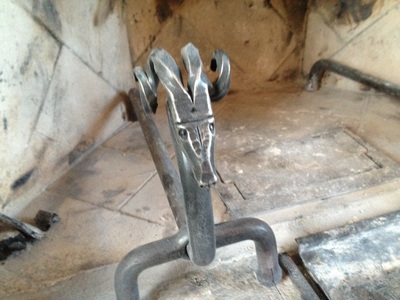 The last picture shows a sample of the original stock that was used for the knocker arm. This large ring knocker was commissioned by a local couple for their cabin. 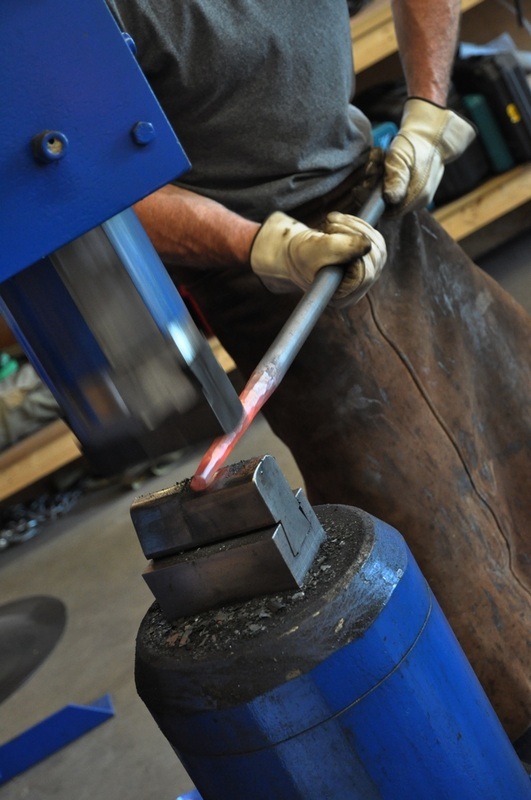 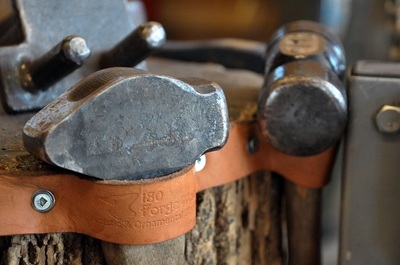 It measures 12" long and 7" wide with the ring forged from 1" solid bar. 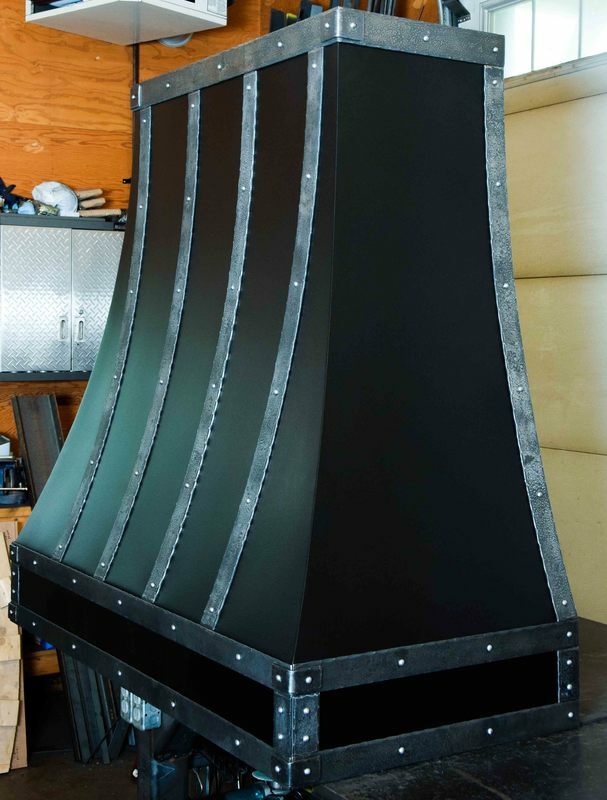 This bad boy will be heard throughout the house for sure! This door knocker was commissioned by a violin maker. 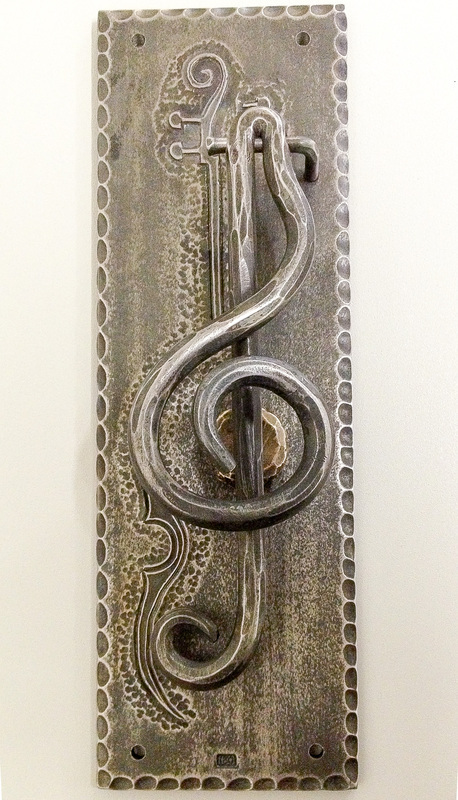 The 'button' is made out of bronze while the backplate and treble clef were forged out of iron. 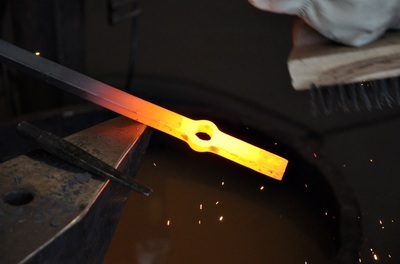 The violin outline was chased into the iron plate with a series of hand chisels. 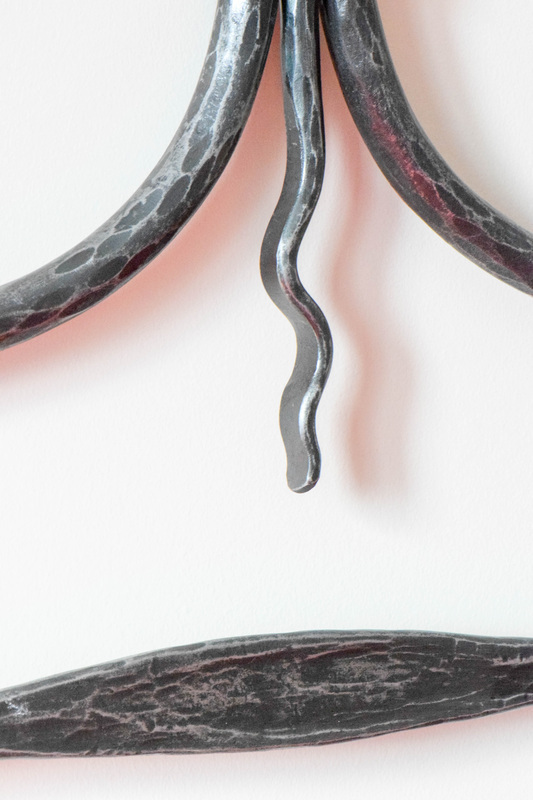 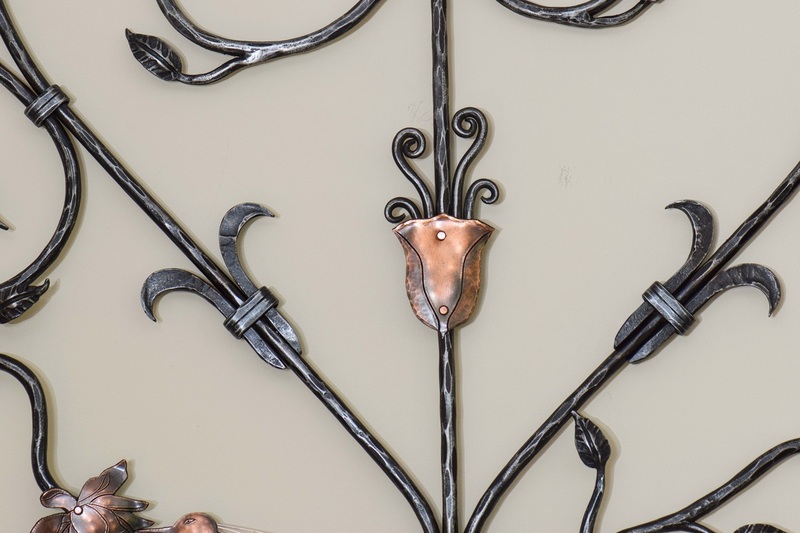 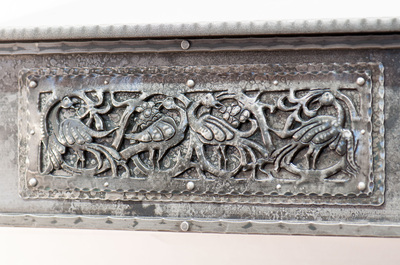 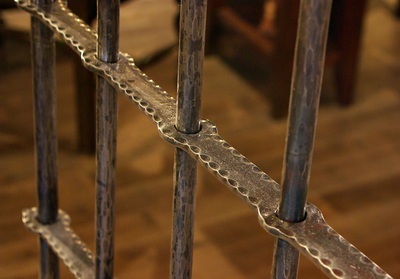 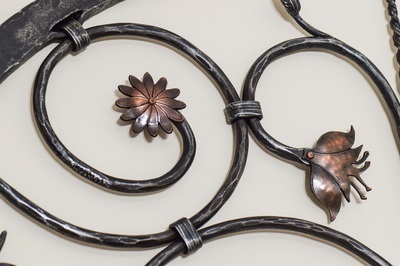 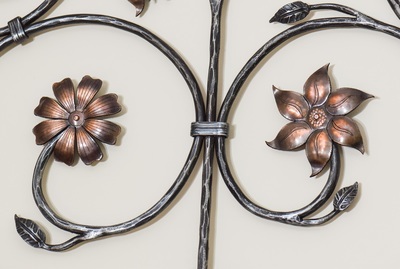 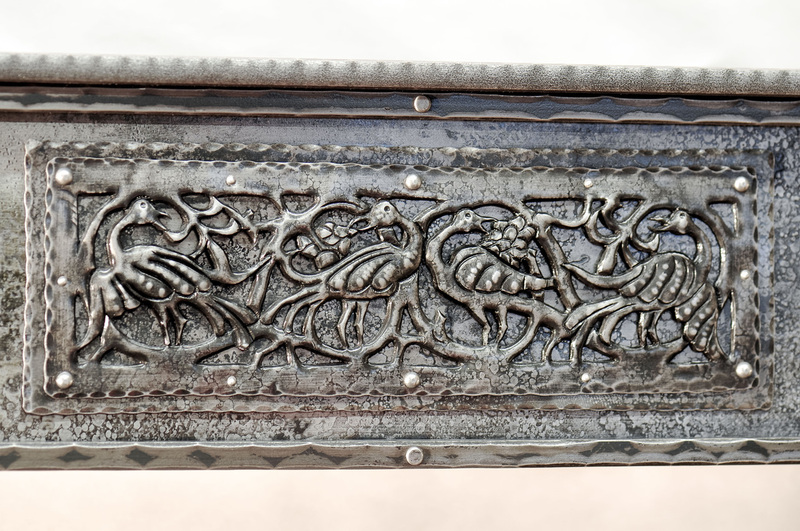 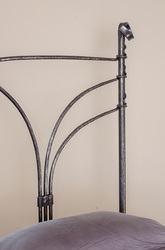 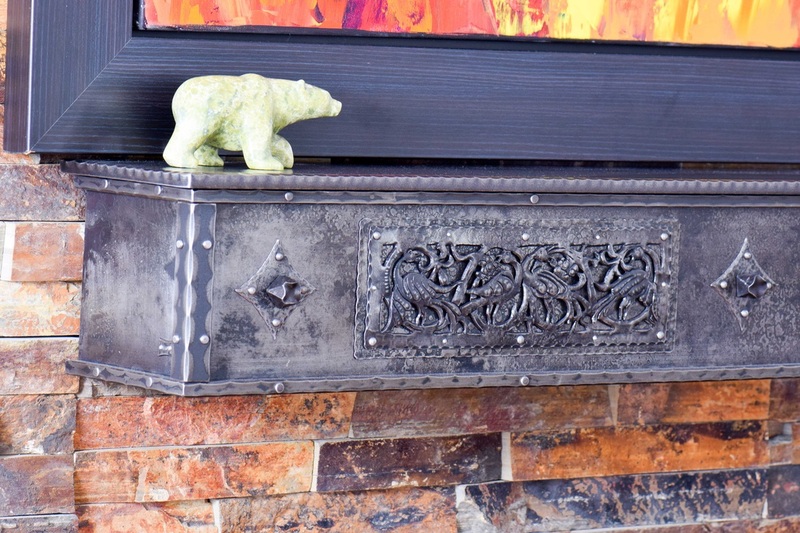 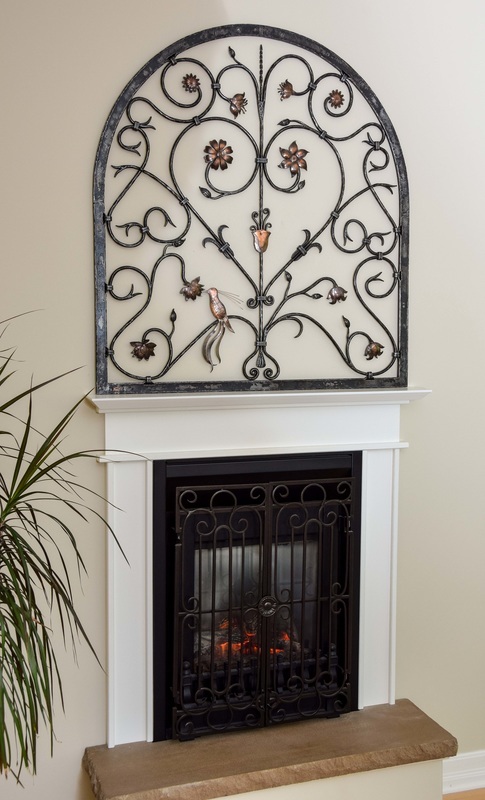 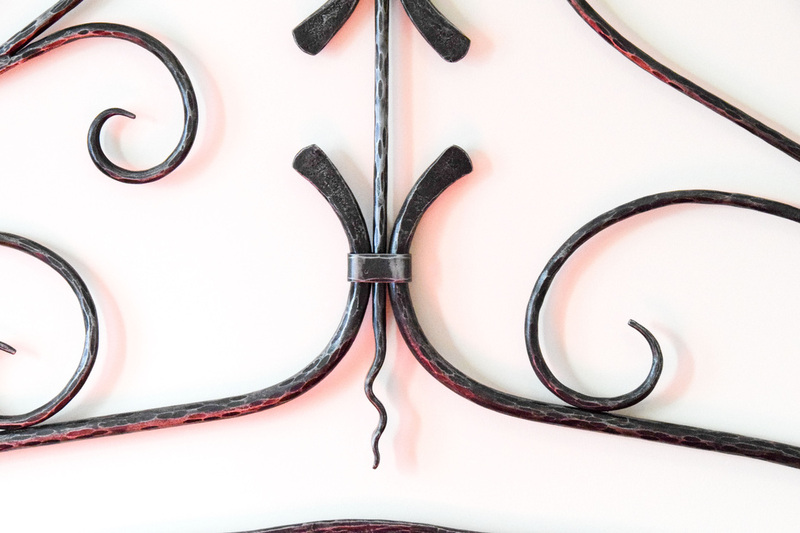 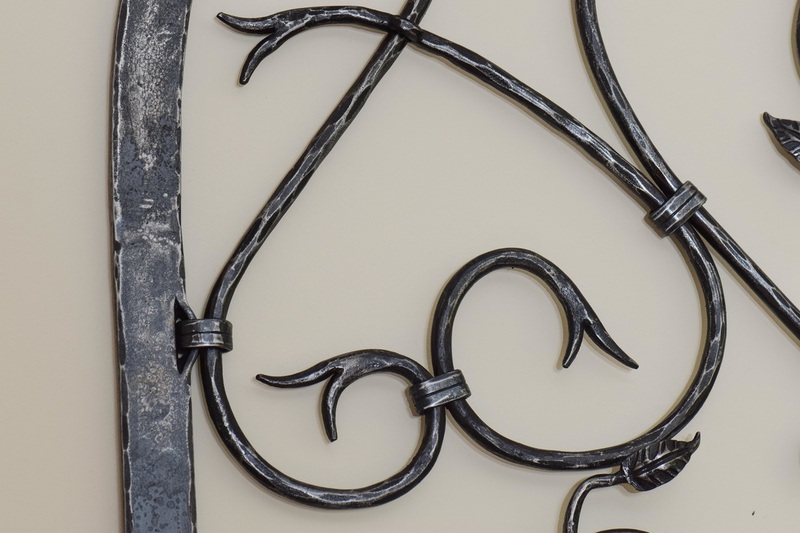 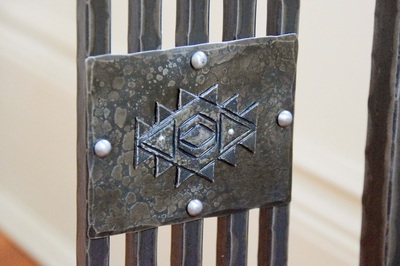 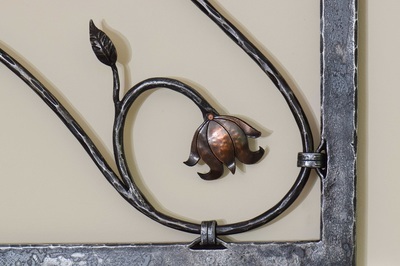 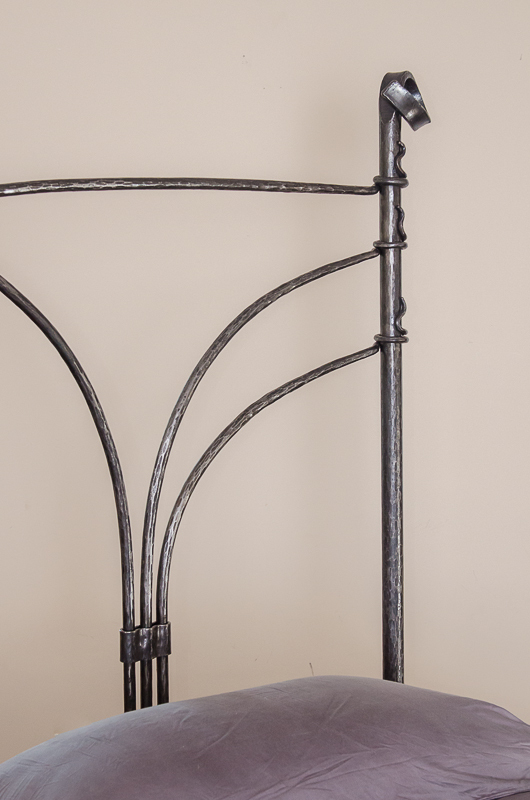 Inspired by an early Yellin piece, this decorative grille is forged from iron and copper. 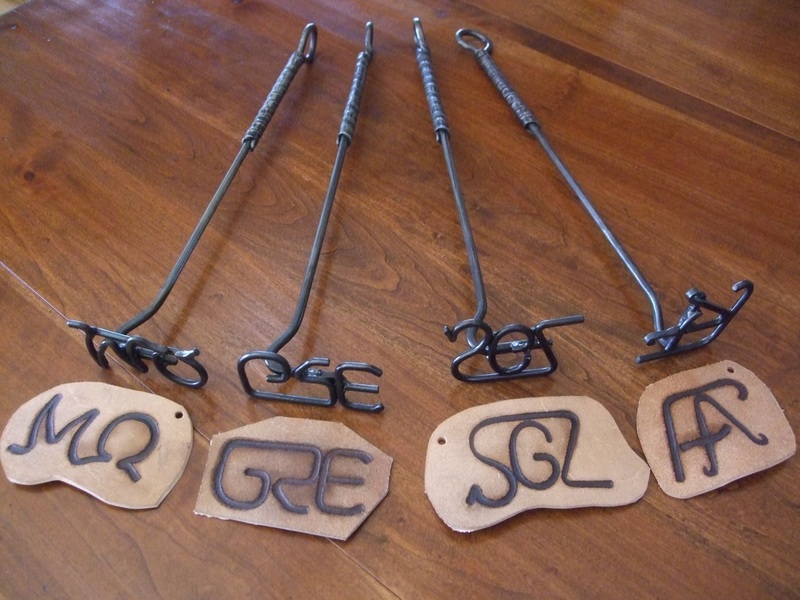 I would have liked to have kept this commissions for myself! This fully functional forged padlock design dates back to the 16th century. 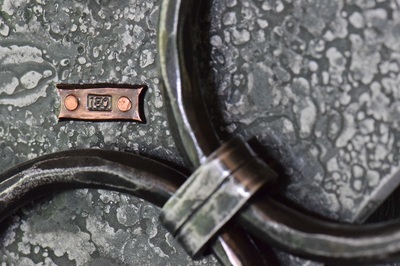 The warded padlock measures 4" on the side by 1" deep. 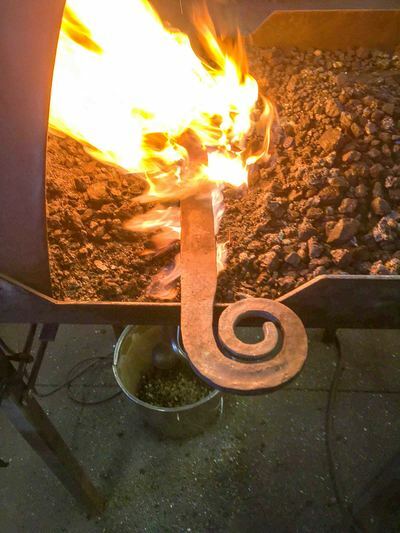 The key is comprised of 4 separately forged pieces (bow, collar, stem and bit) that have been fitted and then brazed together in the forge. 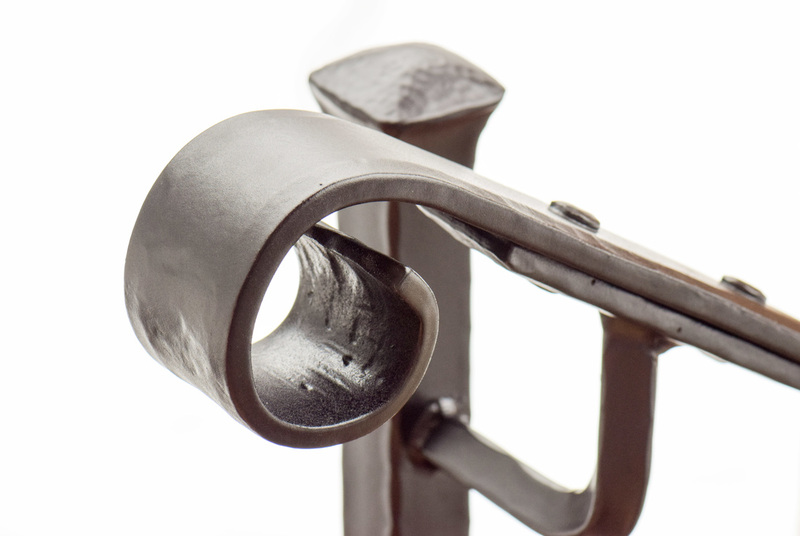 This padlock and key took over 60 hours of forging, filing and fitting to create. 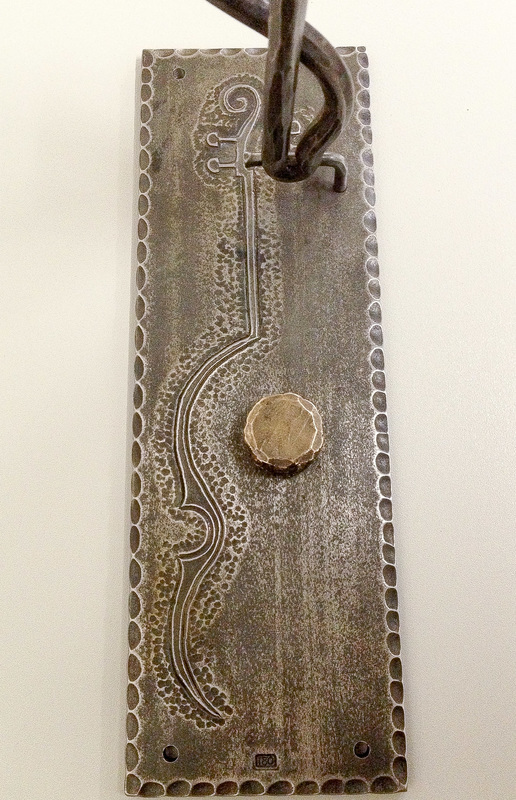 The front cover has been left unriveted so it could be removed to reveal the internal workings of the padlock. 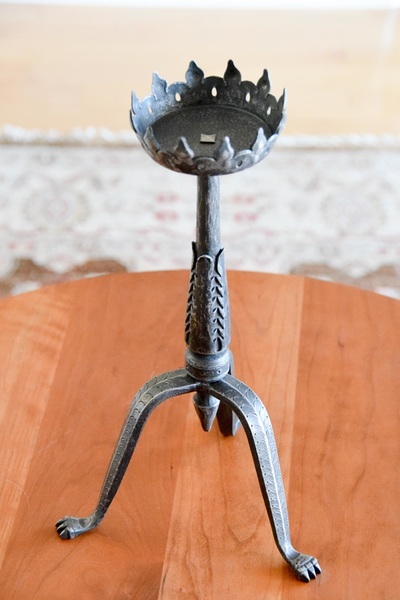 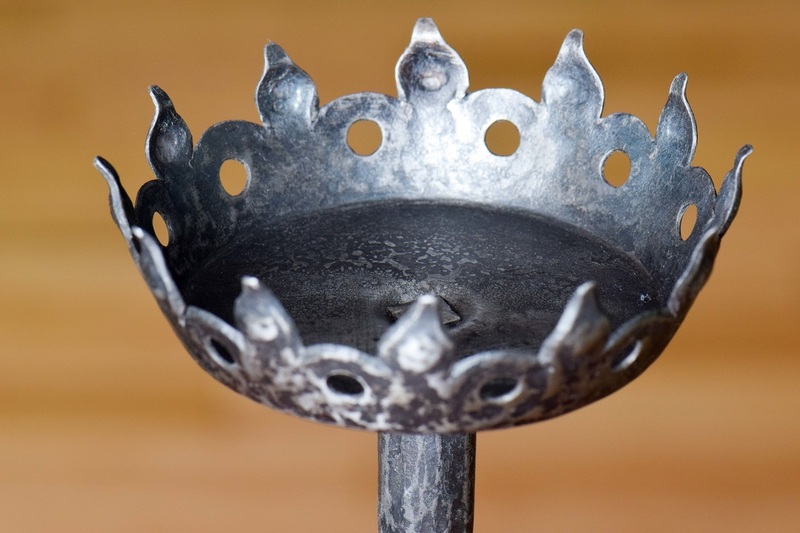 ​This gothic-style candle holder which was recreated from a 1934 Samuel Yellin design. 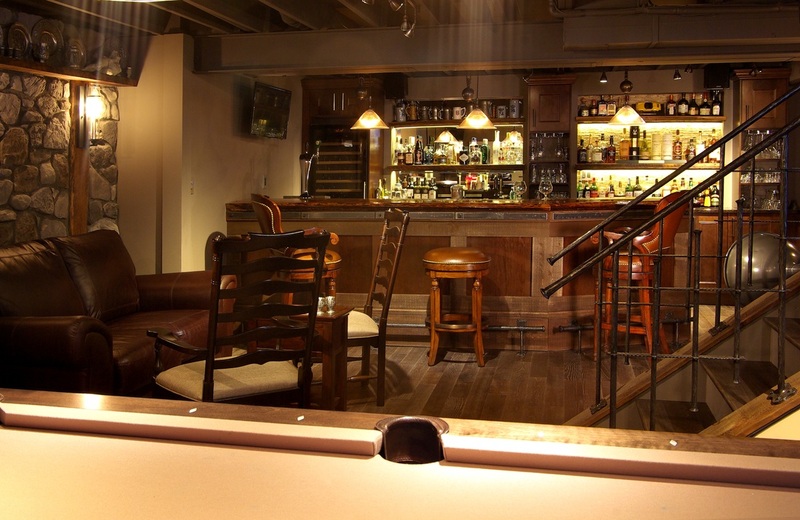 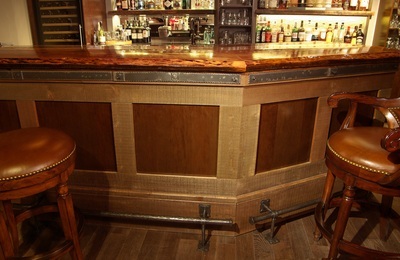 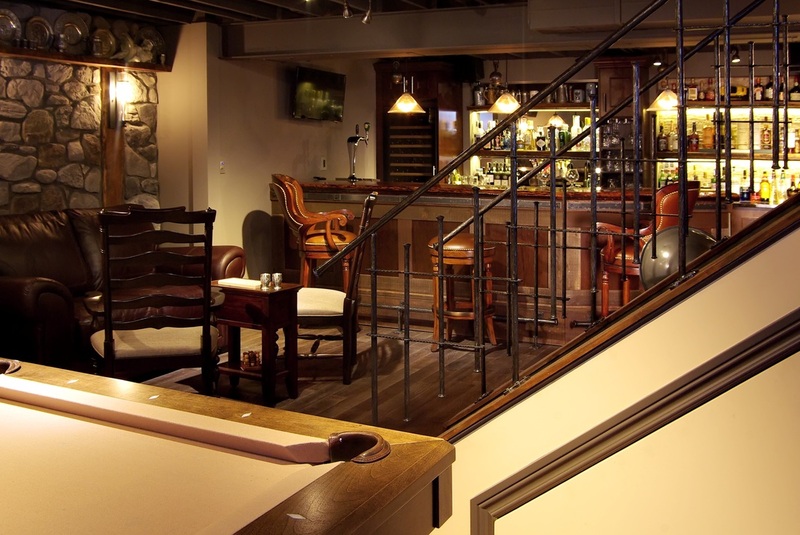 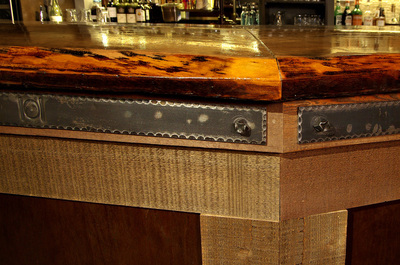 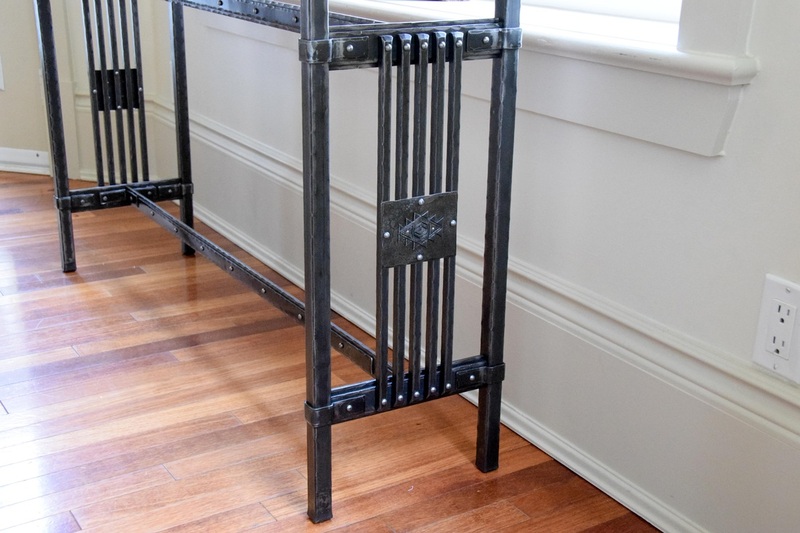 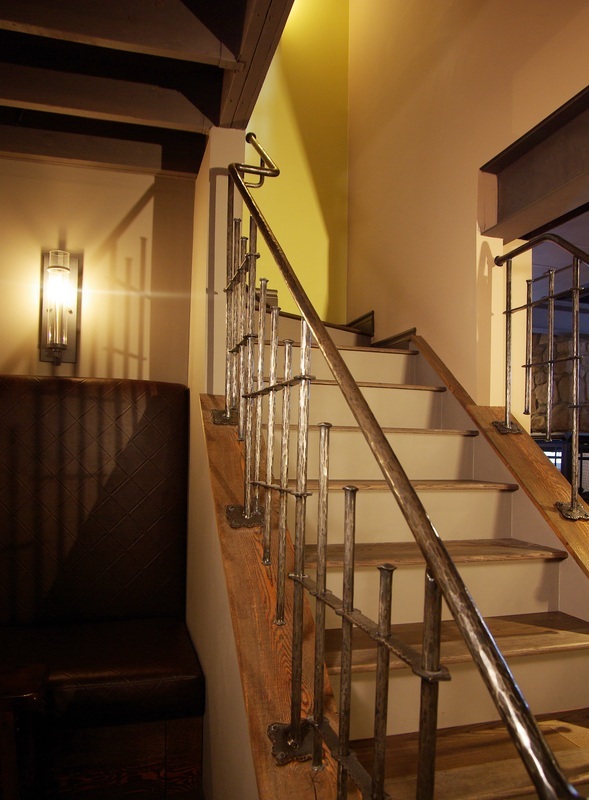 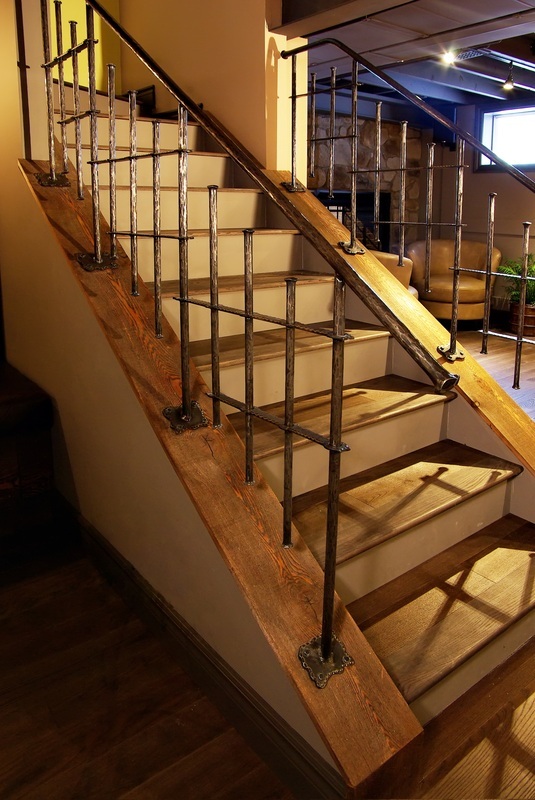 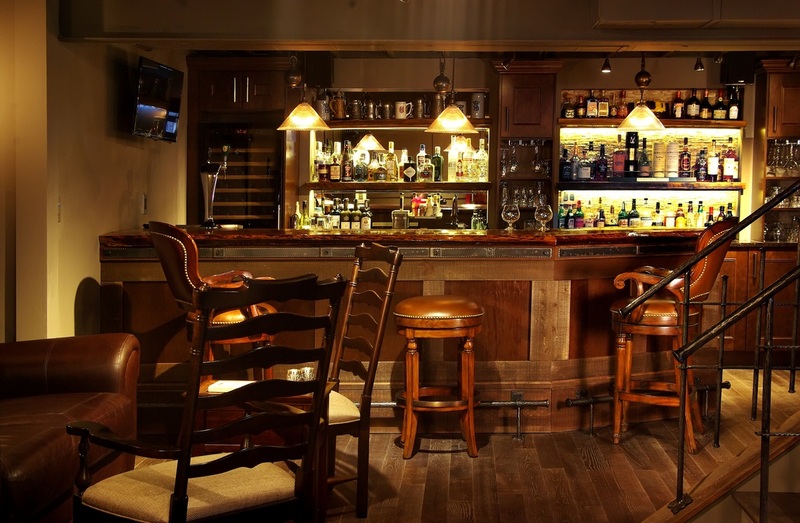 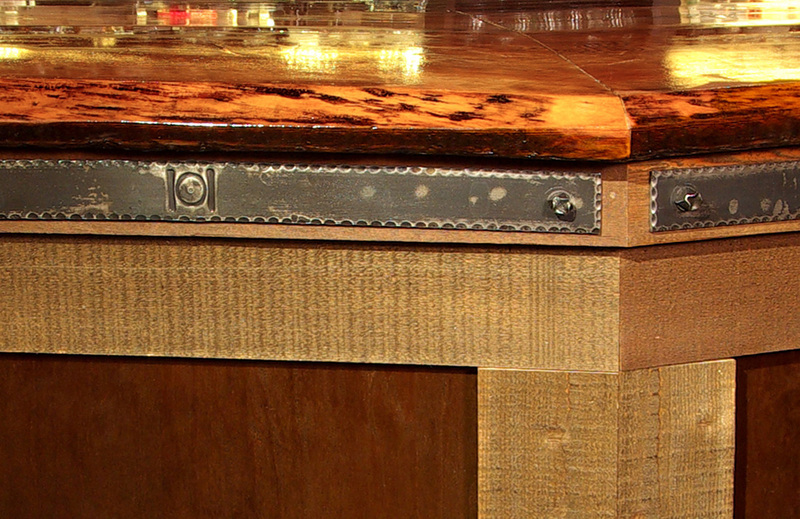 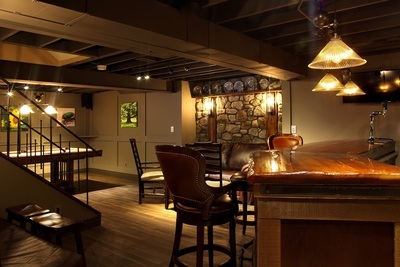 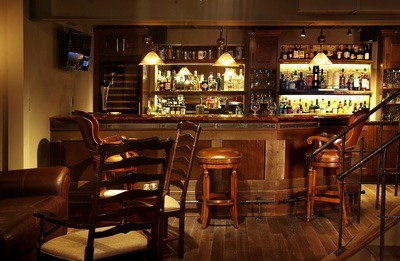 This commission was part of an extensive basement renovation which included a forged railing, bar foot rail and decorative strapping along the top of the bar. 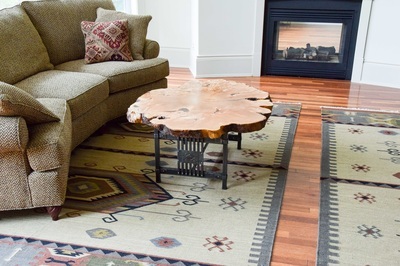 Was asked by a local hair salon owner to create an industrial-looking base for this awesome, heavy slab of live-edge pine that measures over 12' long . 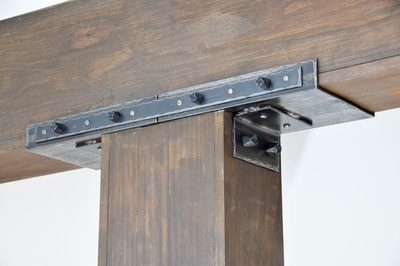 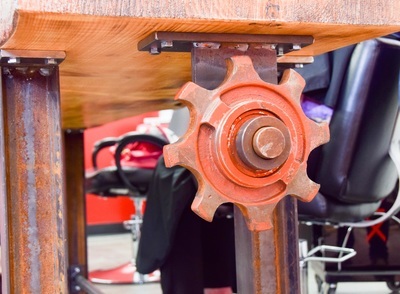 The design features I-beams, pipe, heavy plate and reclaimed gear sprockets. I wanted to add a funky element to the design so I crawled through the local scrapyard and, after much digging, found these incredible reclaimed sprockets at the bottom of a rusted bin. I absolutely enjoyed every moment of this commission! 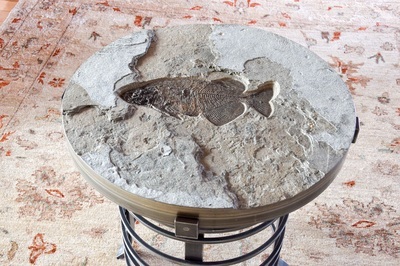 From the Eocene epoch, this certified, authentic fossil dates back 50 million years. 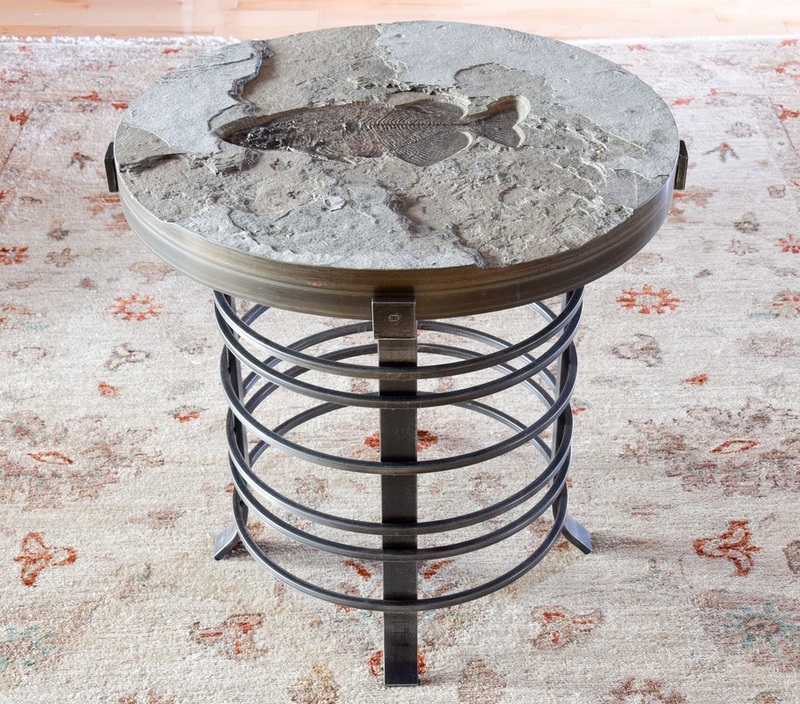 The species is Phareodus encaustus and it was extracted from a quarry in Wyoming.The fossil top is 22" is diameter and 2" thick. 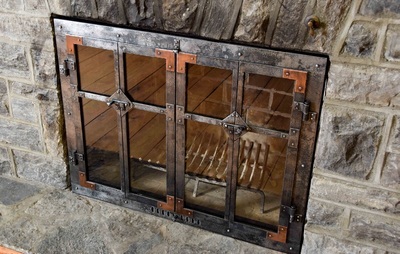 It weighs close to 80 lbs. 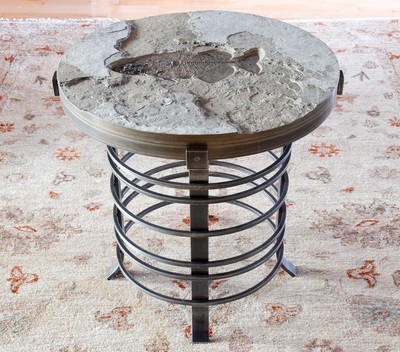 I had the good fortune to be asked to create a ringed table base for it. 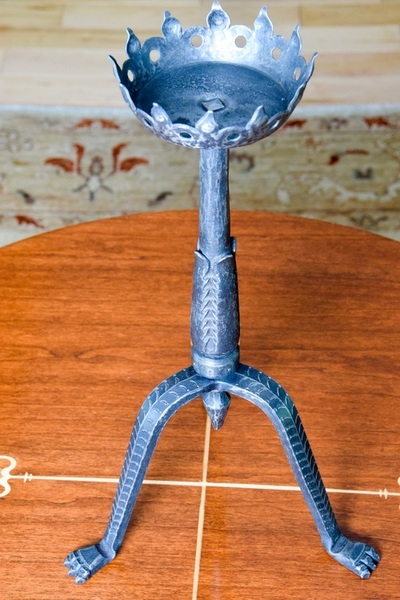 The table itself stands 22" tall. 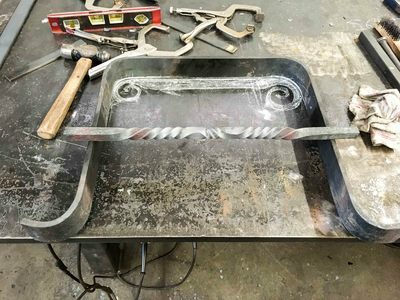 This shower seat was forged from solid stainless steel. 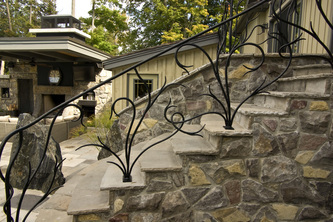 Left over from a bathroom reno, the granite piece was provided by the client. Stainless steel is about twice as hard to forge when compared to the normal steel I use in my work. 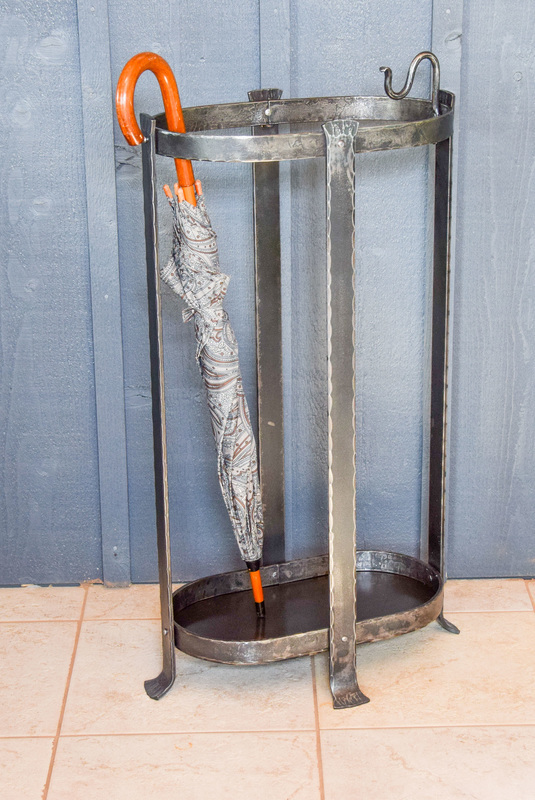 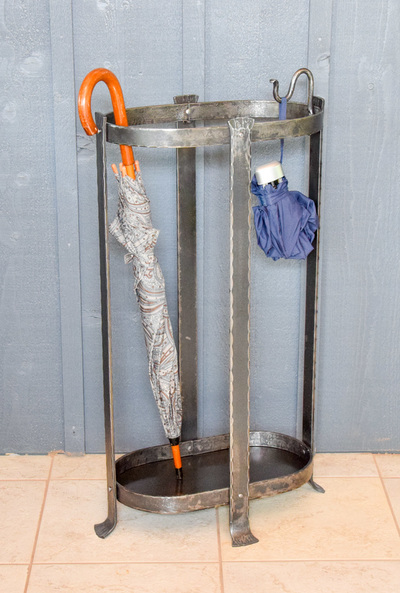 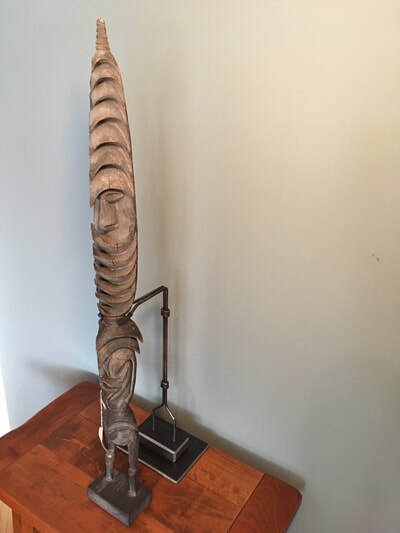 This umbrella stand is 30" tall, 8" wide and 16" long. 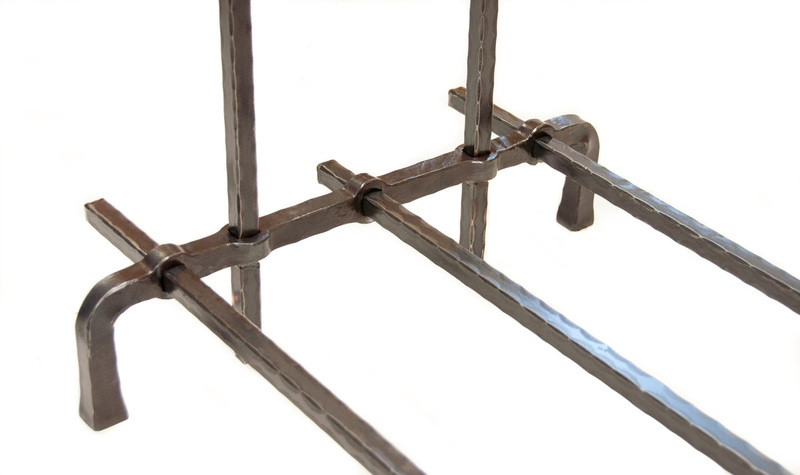 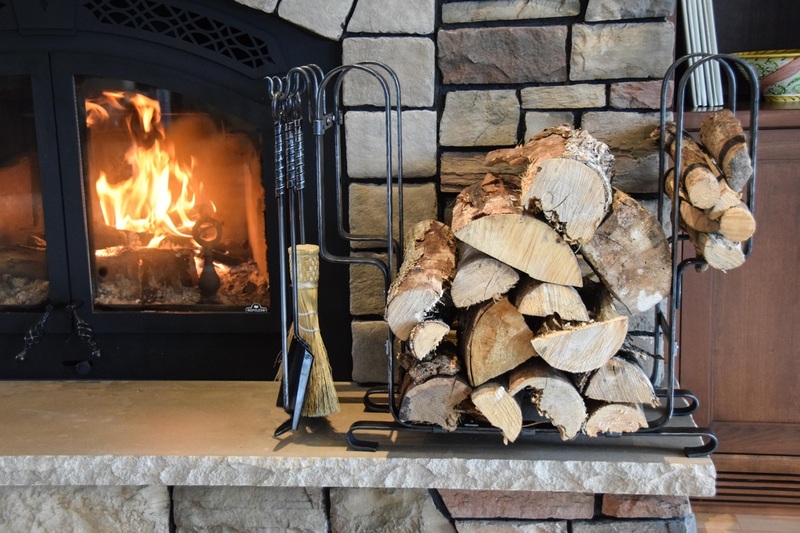 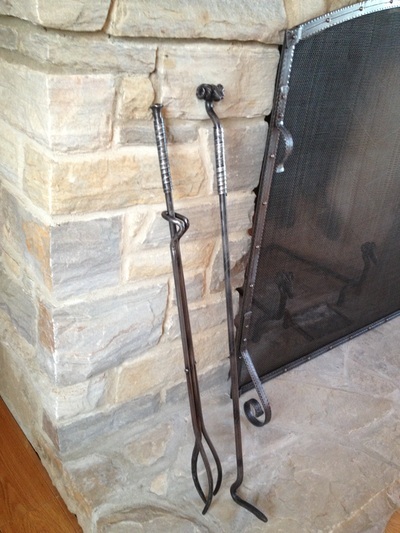 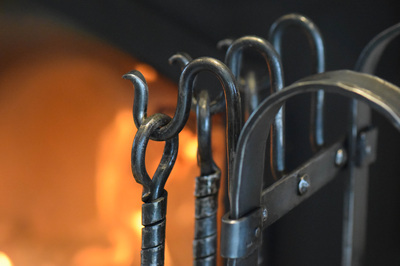 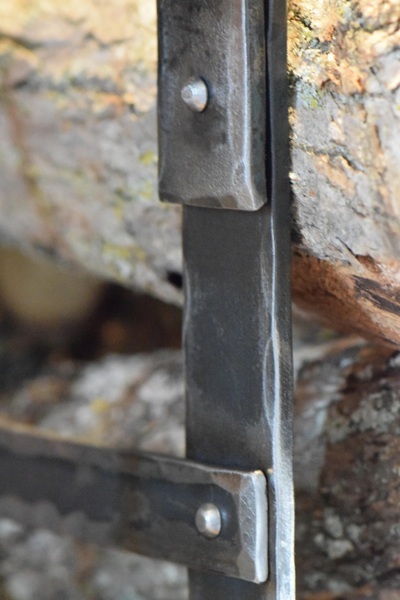 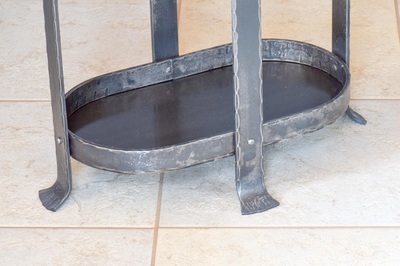 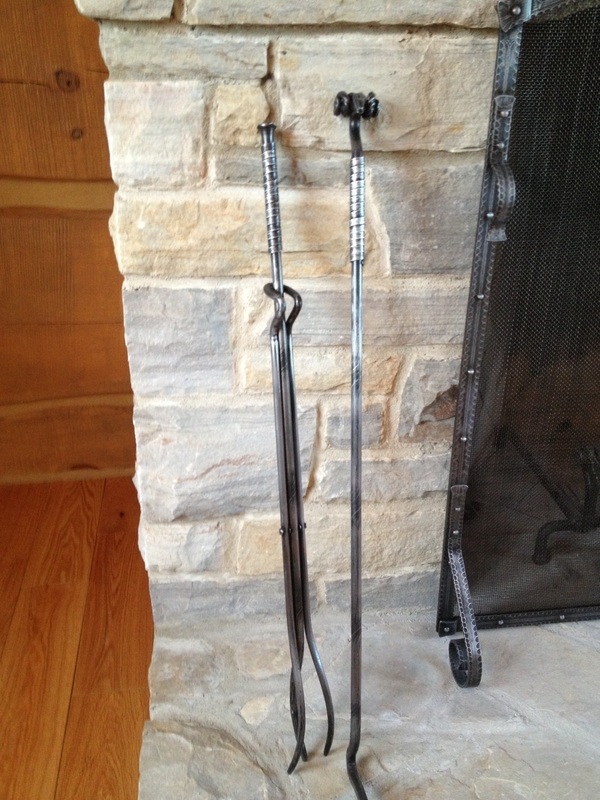 It was forged to complement the client's fireplace tool & log holder that was previously commissioned. 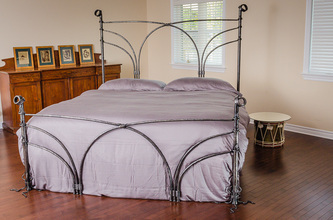 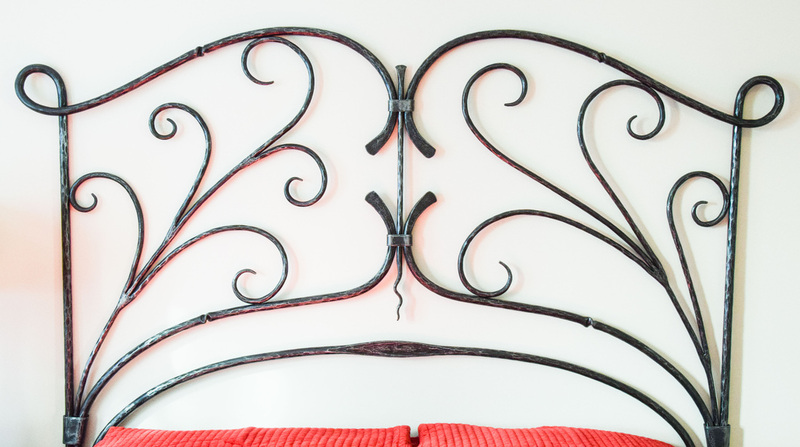 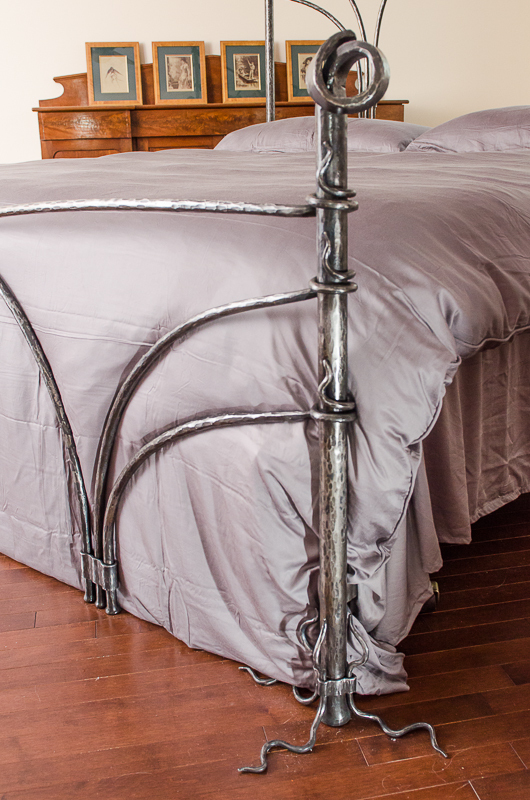 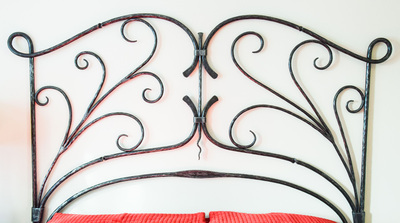 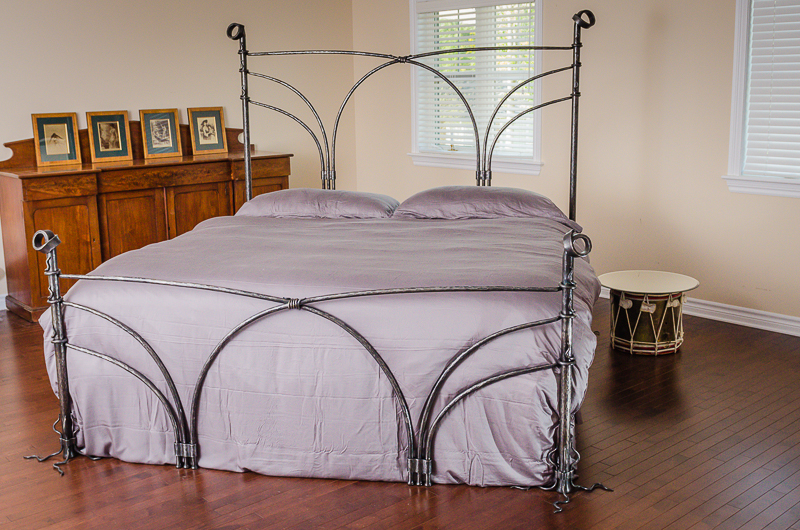 This headboard commission was a pleasure to forge. 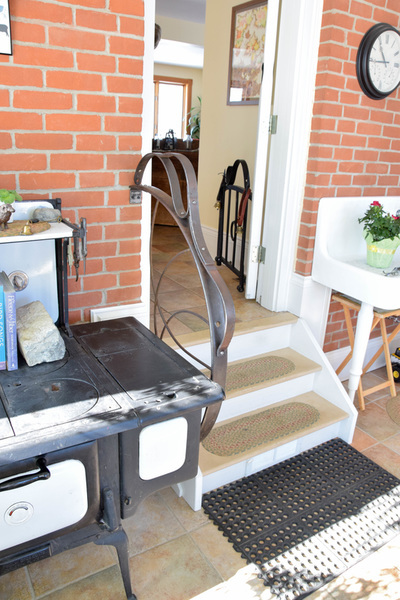 I worked closely with its new owner on the design and layout. 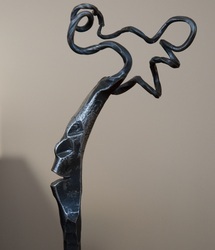 The adventurous soul who commissioned the work even contributed to the forging of one of the curls! 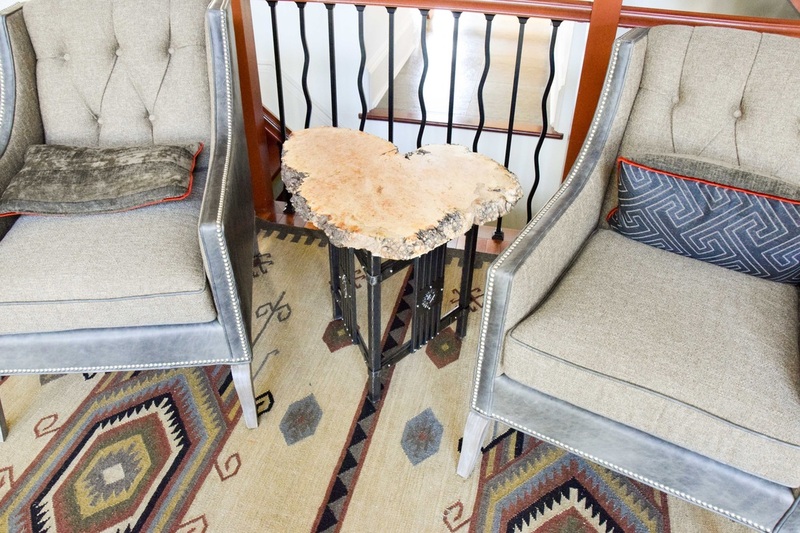 Live edge tables have a natural tree trunk slice as the table top element. 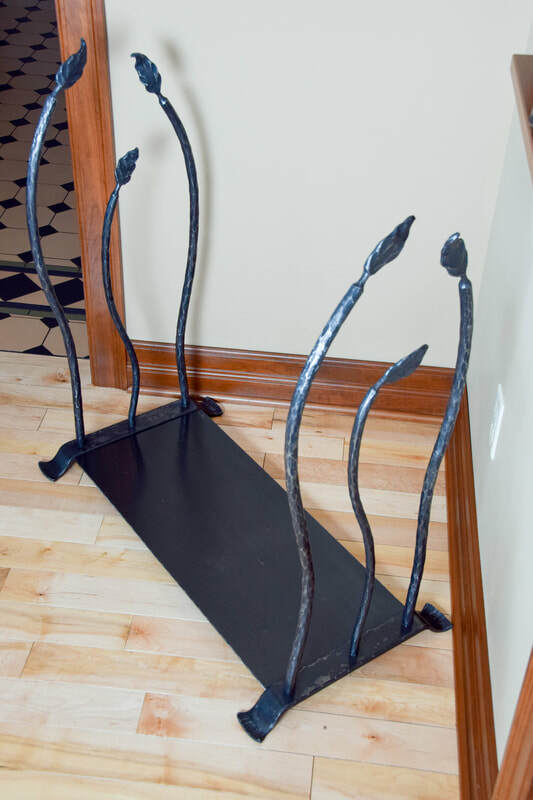 For this commission, the tops were provided while I designed and forged the bases. 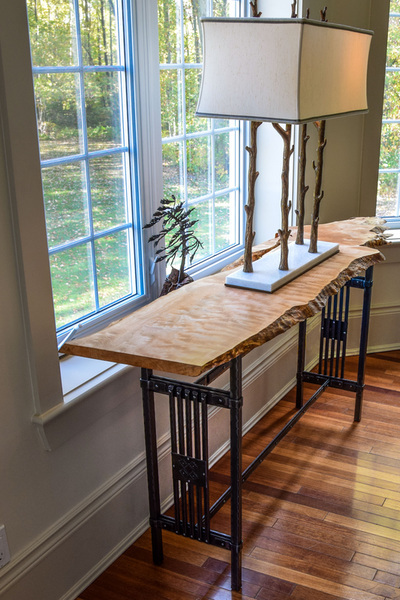 Three tables were created: a coffee table, a side table as well as a taller console table. 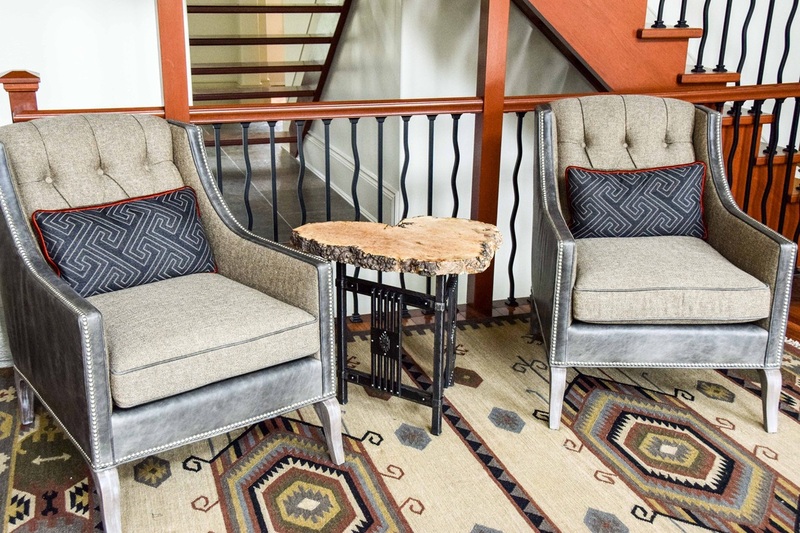 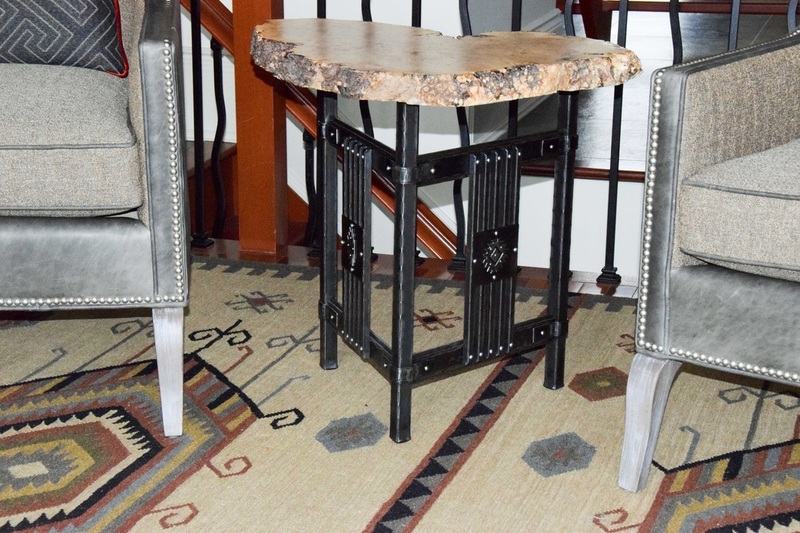 Each table features individual and unique hand-chiseled layered inlays drawing from American southwest & Navajo design influences. 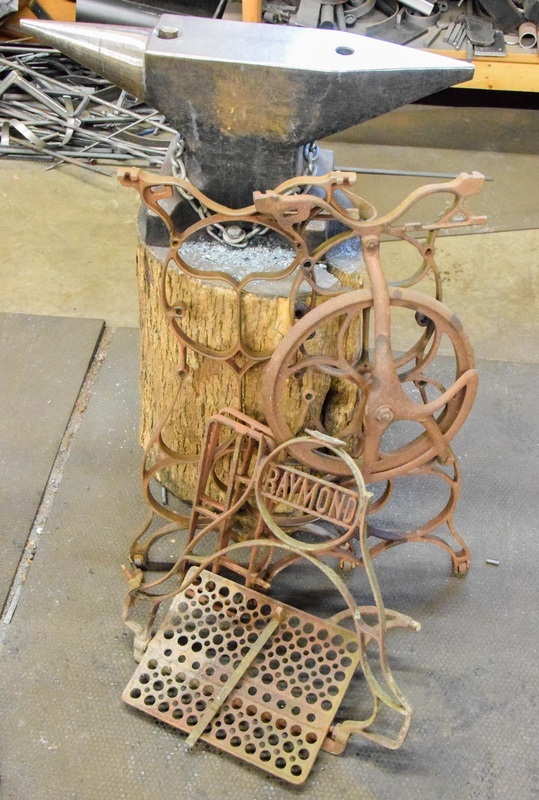 This old Raymond sewing machine was rescued from the woods by a customer with a particularly keen eye for what could be. The idea was to see if a wine rack could be made from the bits and pieces found. 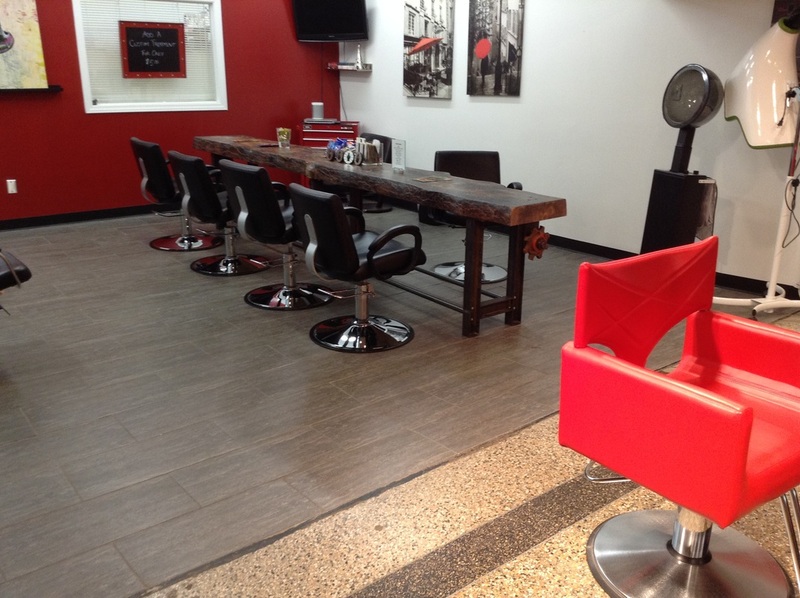 Take a look at the transformation with some pictures taken along the way. 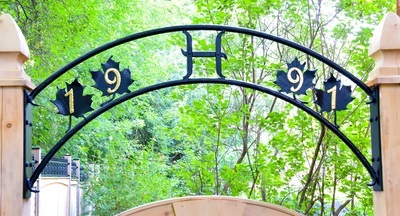 The pictures have captions which explain them. 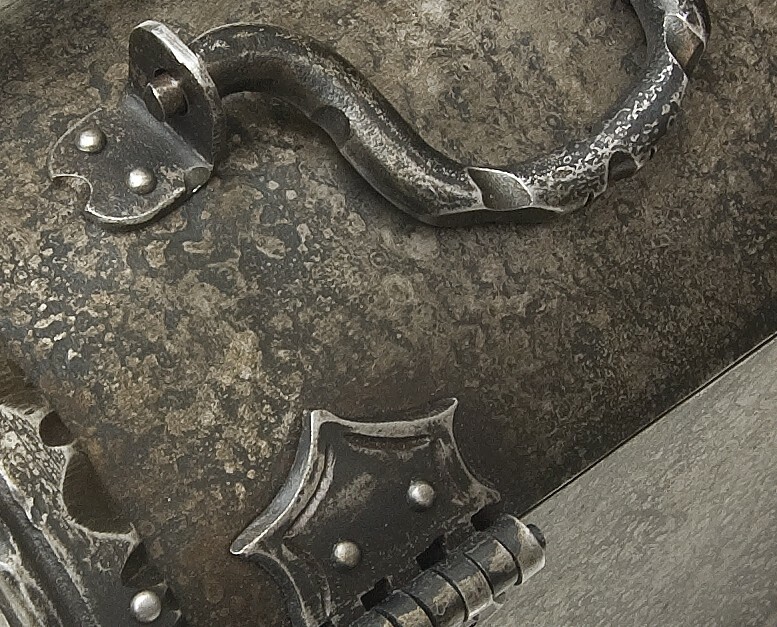 Lots of rusty, dirt-encrusted parts to work with. 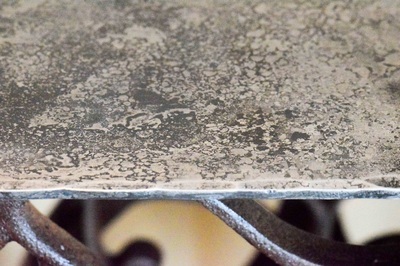 Soaking a heavy plate in the coals to add an antique look to the iron. 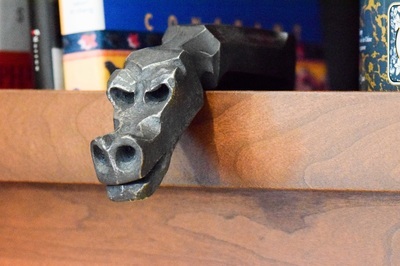 This added piece will be used as the top of the wine rack. 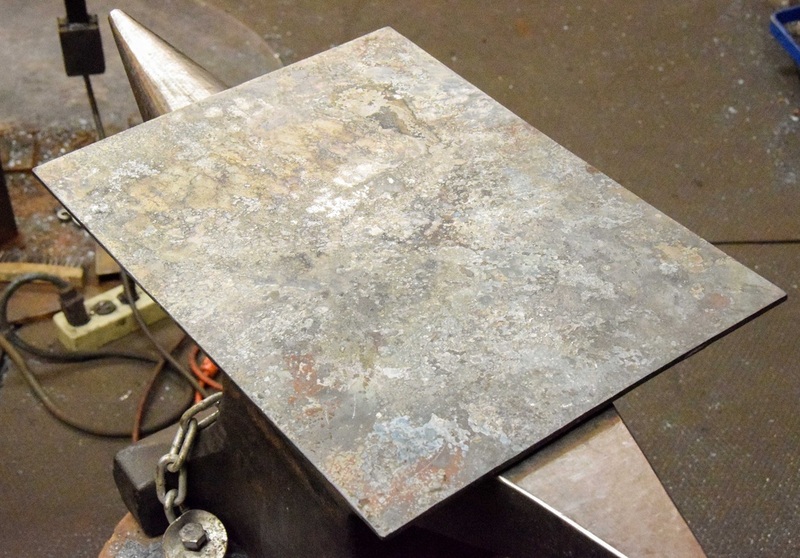 Here is the unsanded plate after soaking in the hot coals. 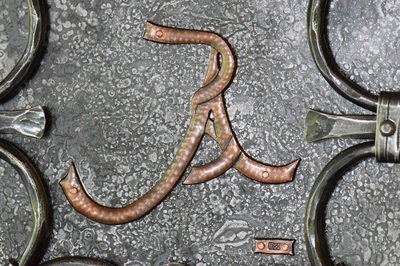 The original piece had a rather boring 'fresh from the steel mill' look quite similar to the anvil face showing below the plate. 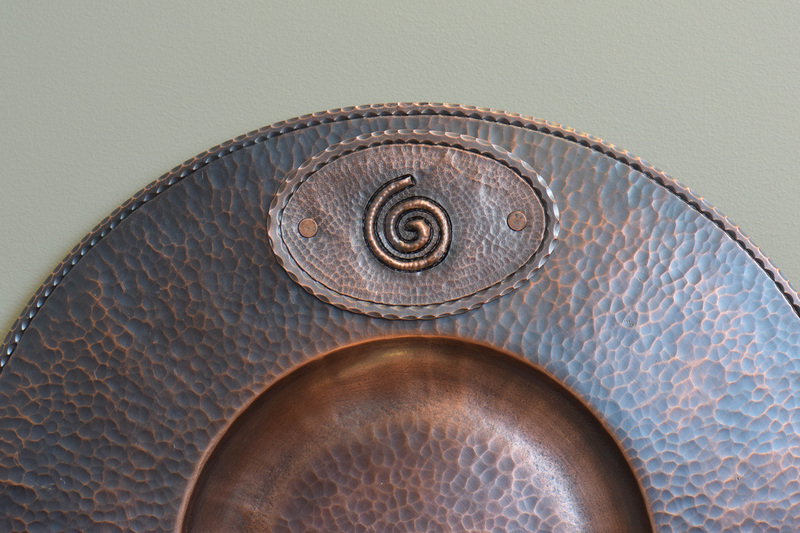 This plate will really come to life after it gets hand sanded and edge-textured. 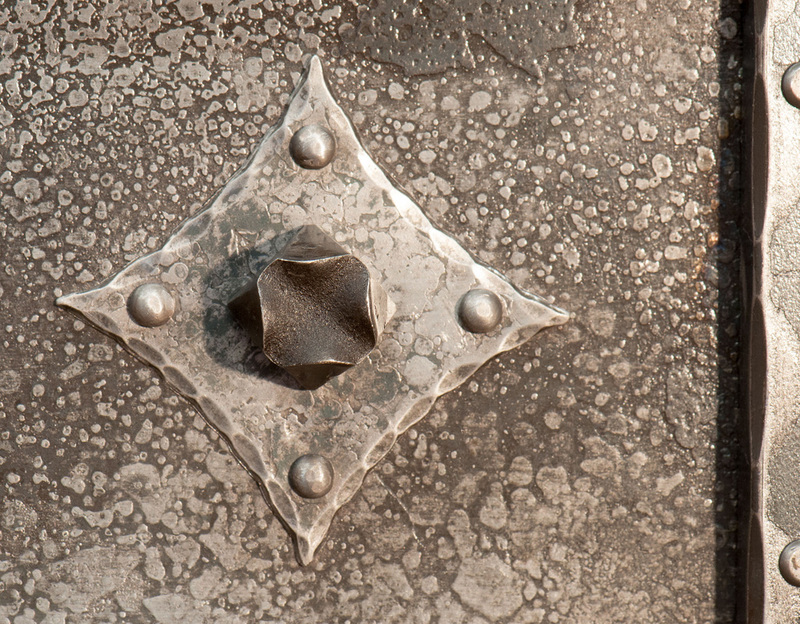 Same top plate but now with the edge-texturing complete. 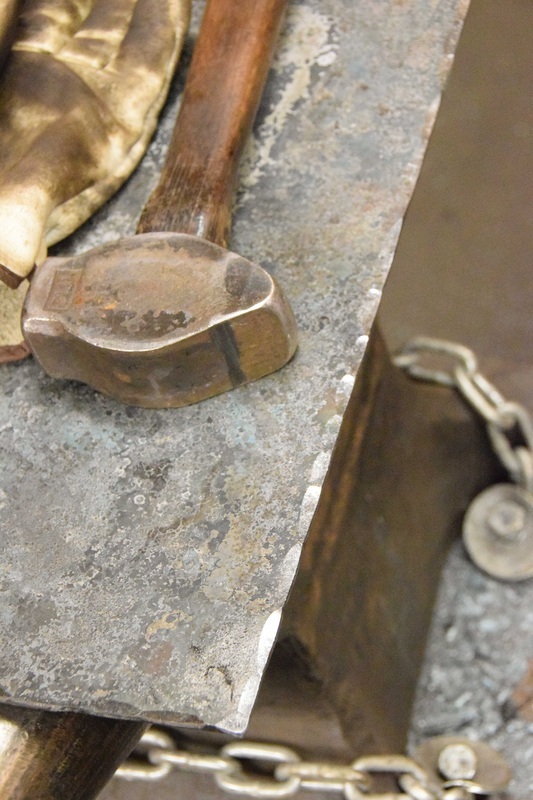 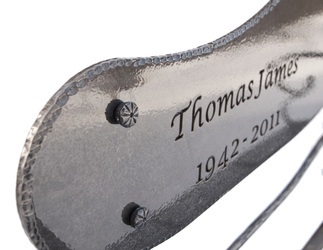 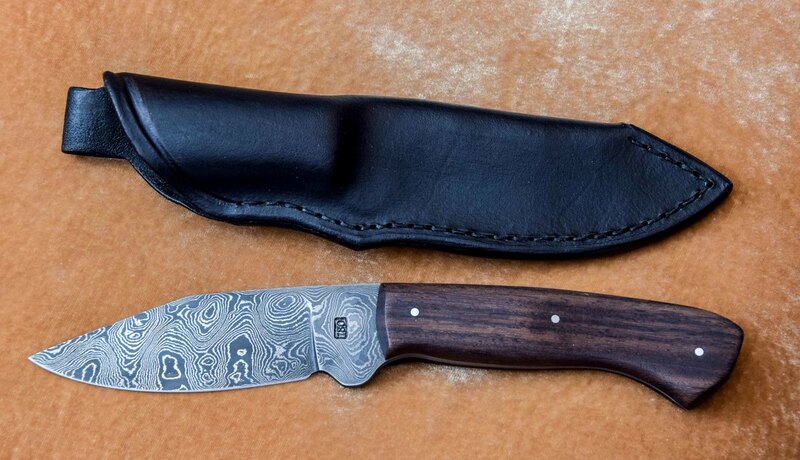 This texturing is done by overlapped hammering on the edge of the anvil. Still not sanded though. 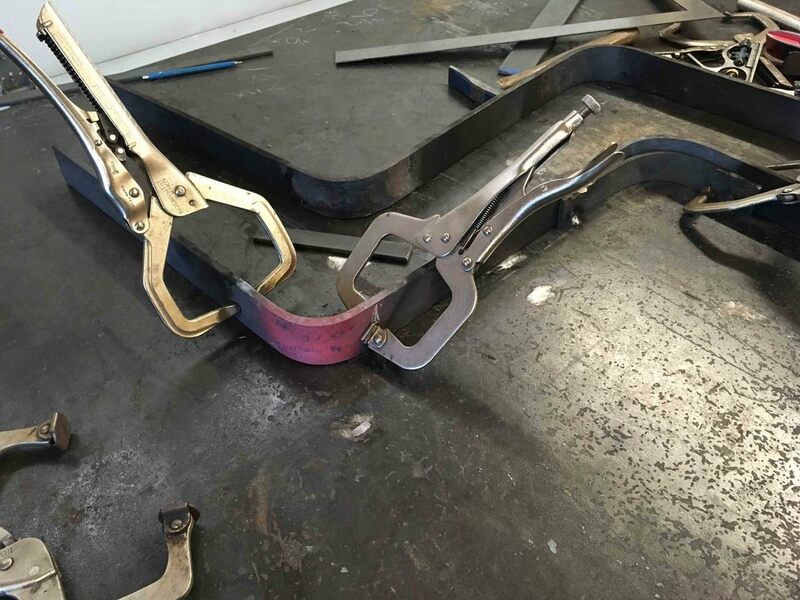 These bars will be used to join the two frame halves together. Each bar is hammer-textured then a tenon is forged on each end. 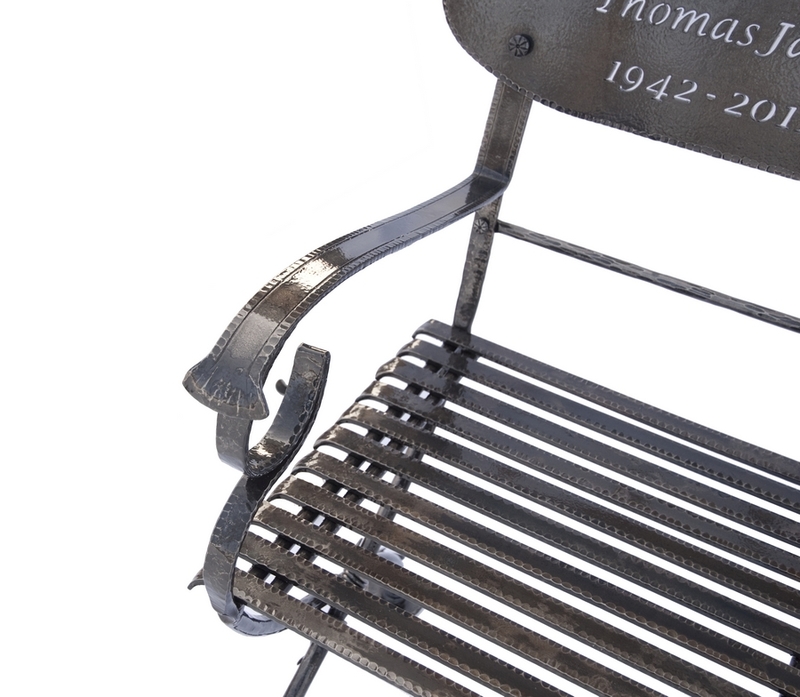 The tenons get threaded and hand-brushed nickel acorn nuts are used to secure the frame. 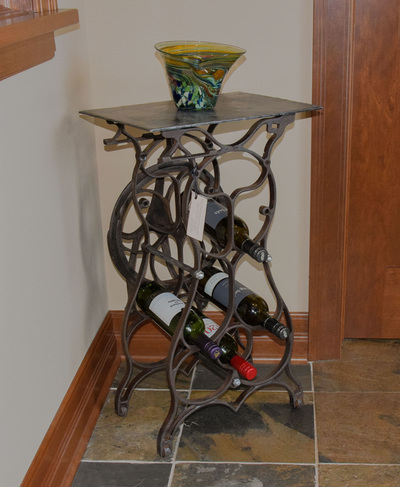 Front view of finished wine rack. 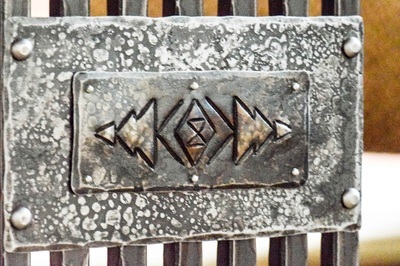 Close up of the coal patina on the top plate. 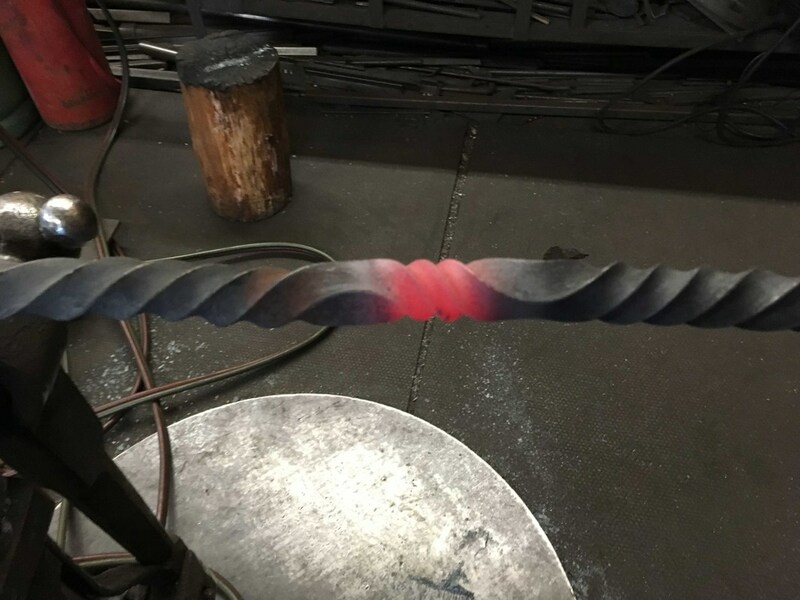 In my opinion, the time, effort and extreme forge heat is so worth it. This aging technique compresses hundreds of years of natural oxidization down to a couple of hours. 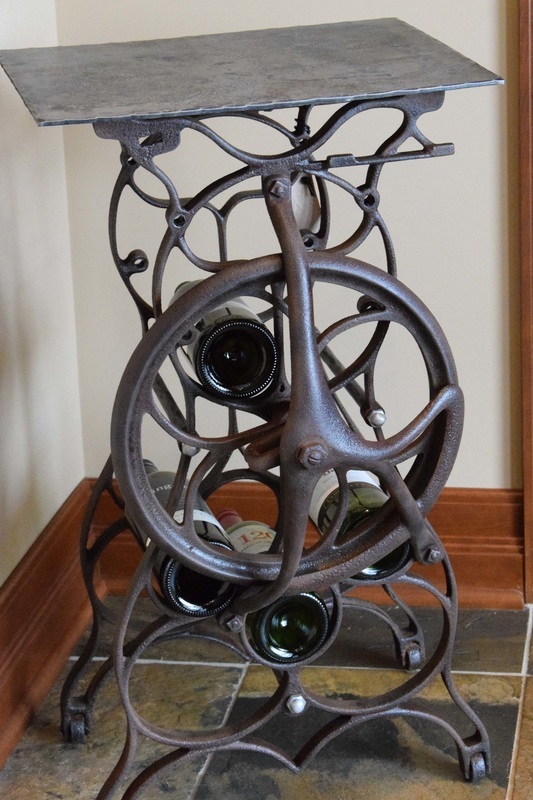 Back view of wine rack. 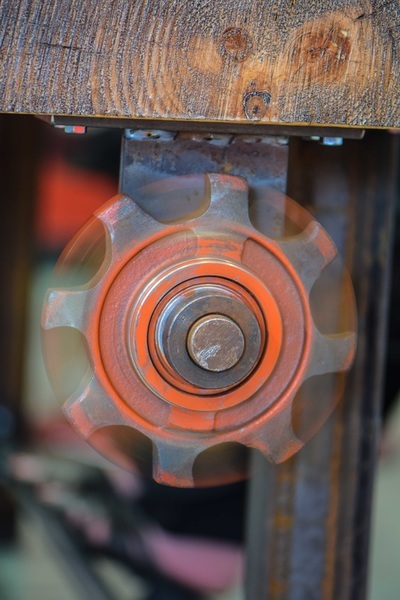 I just had to include the flywheel as it is such a beautiful element. 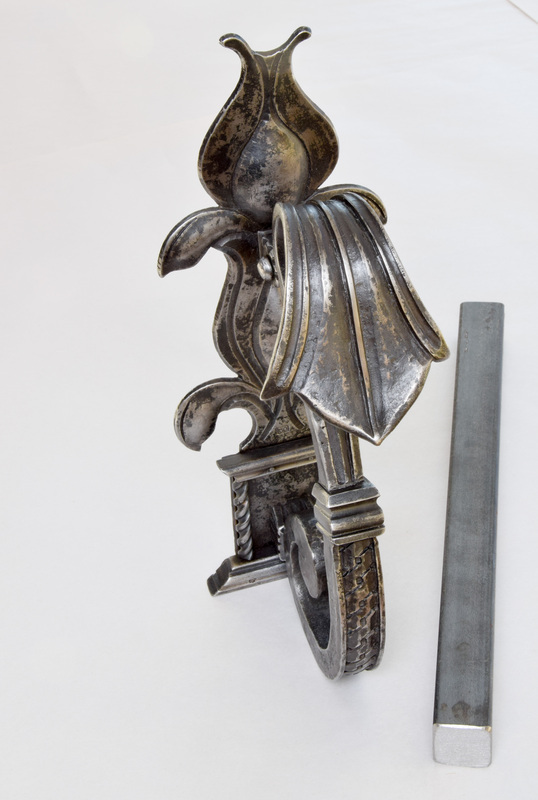 Quite a bit of effort was taken to clean the original cast iron with a wire wheel brush and lots of hand sanding. 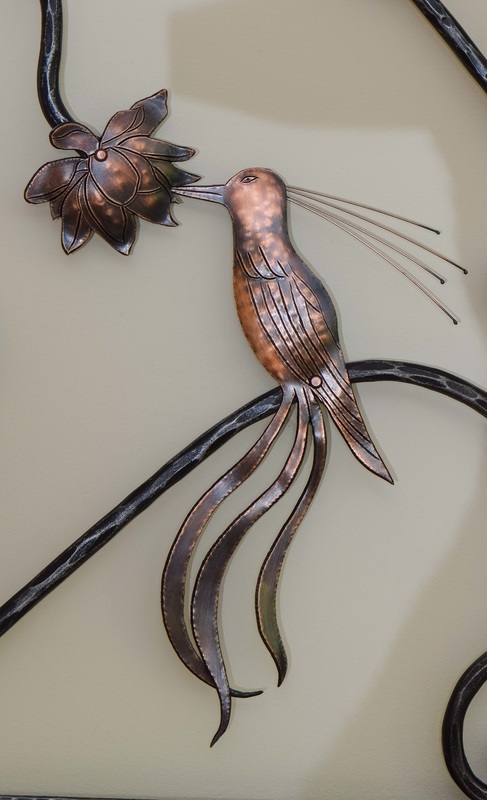 I finished the entire piece with lacquer. 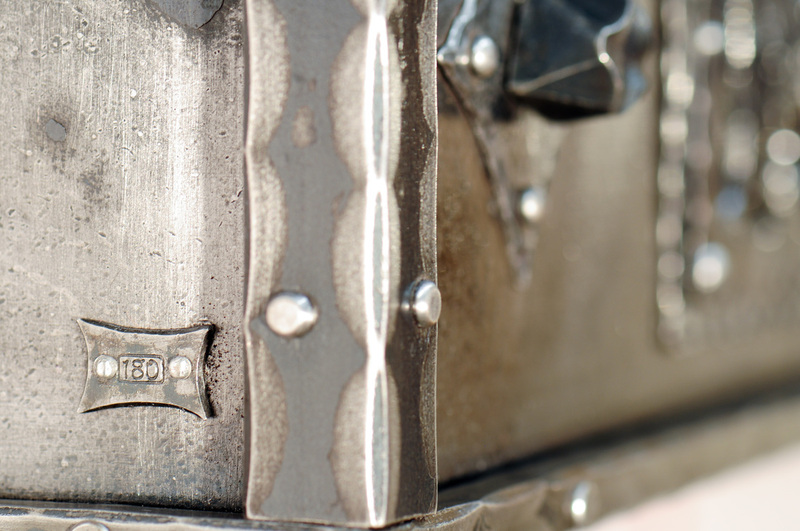 Off she goes for a new life with a new purpose. Farewell old gal! 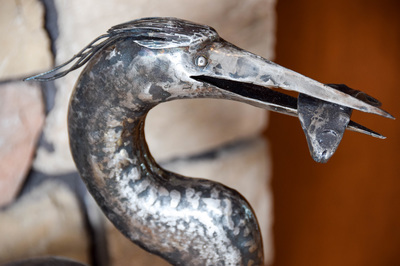 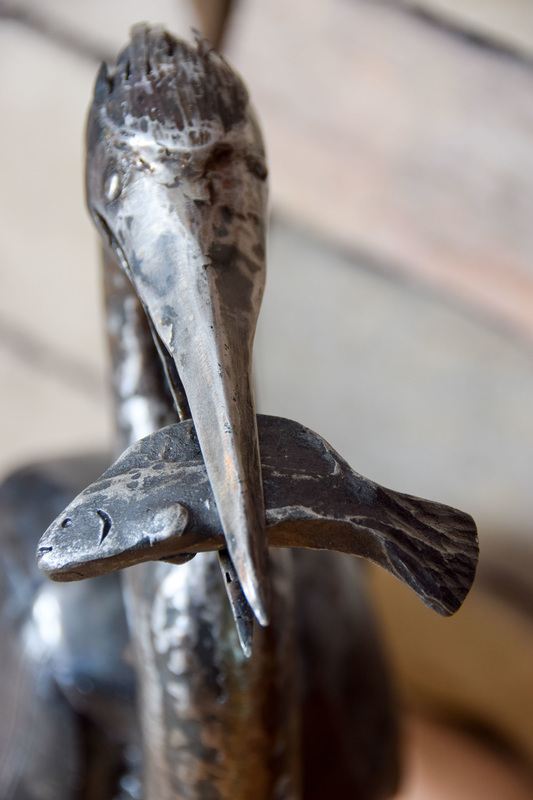 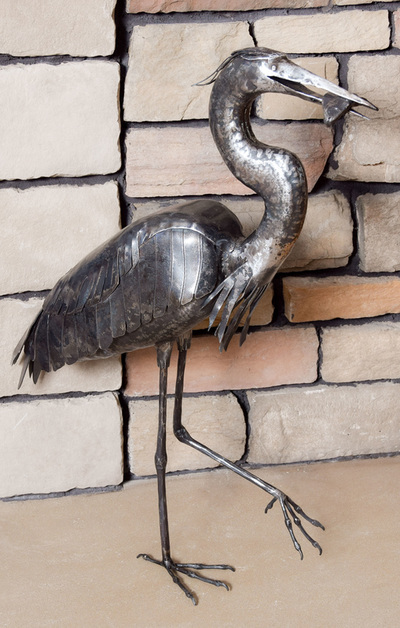 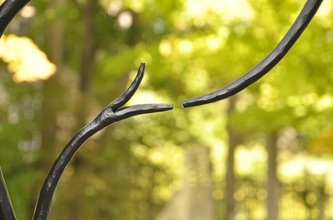 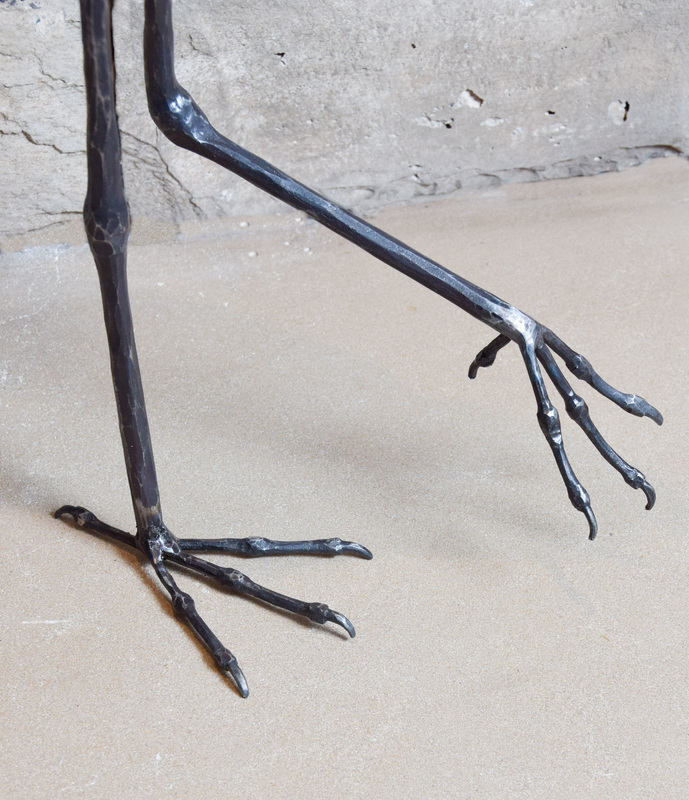 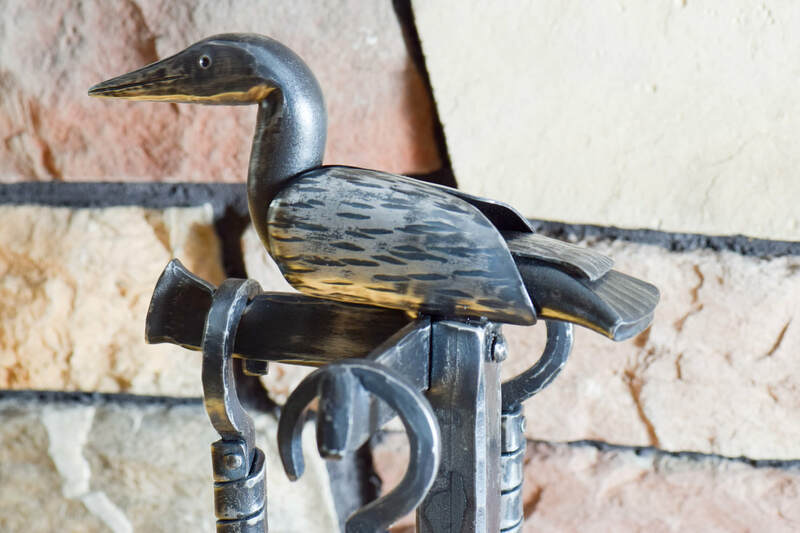 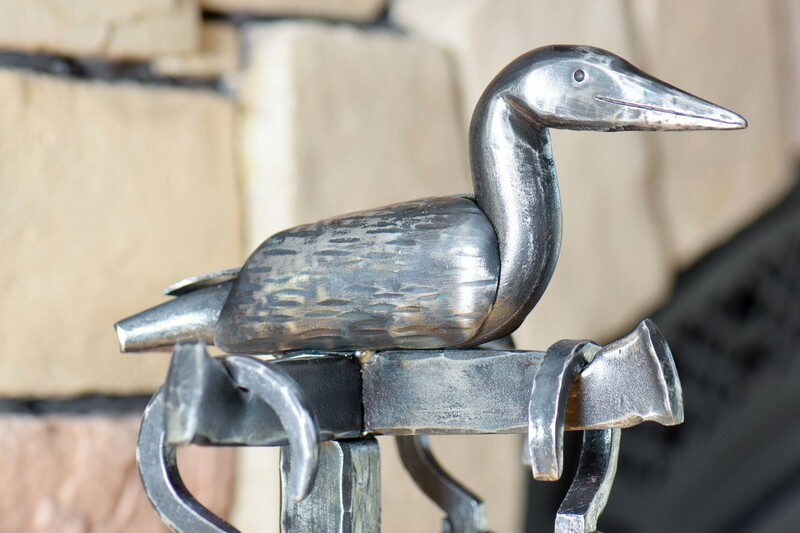 This Blue Heron was forged out of a combination of solid bar and sheet steel. 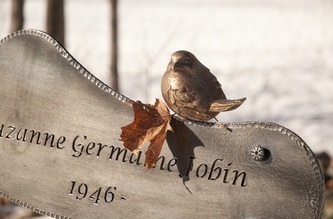 There is a bird that lives in the woods around my home that is called the Veery. My wife and I have never seen him but his song is the most beautiful we have ever heard.The song has been described as “an ethereal downward spiral of flutey notes with an echoing, ventriloquial quality”. 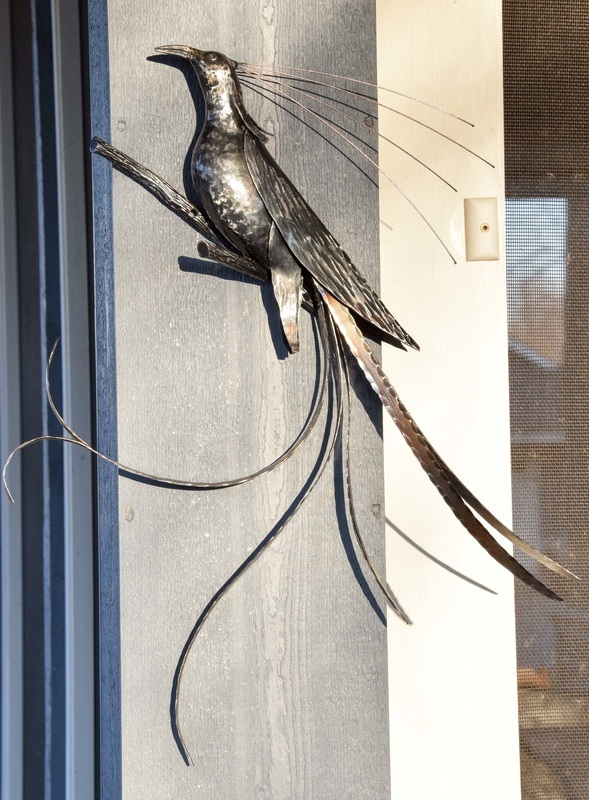 My wife and I would sit listening, trying to image what this bird would look like. 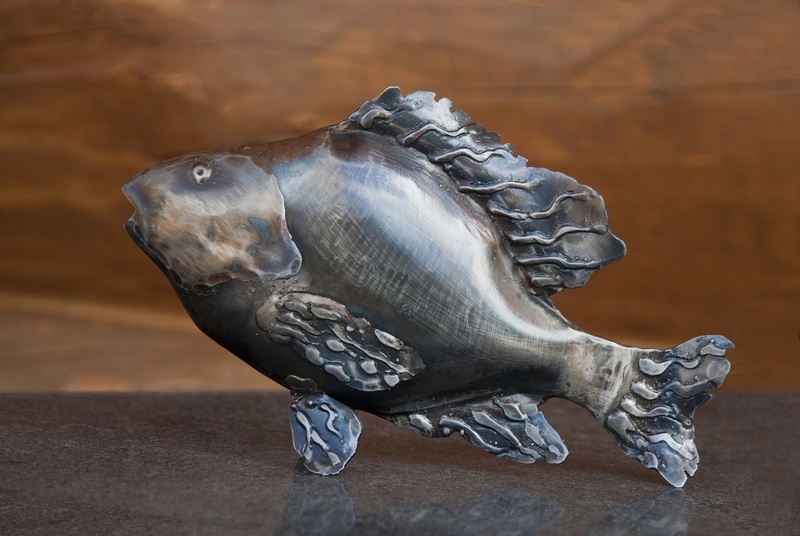 We imagined a proud, majestic creature, with a beautiful flowing tail. 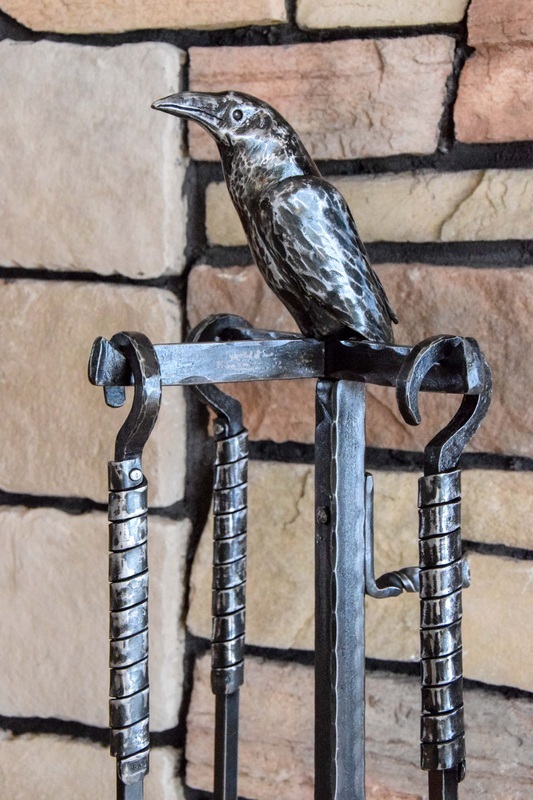 When we did, finally, make the connection between the song and the bird, we found nothing like we imagined. So, we have determined, that ‘our Veery’ is indeed our mind’s eye, magical creature. 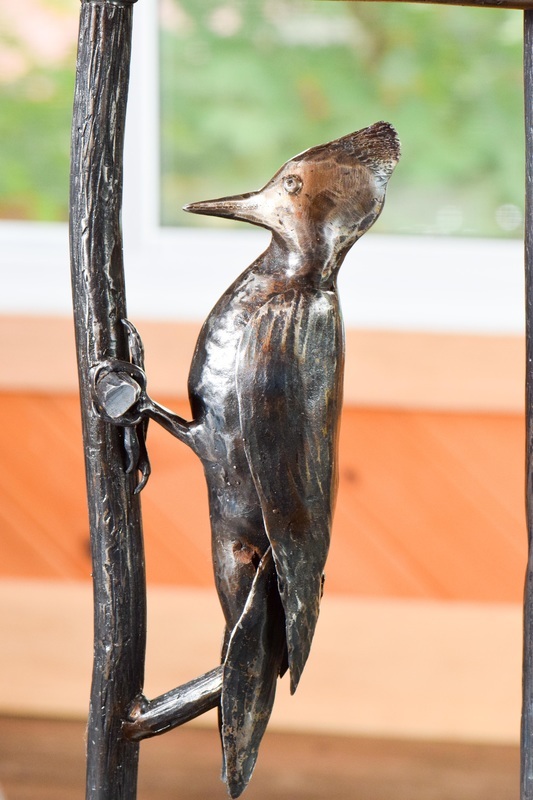 Here is my hammer's interpretation of 'our Veery'. If you are interested in seeing some of the steps that went into the creation of this Veery, click here. 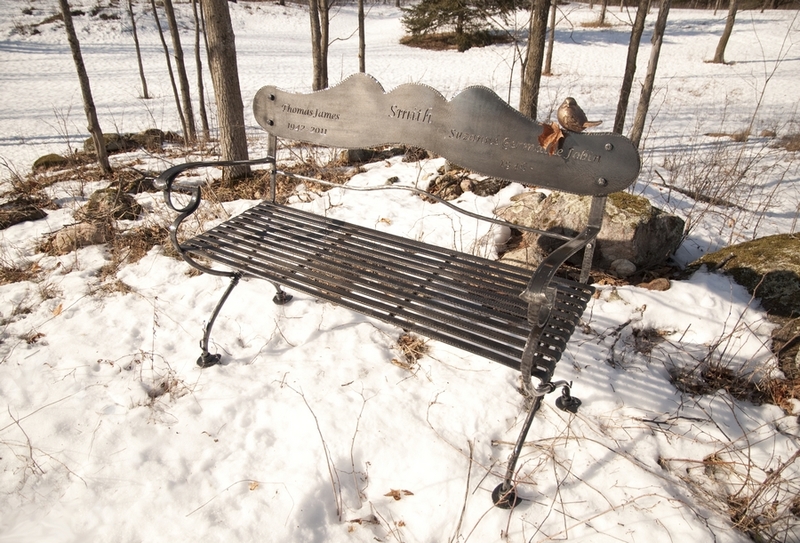 This commission was for a wedding gift from parents to their daughter and son-in-law. 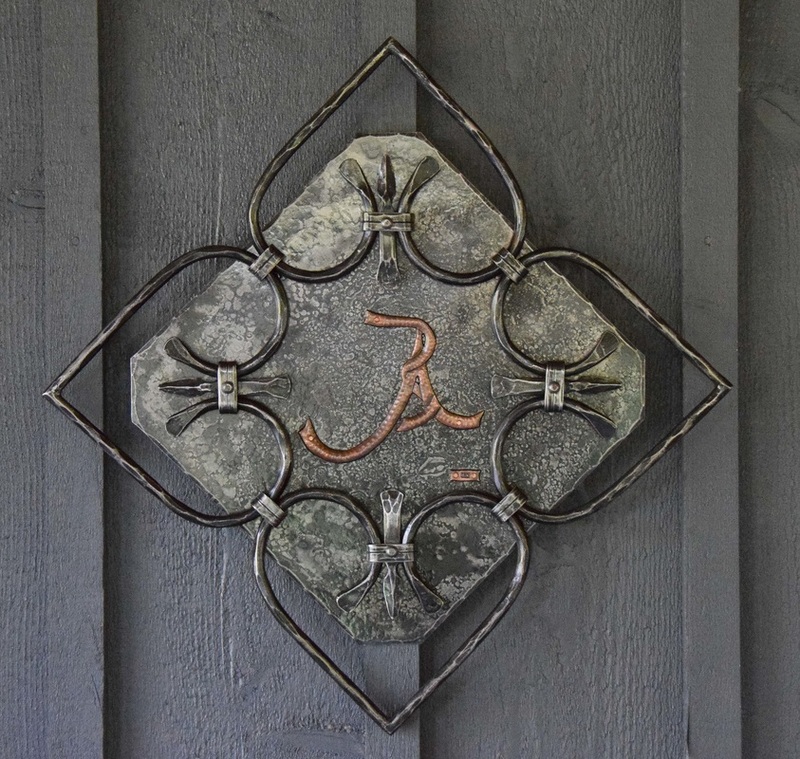 The inspiration for the frame came from Celtic love knots while the lettering, chiseled out of copper, represents the initials of the young couple "J-A". 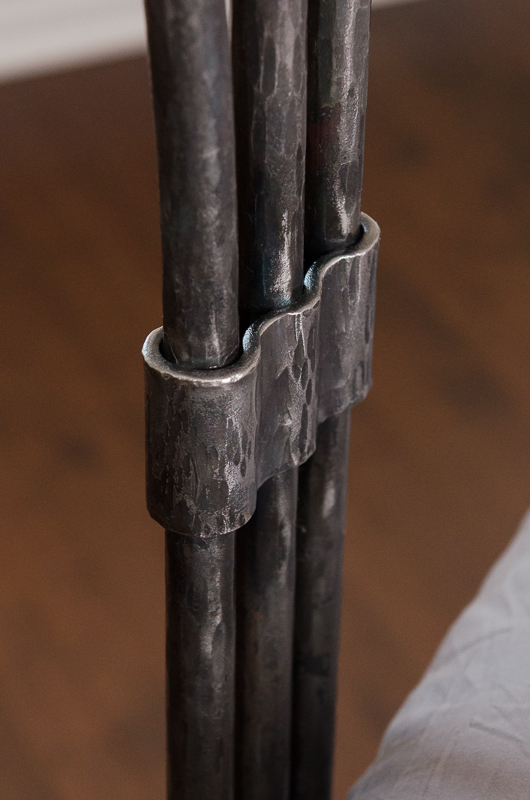 These beam supports were forged to look like they were part of the original building. 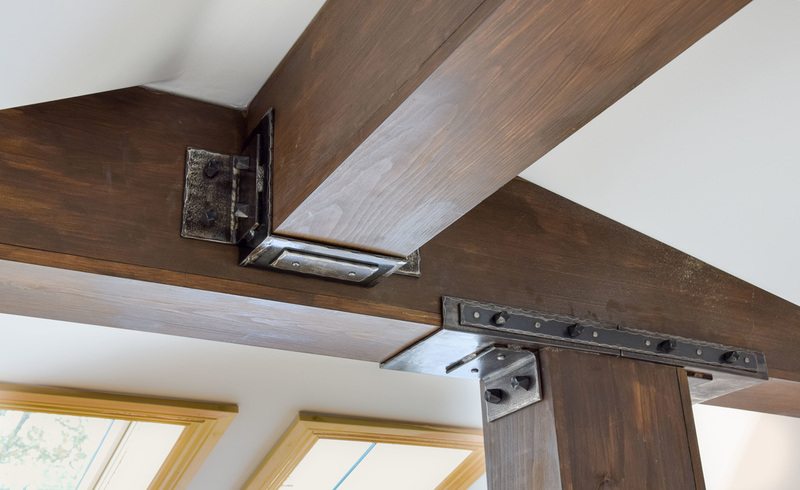 They add a very nice finishing touch to an otherwise somewhat plain set of beams in an artist's loft located in a beautiful old Victorian-style house. 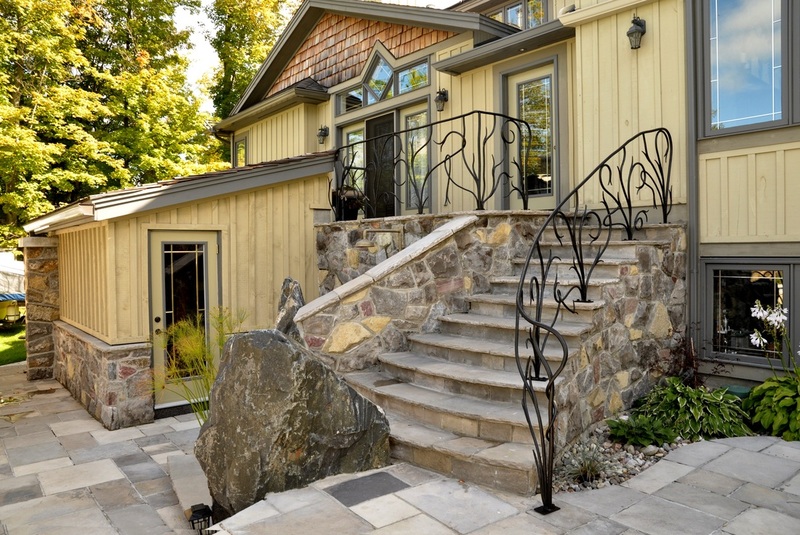 Transformative elements like these can be added quite easily to existing structures. 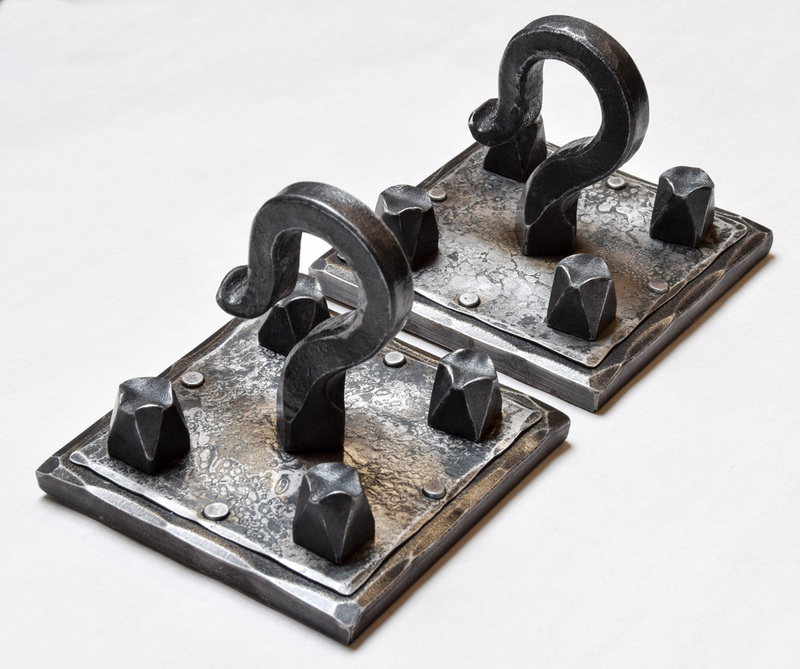 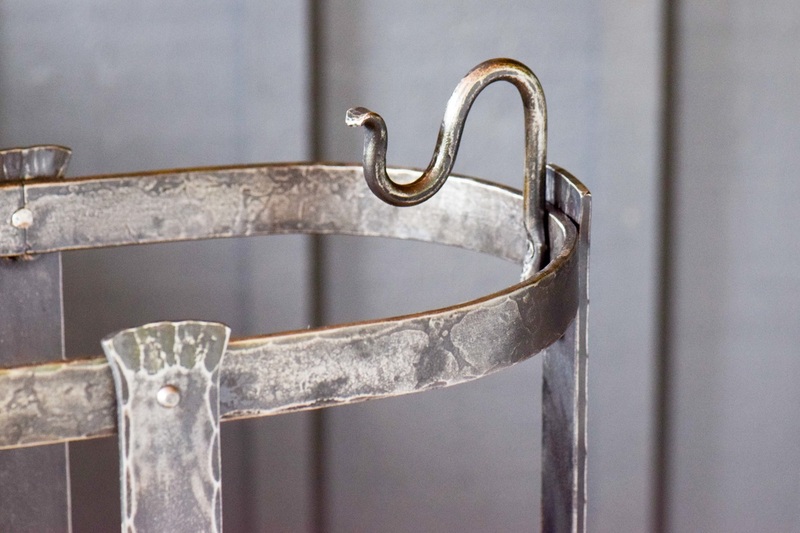 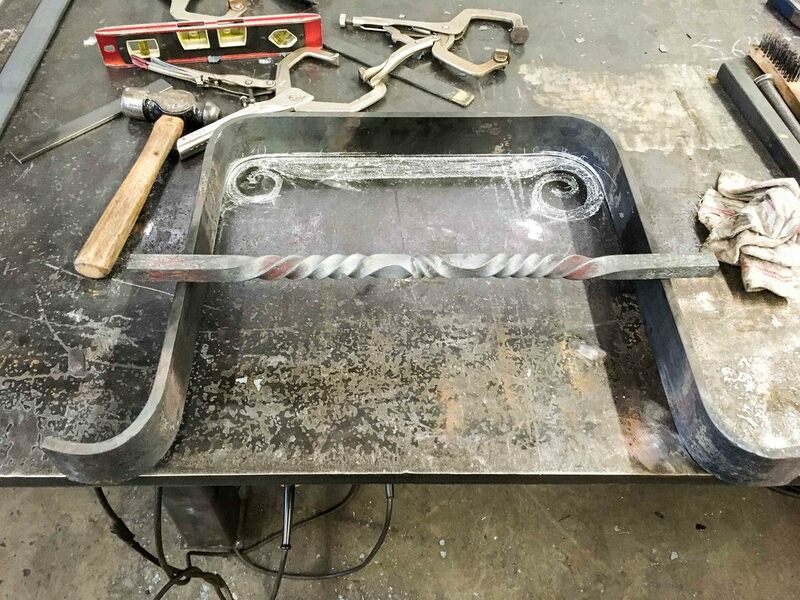 This commission features decorative mounting plates and forge-welded chains which will be used to hold up a bathroom sink top. 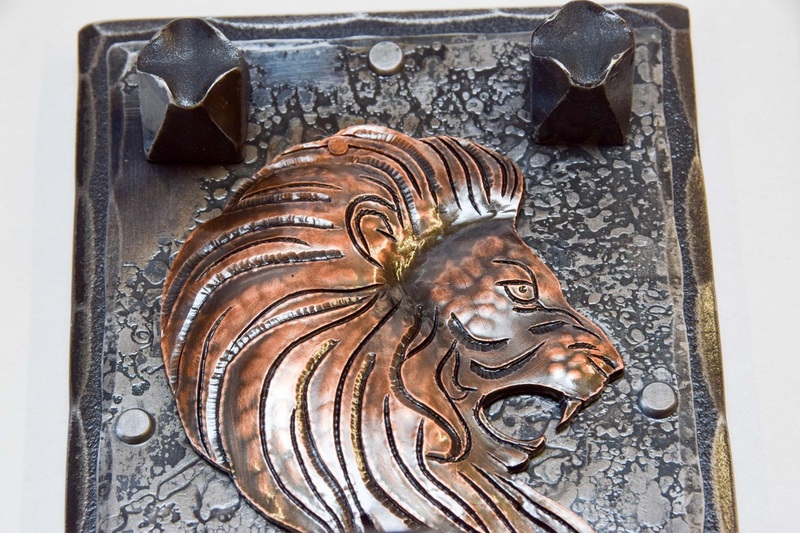 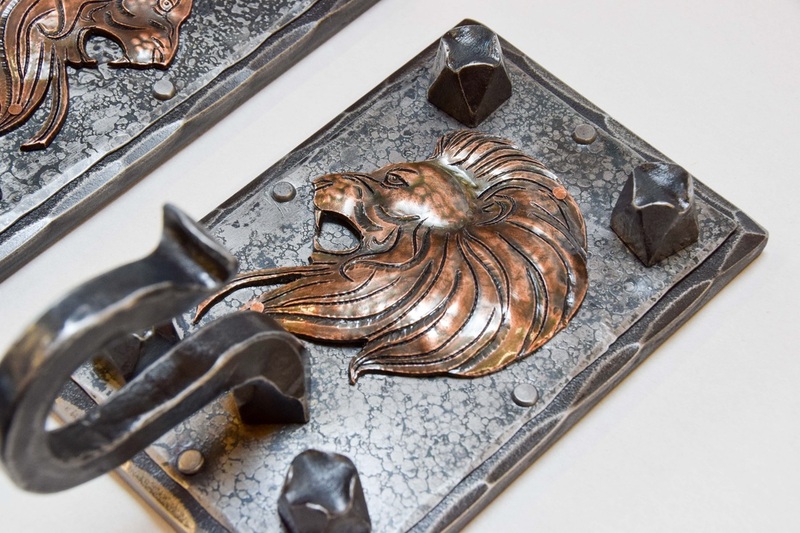 The lion face details were created from copper using chisel and repousee techniques. 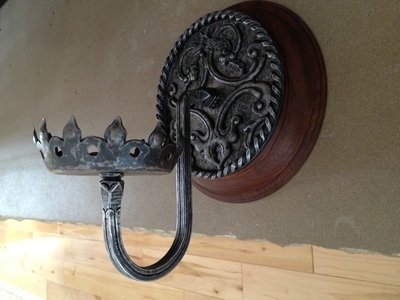 Hand-forged mounting hardware was also included. 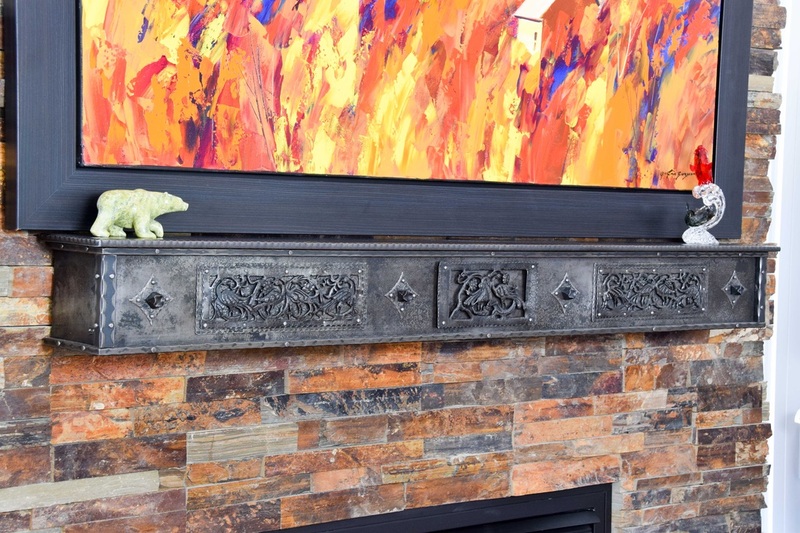 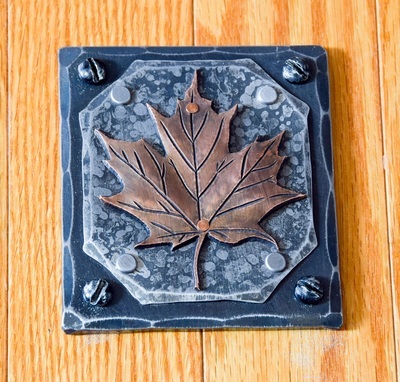 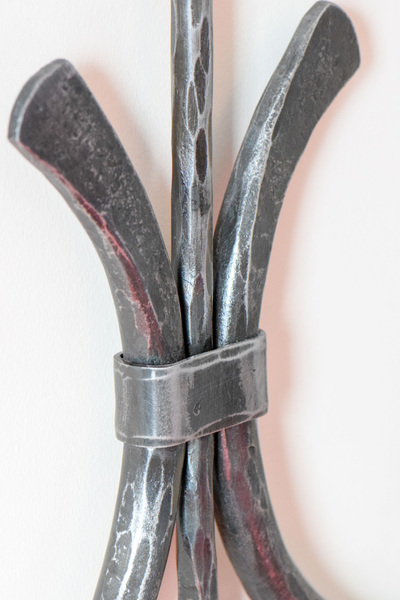 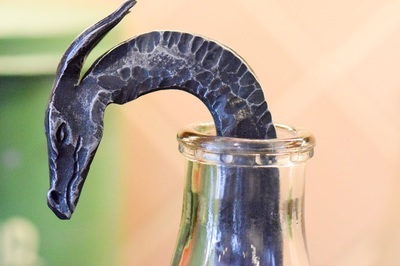 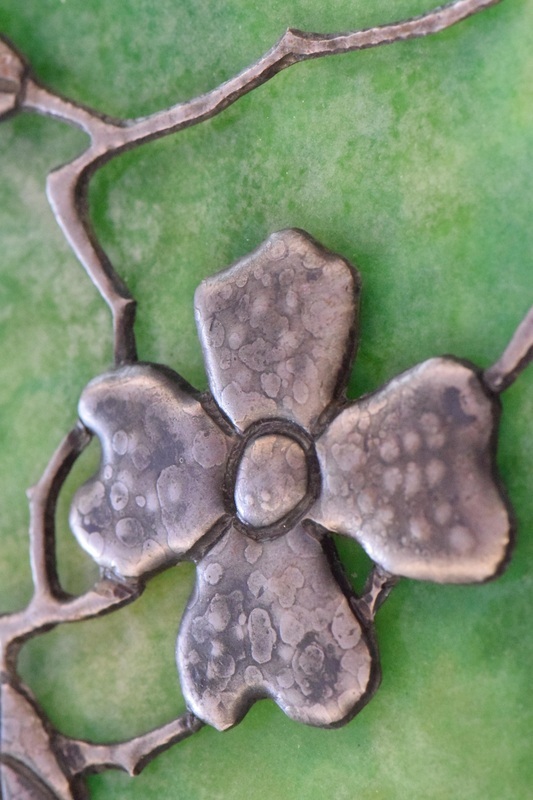 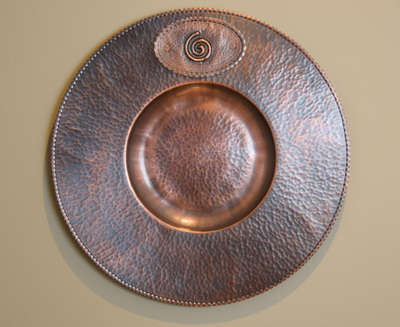 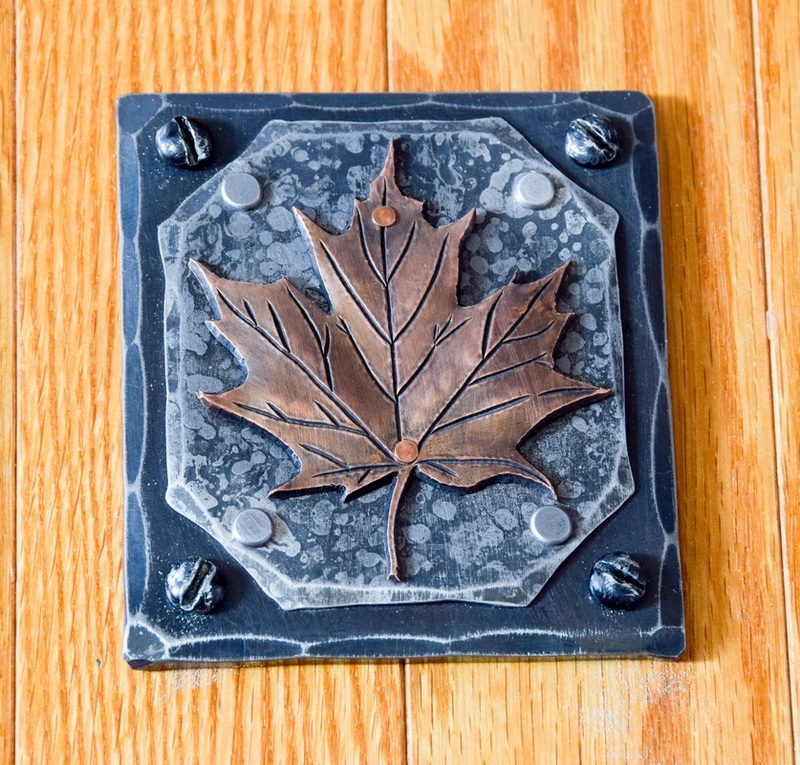 This hand-chiseled iron wall piece was a collaboration effort with fused glass artist Jennifer Kelly. 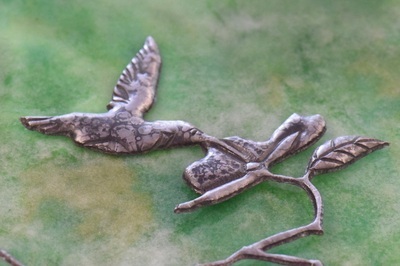 Many hours under the chisel and many trips into the kiln! 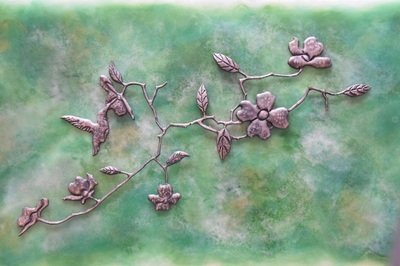 Features flowering dogwood and a hummingbird. 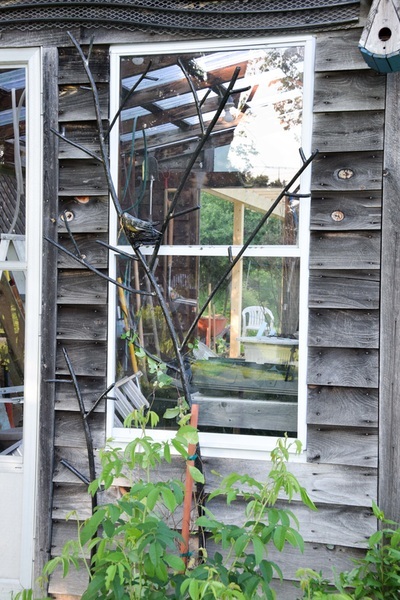 The glass represents the foliage as we look up into the tree and upon this scene. 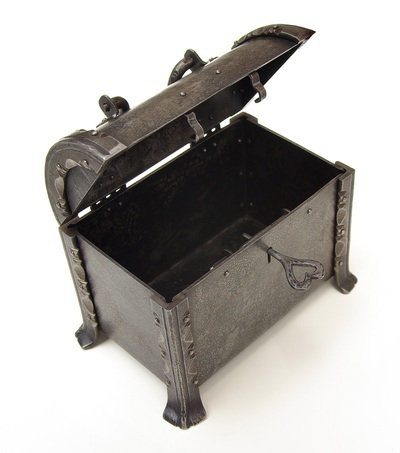 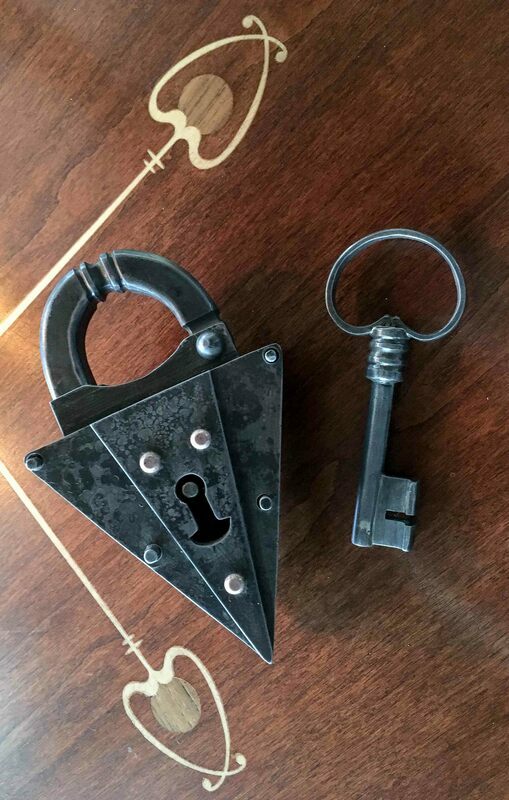 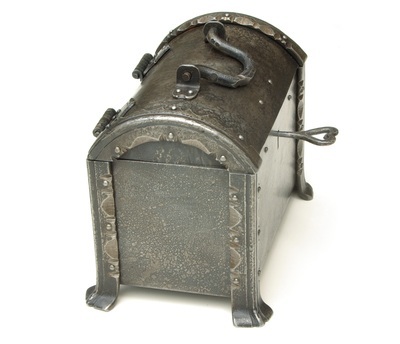 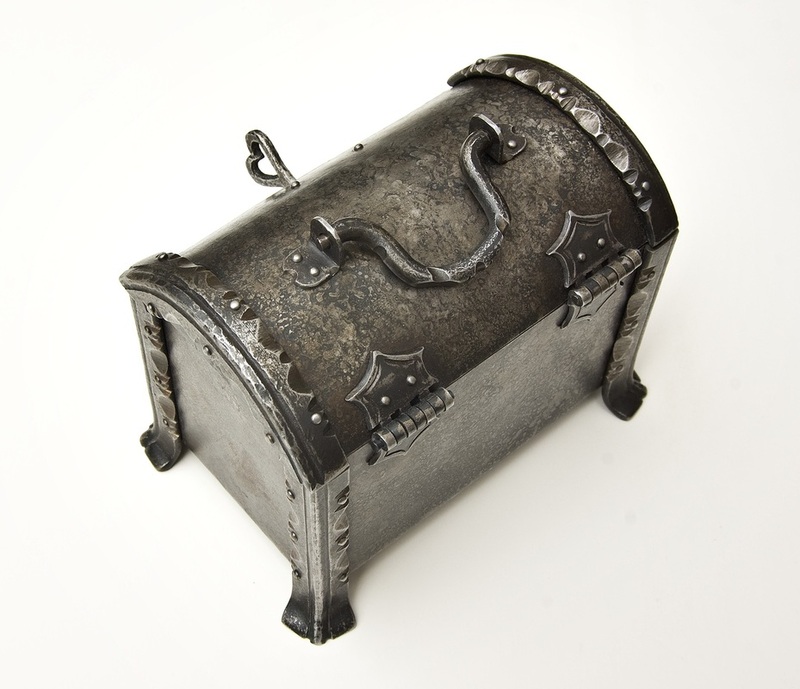 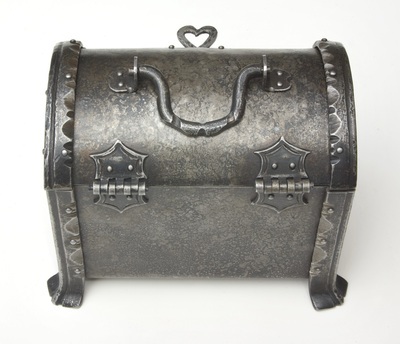 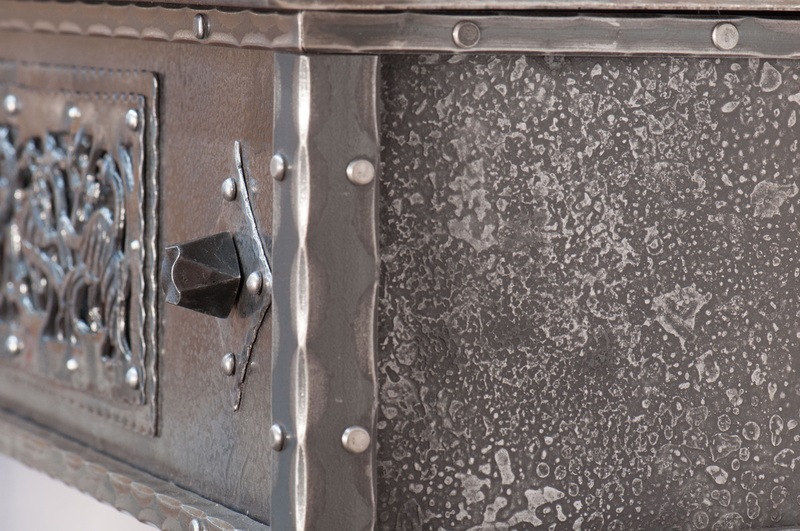 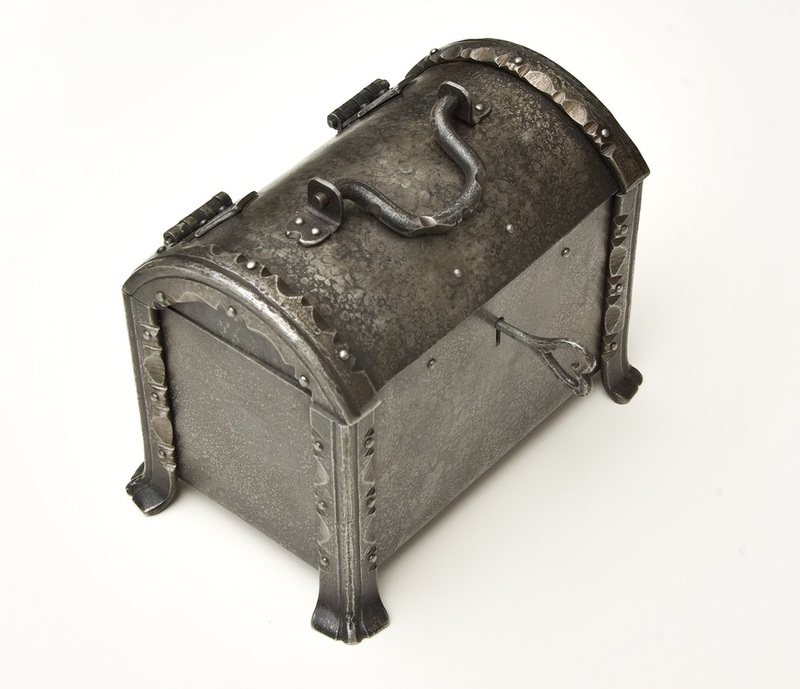 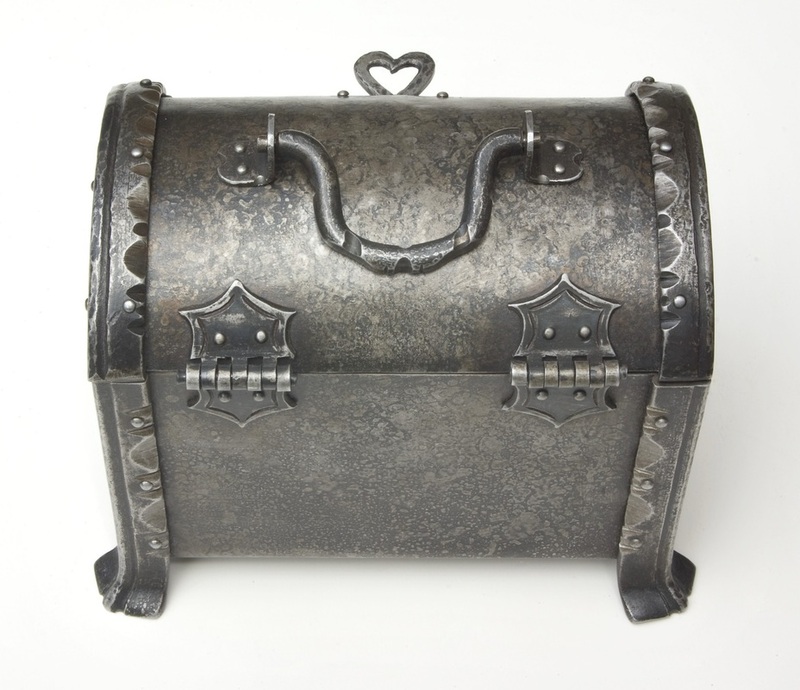 This small treasure chest features a working lock with skeleton key and fully functional miniature barrel hinges. 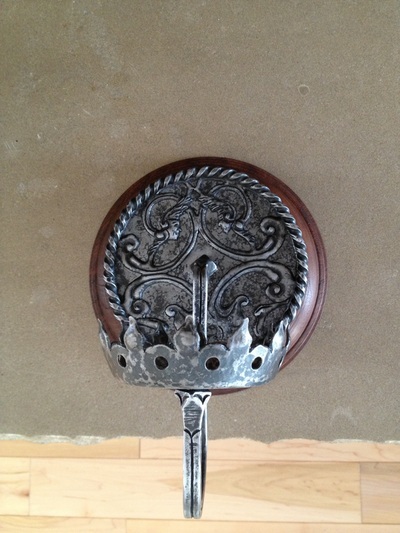 All the details were chased with a chisel by hand and well as many hours of painstaking file work. 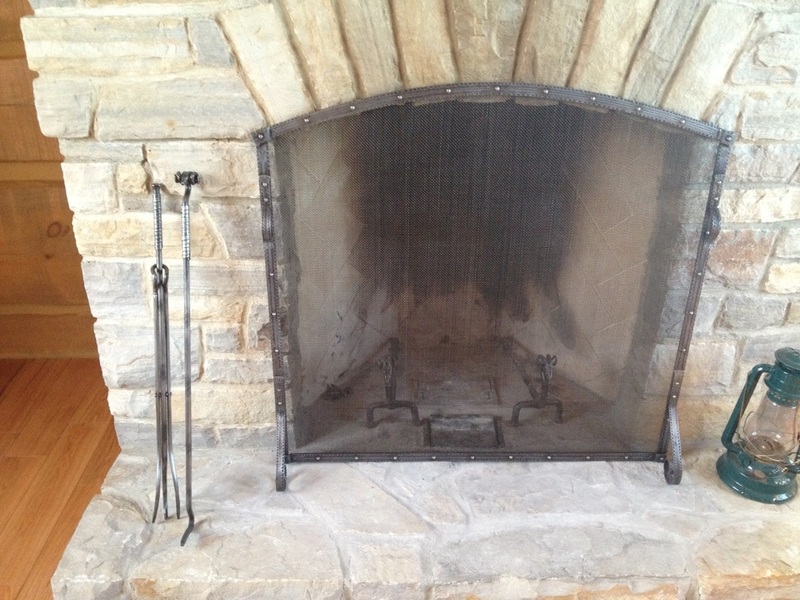 Note the patina that was coaxed out in the coals of a hot fire. This gothic style wall sconce was hand chiselled under a treadle hammer will all details hand filed. 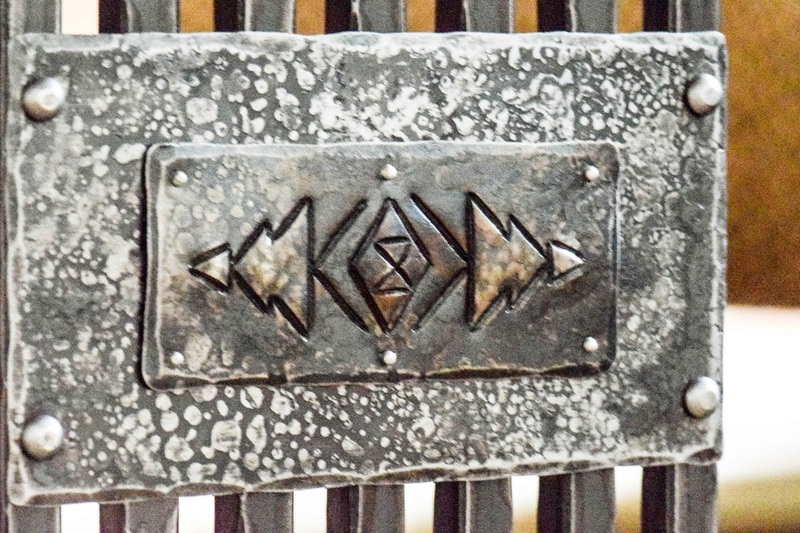 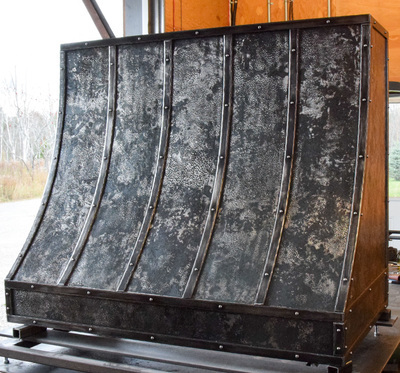 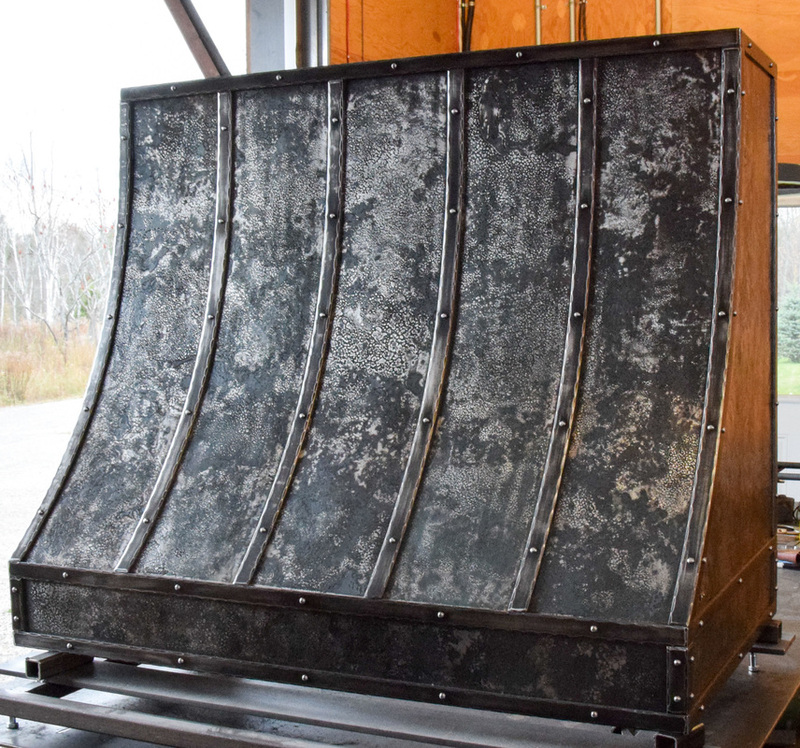 The backplate alone is comprised of 3 different layered and riveted elements. Over 40 hrs of painstaking hand work went into the making of this piece. 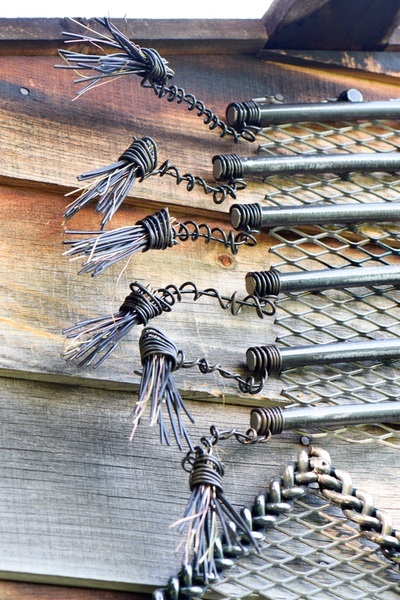 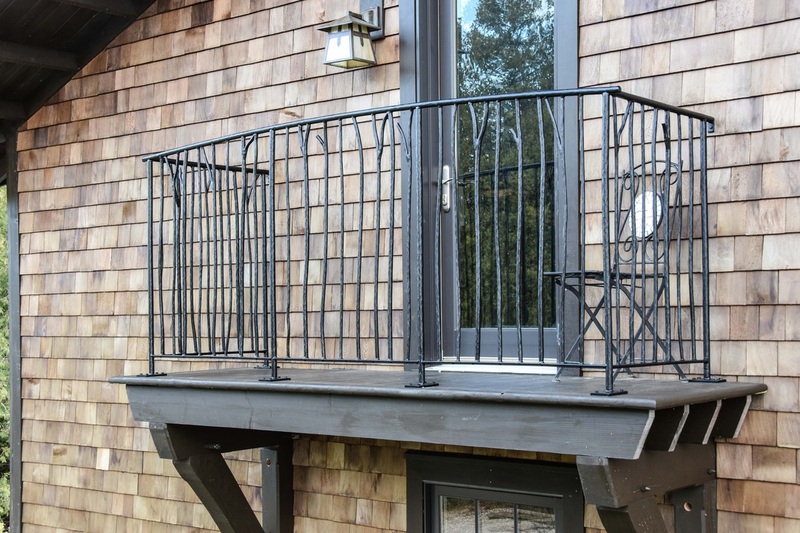 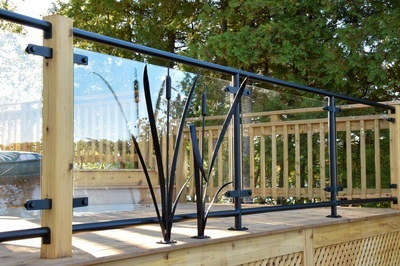 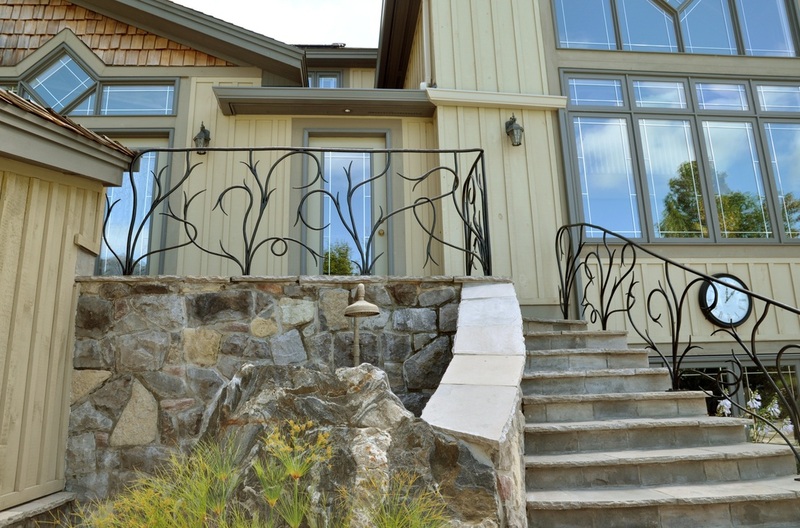 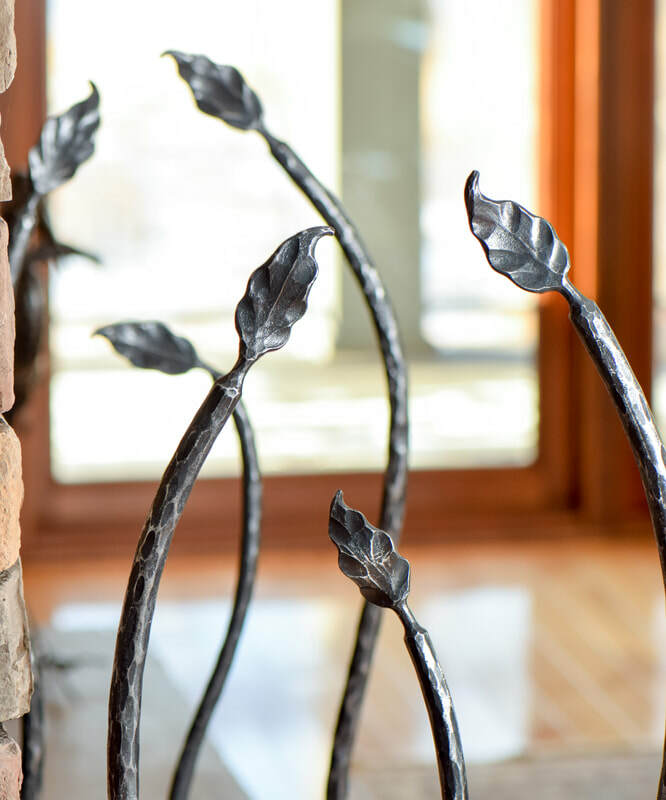 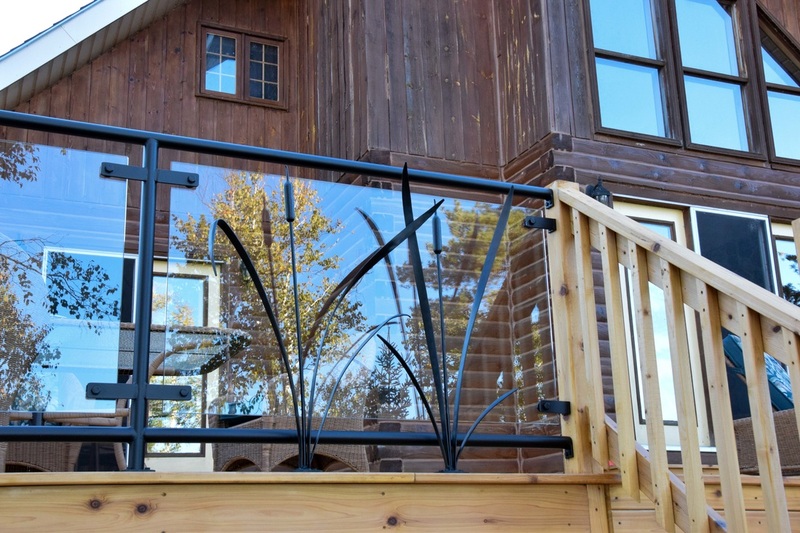 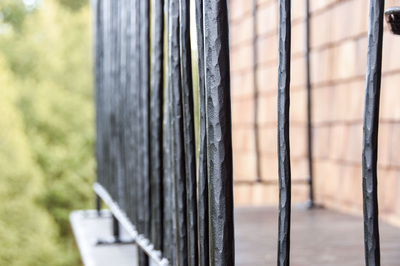 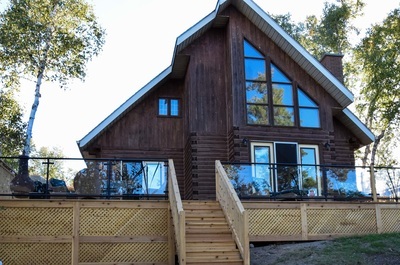 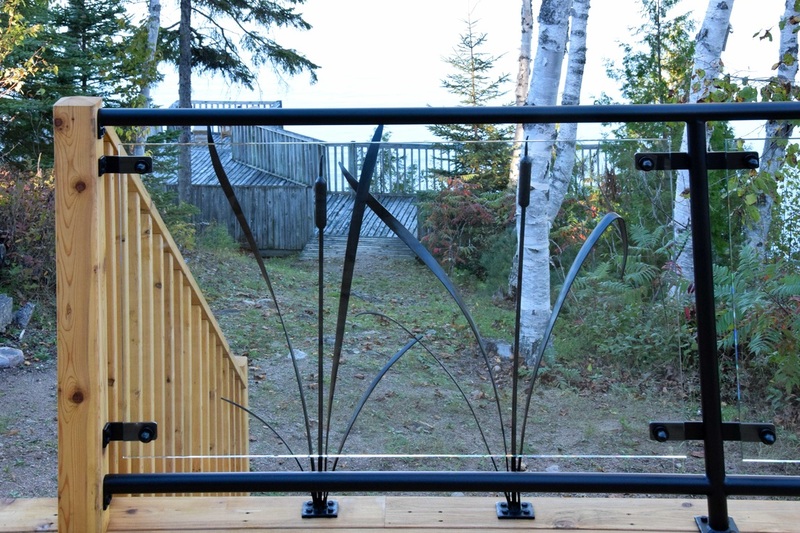 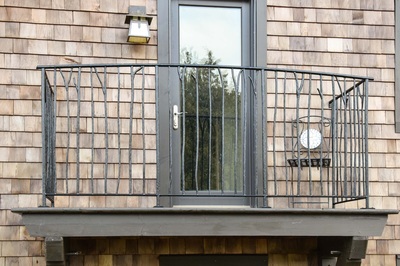 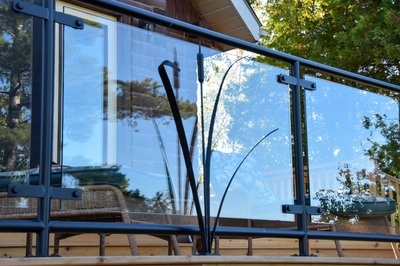 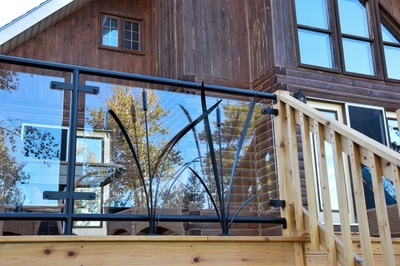 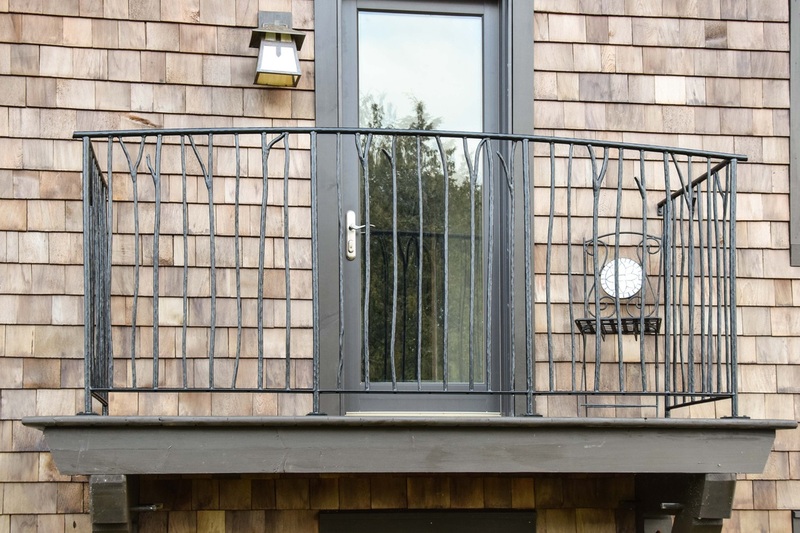 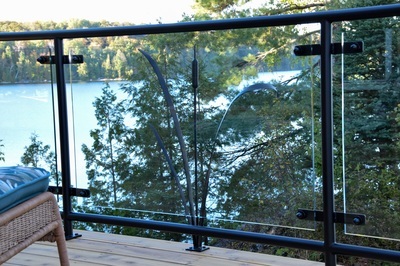 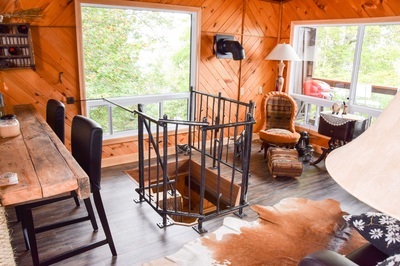 This cottage railing installation features nine glass panels within a steel frame with 5 sets of forged bulrushes. 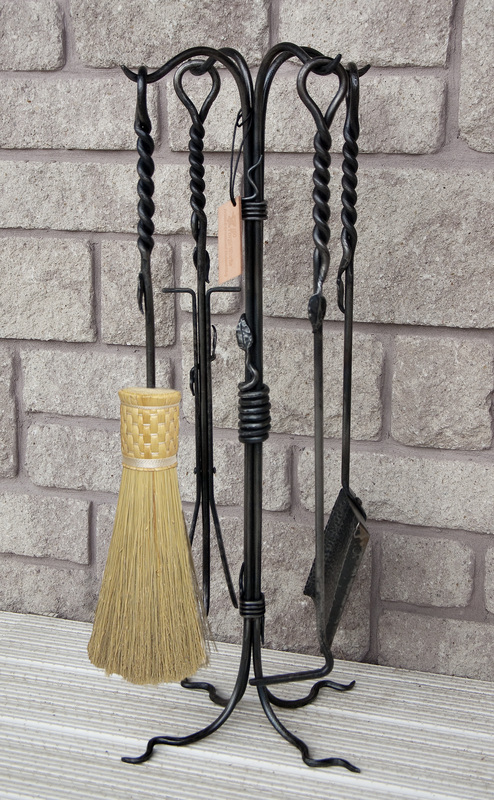 The bulrushes were forged so that they move slightly with the wind. 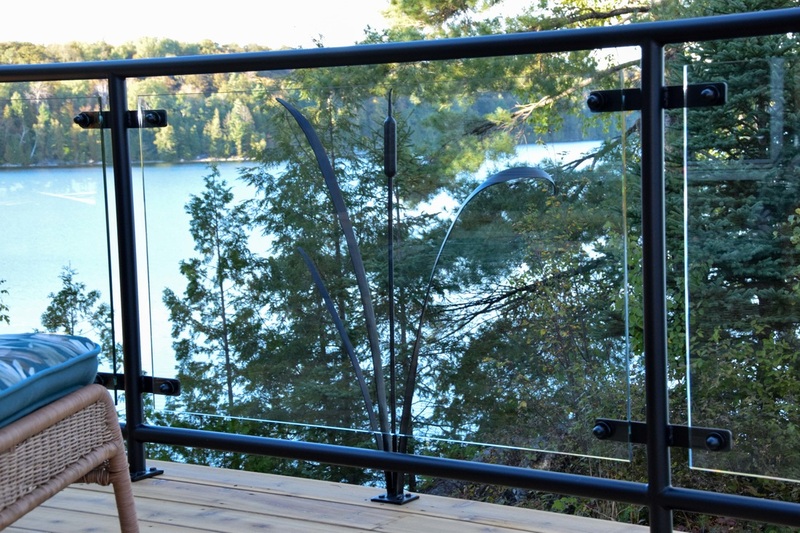 I mounted the bulrushes directly to the deck on the lake side of the glass. 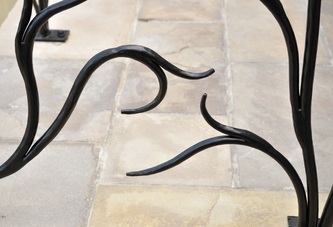 All were protected from the elements by a baked powder coated finish. These handrails were forged from 1" solid stock. The bird was forged from 16g sheet. 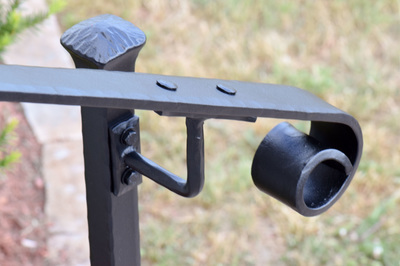 Finish is a baked-on powder coat. 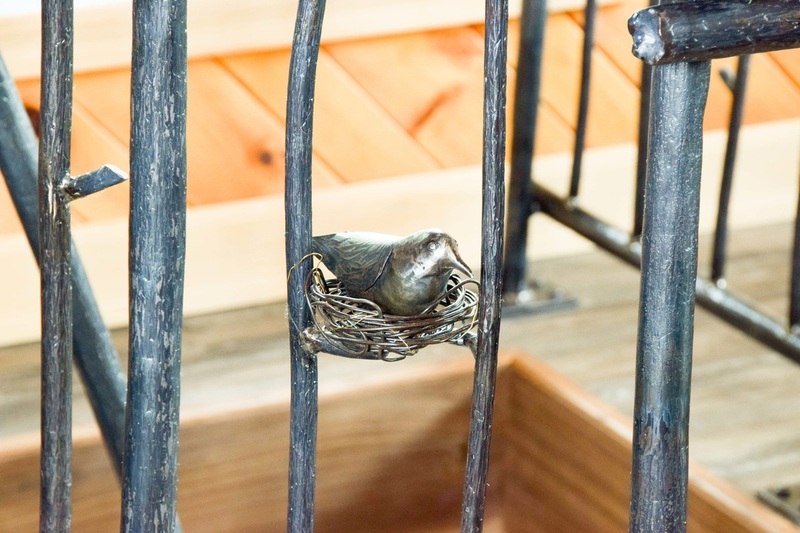 This cottage railing features a robin with nest and a woodpecker. 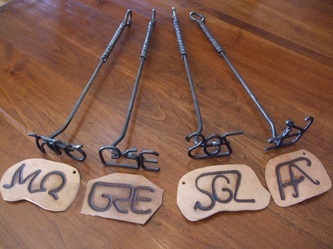 The elements were forged to look like they were harvested from the woods around the cottage. I wanted the ends of posts to look like they had been collecting water over the years and were starting to hollow out. 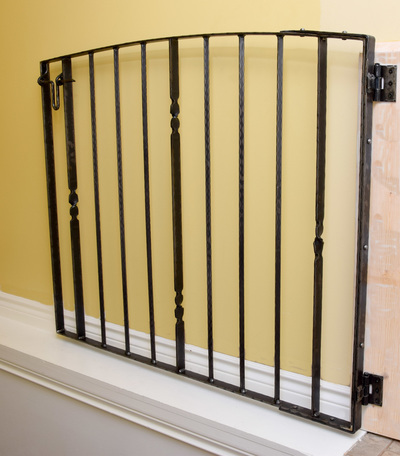 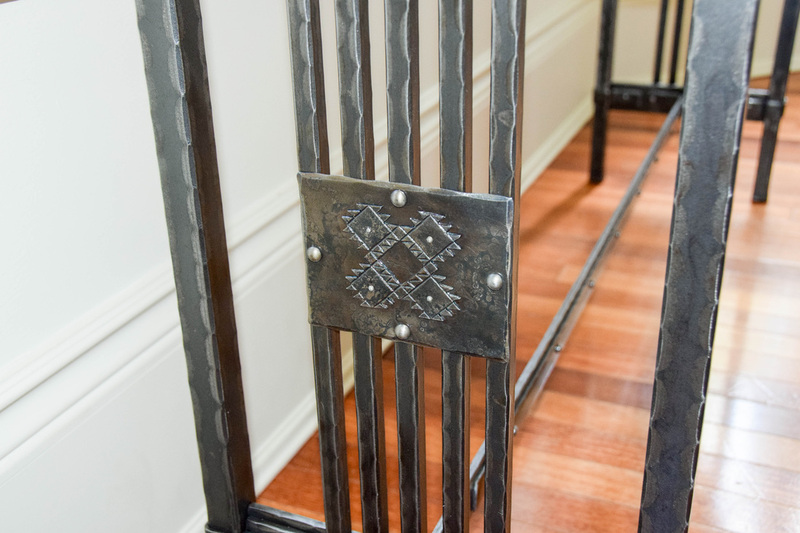 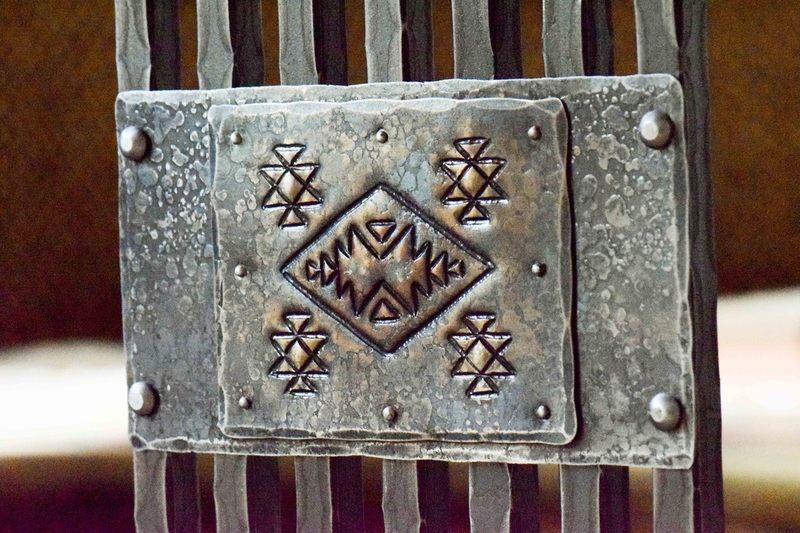 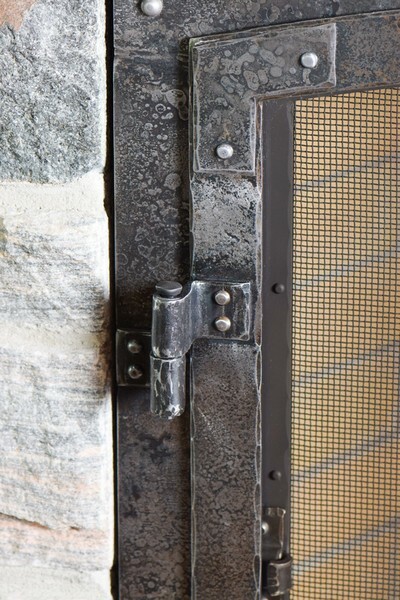 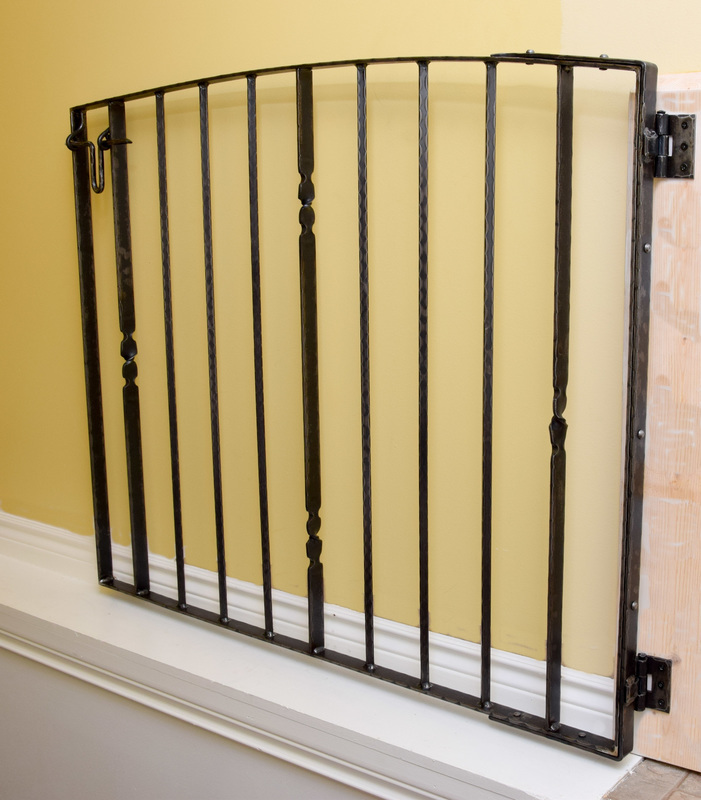 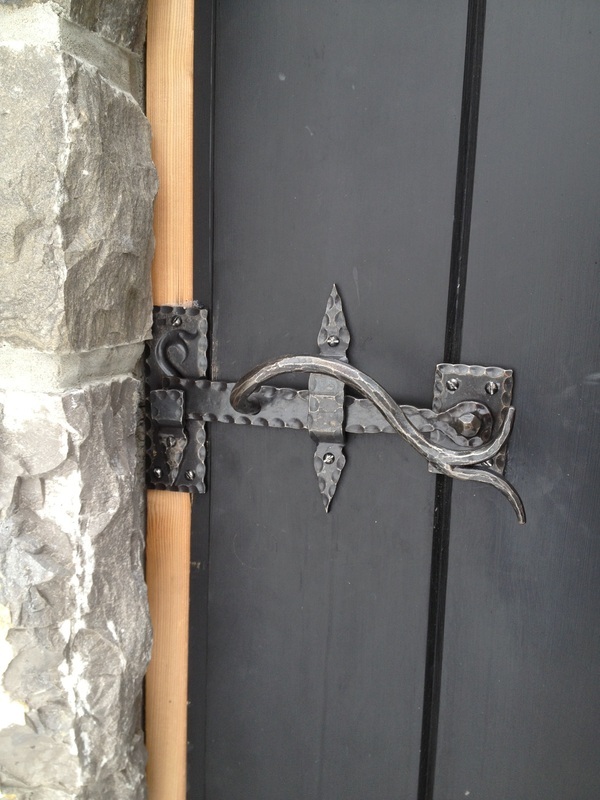 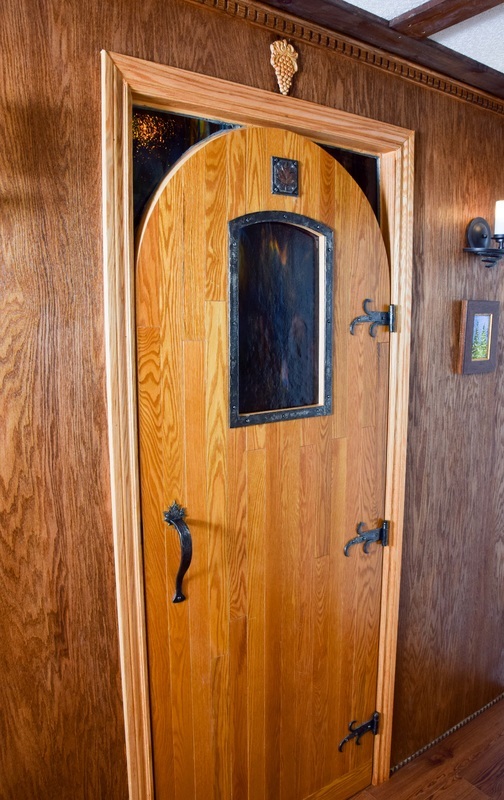 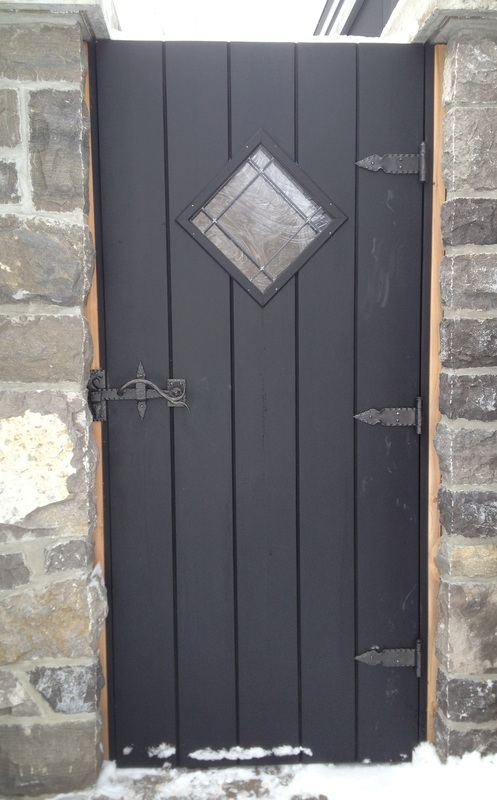 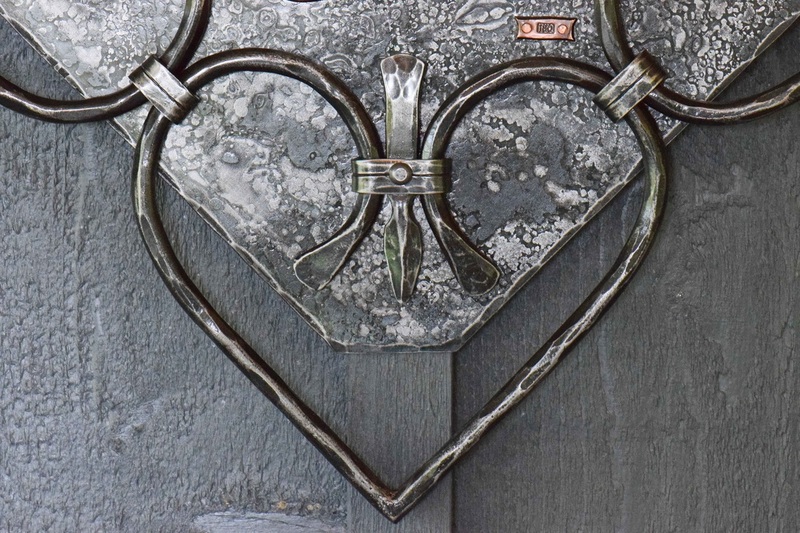 This interior gate for a set of stairs features hand-forged hinges and a warded lock. 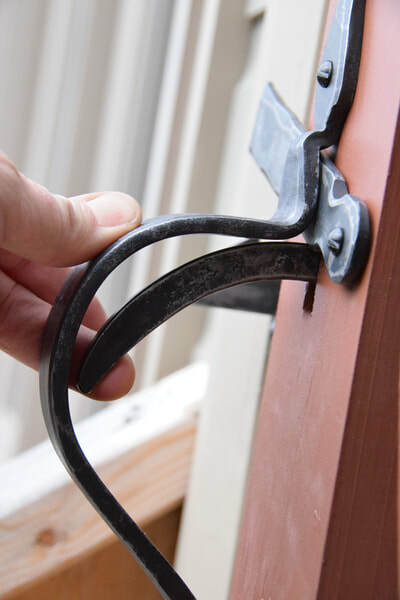 To slide back the latch, it first needs to be lifted up 90 degrees. 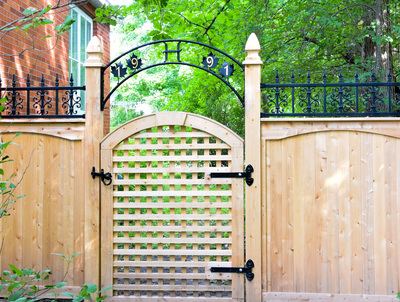 The client wanted to be able to keep the gate open and out of the way when not in use. To do so, I installed a small rare earth magnet in the baseboard along the wall. 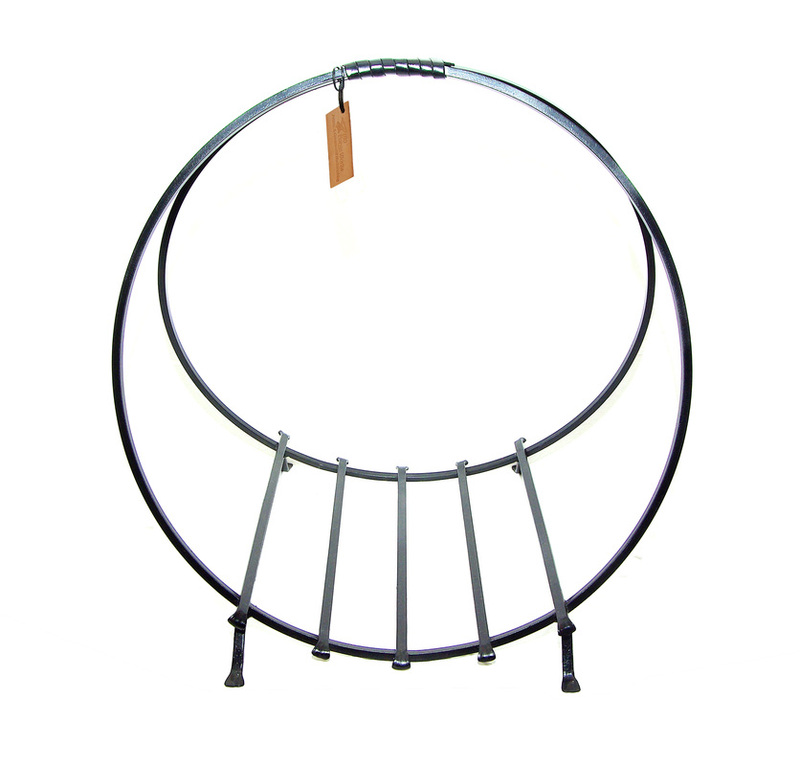 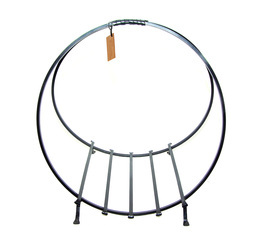 A slight tug on the frame releases the magnet's grip and the gate swings closed. 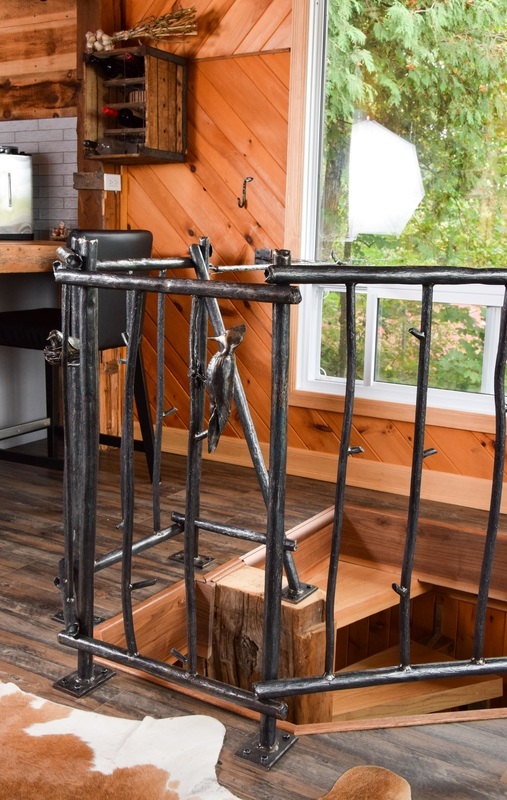 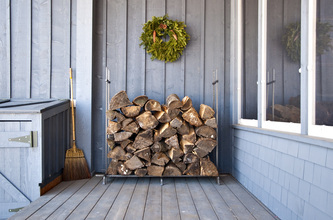 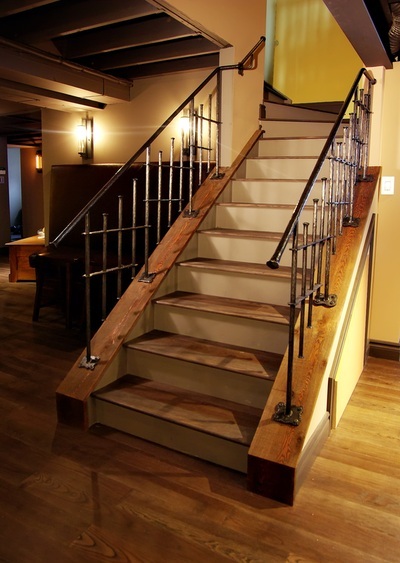 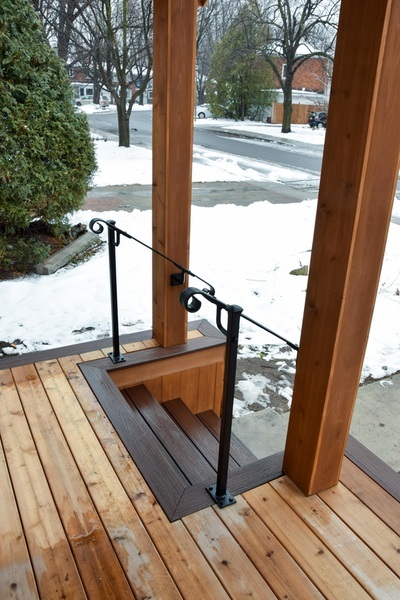 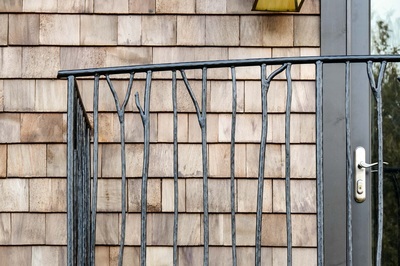 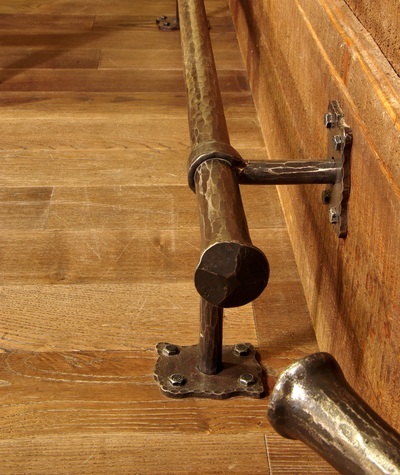 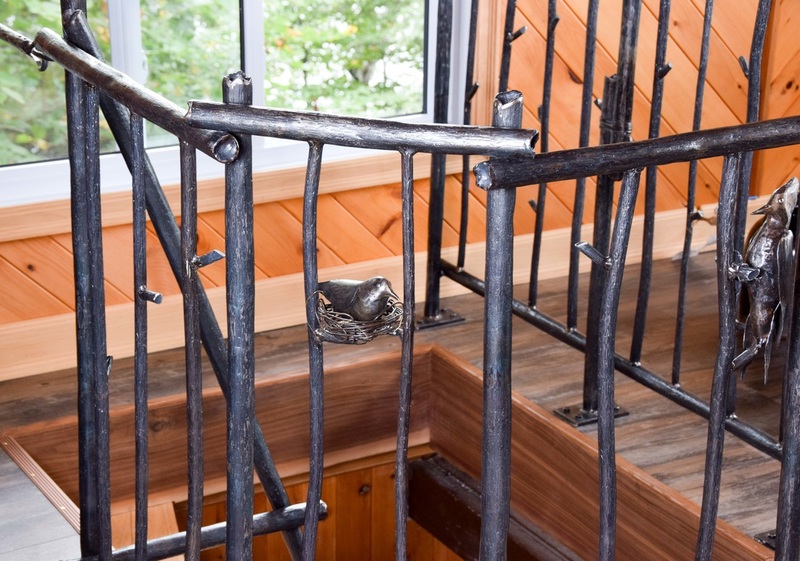 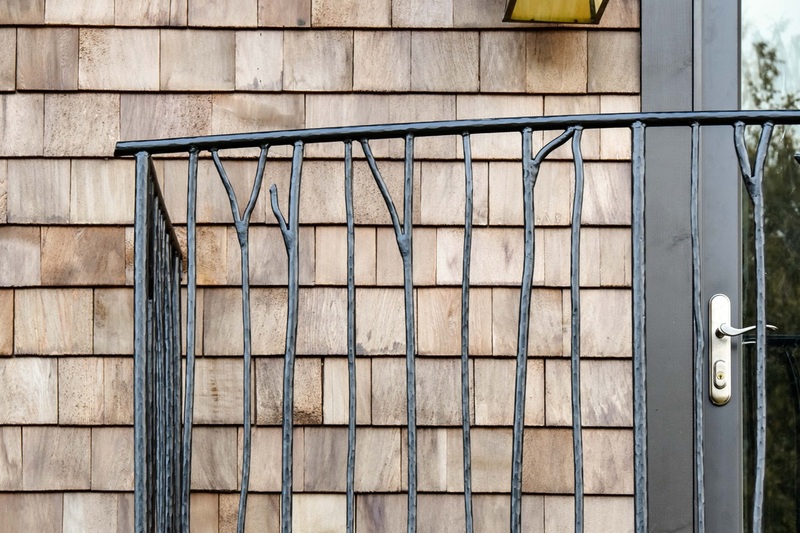 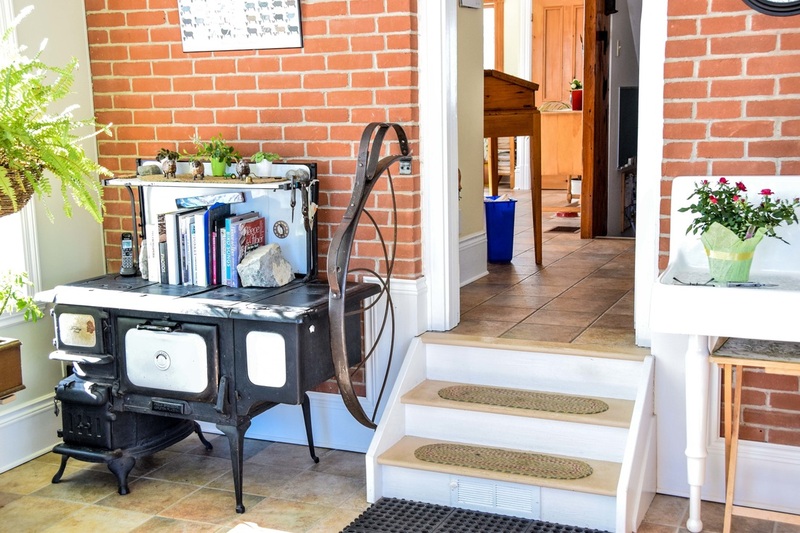 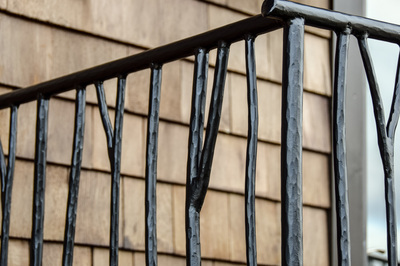 This handrail was created out of reclaimed farm implements. 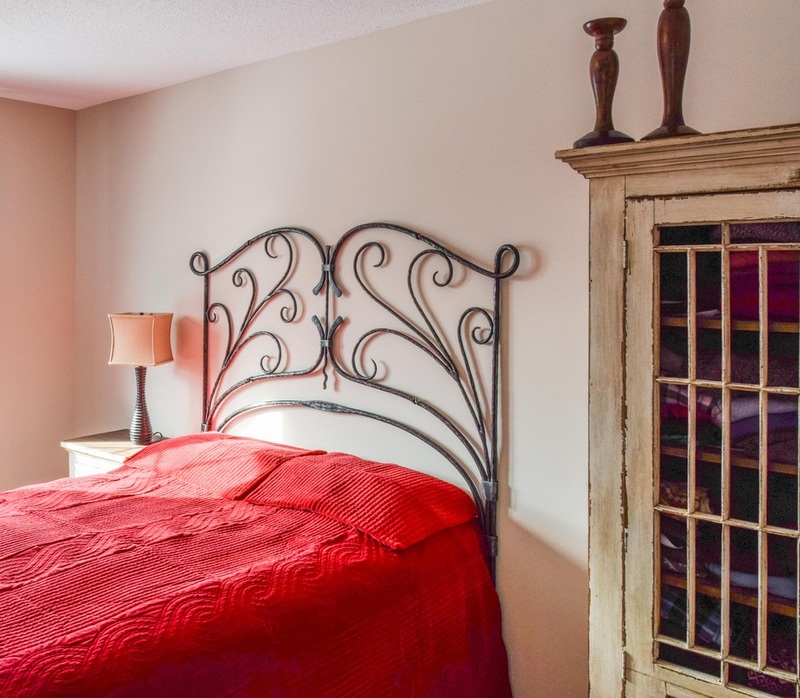 The clients own a beautiful farm and came up with the layout for the piece with elements found around their place. 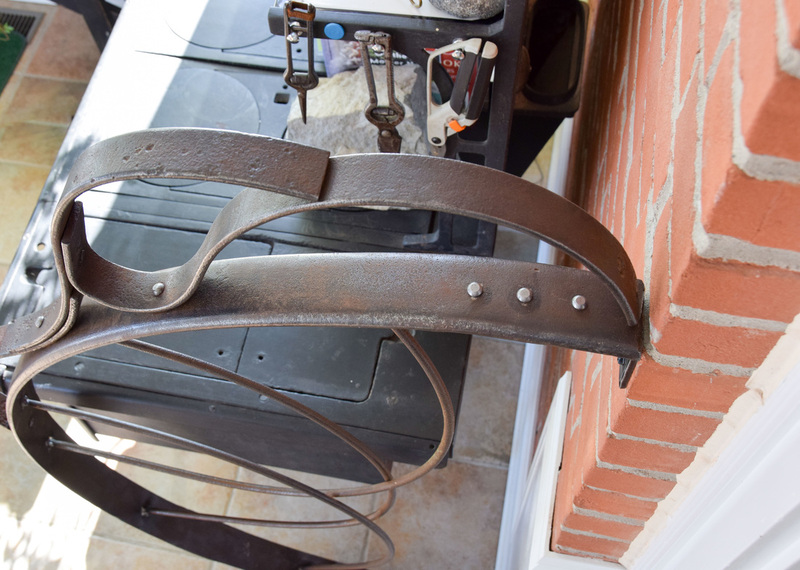 Working with old wrought iron and other mystery metal can be challenging but this time, everything played nicely in my forge and it was a pleasurable project from start to finish. 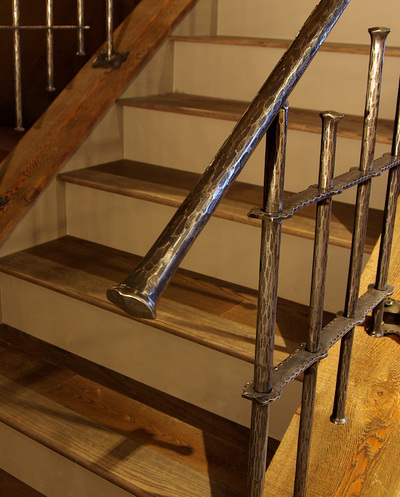 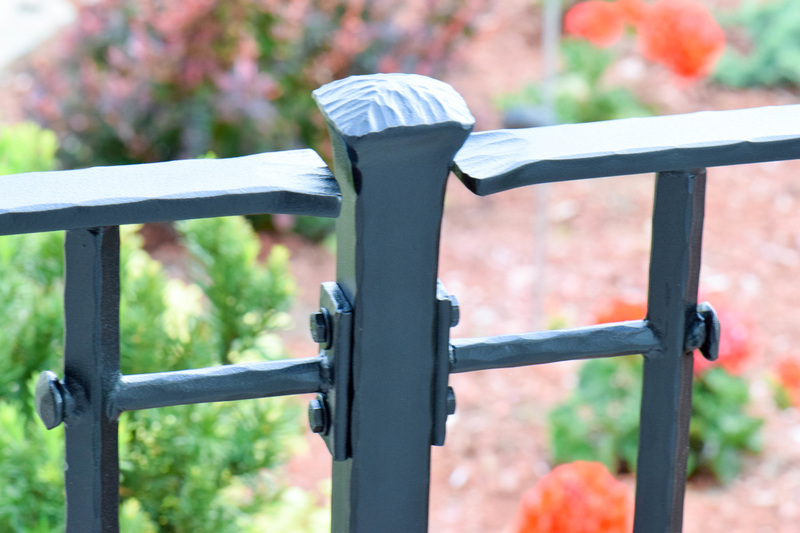 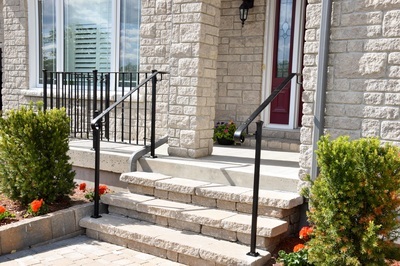 The posts for this handrail are 1-1/4" solid steel with hammered edges with upper end upset to 1-1/2" wide and peened. 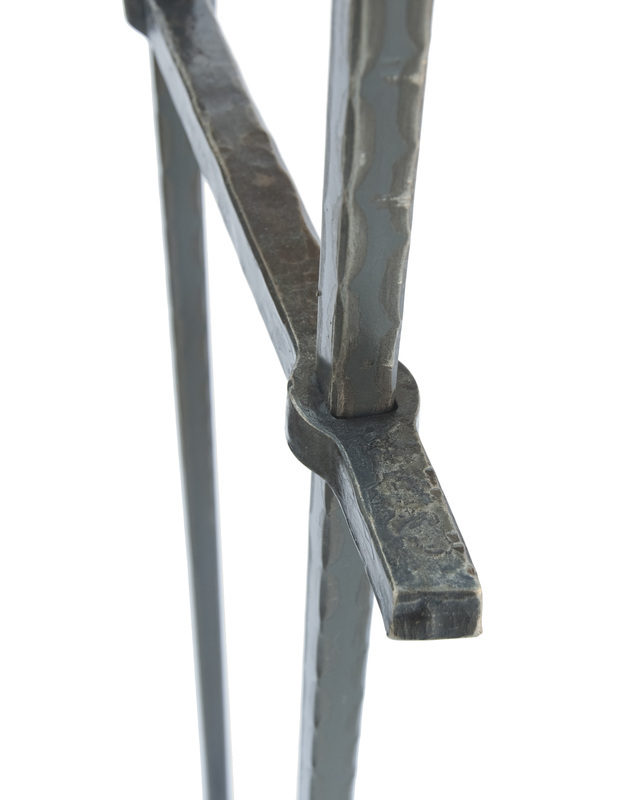 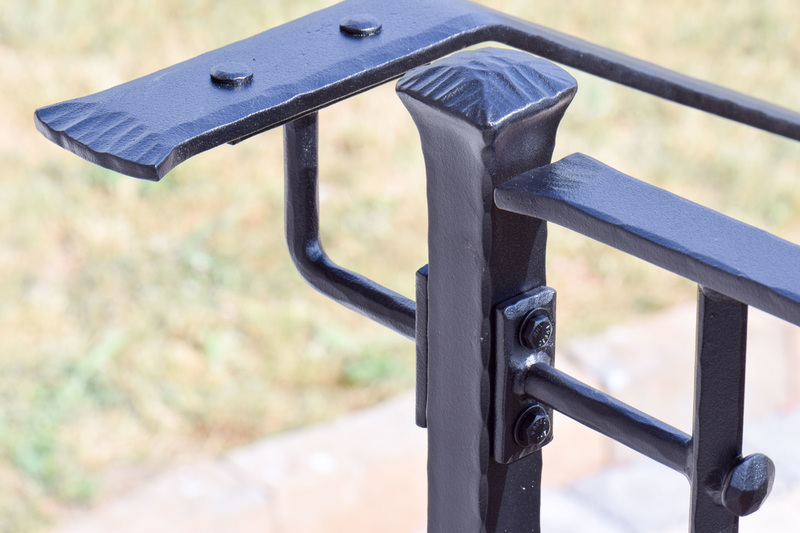 The square bar holding the handrail grip is oriented on the diamond and transitions into a tenon through the post. 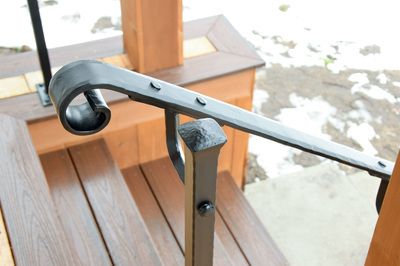 The handrail grip's edges are beveled and the scroll ends are slightly fishtailed to add visual dimension. 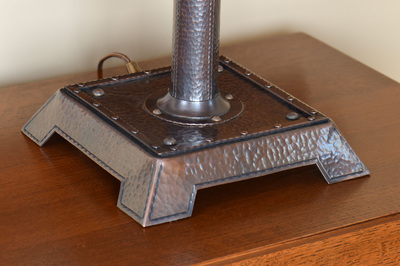 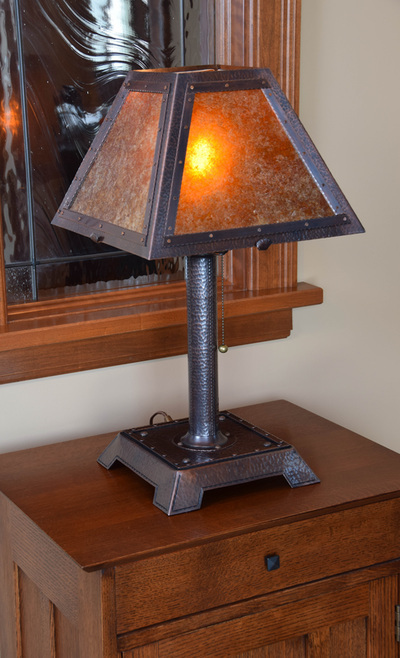 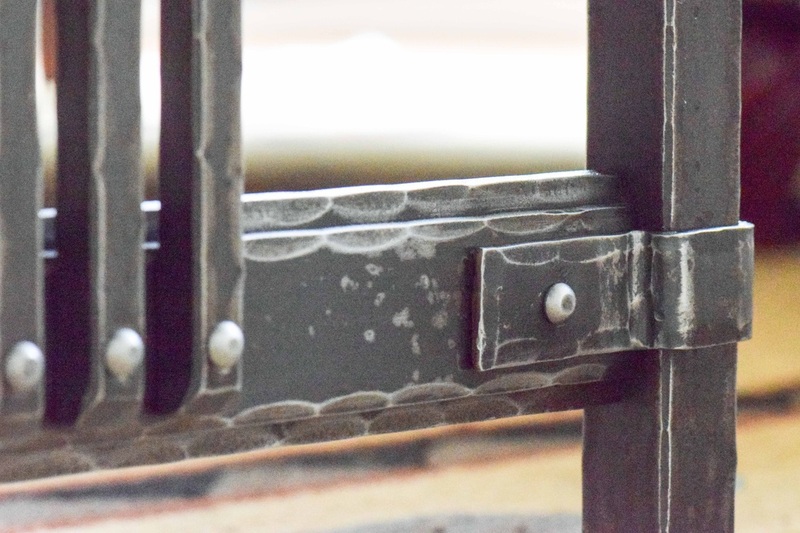 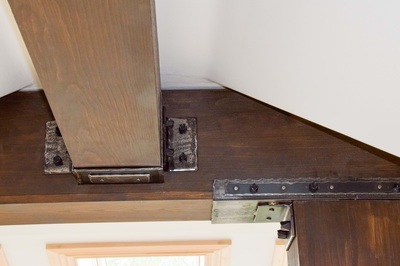 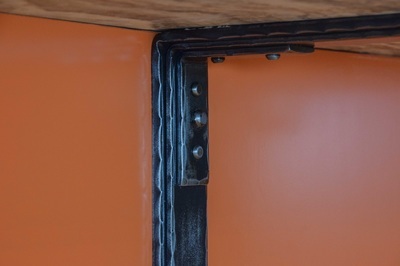 Rivets complete the look for this Arts and Crafts style forging. 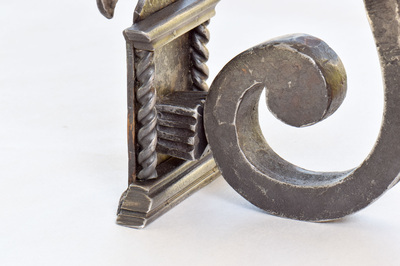 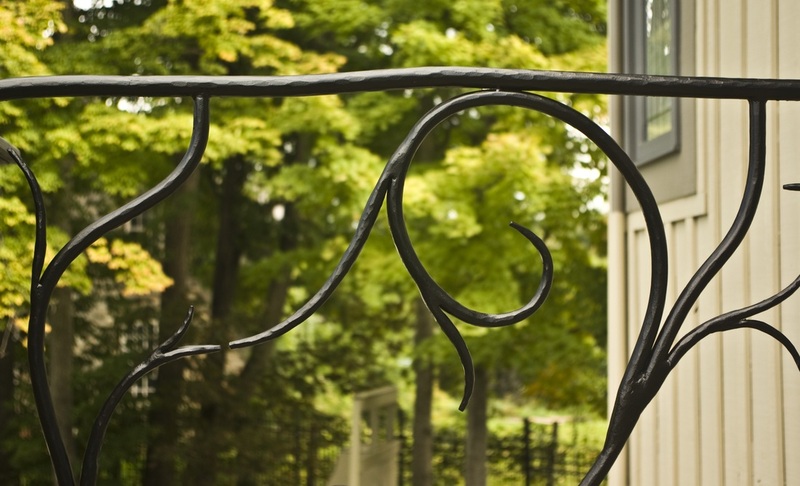 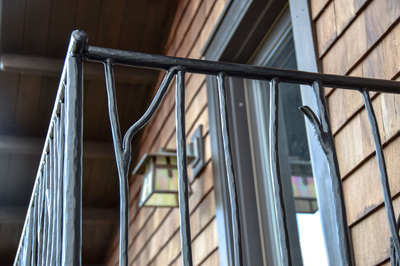 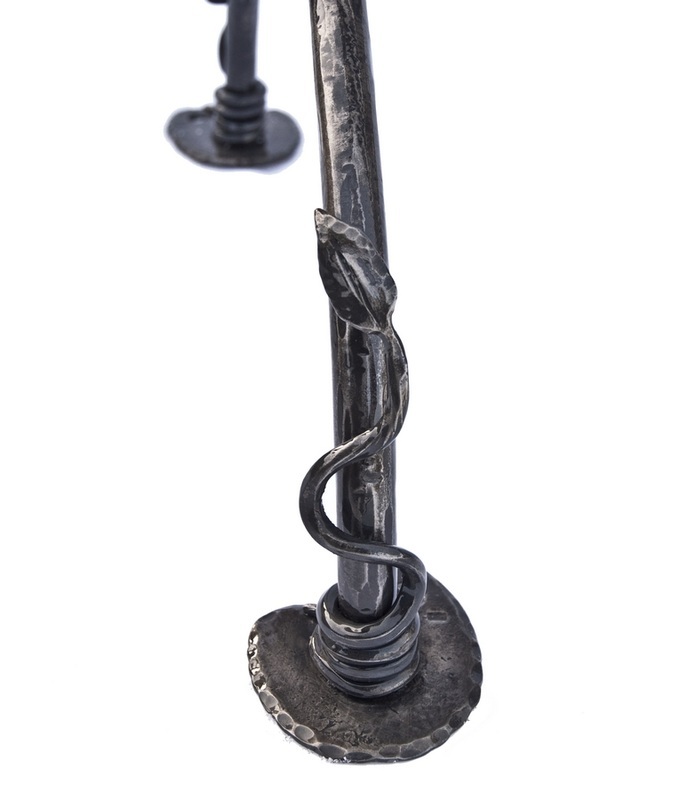 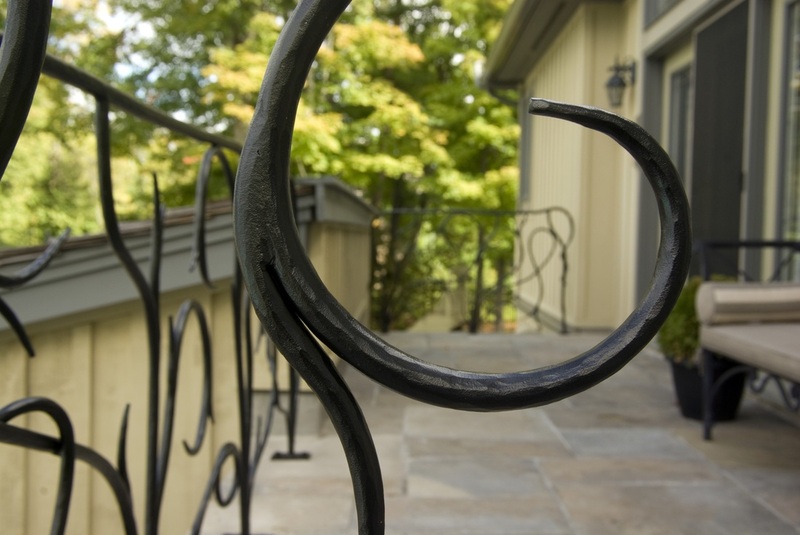 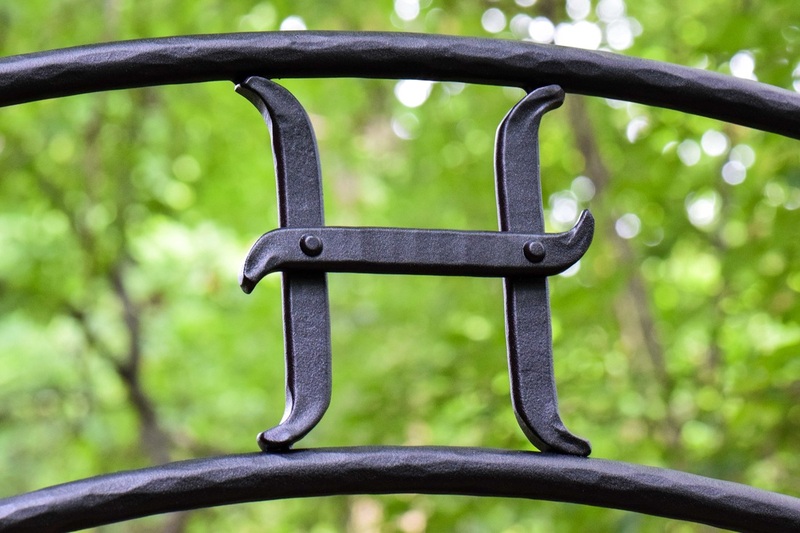 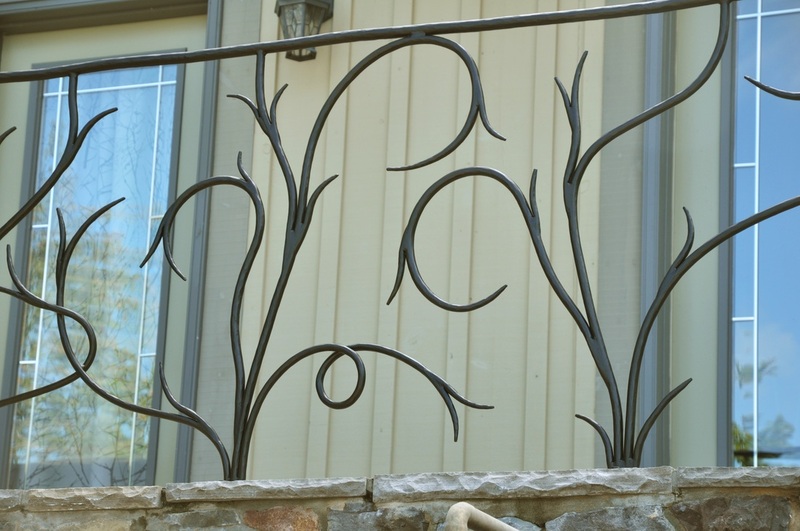 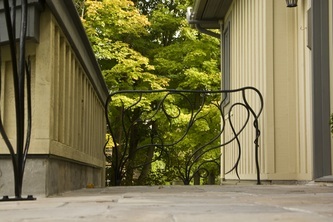 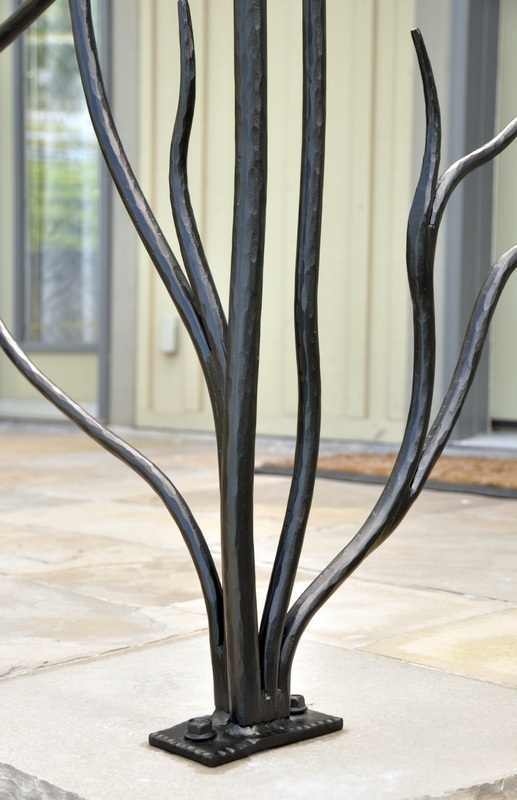 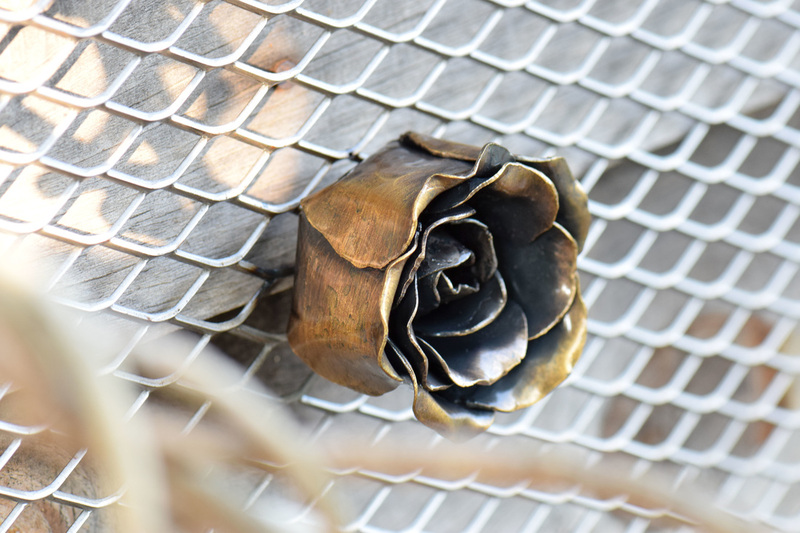 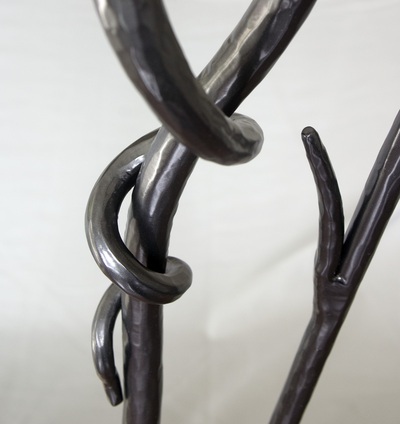 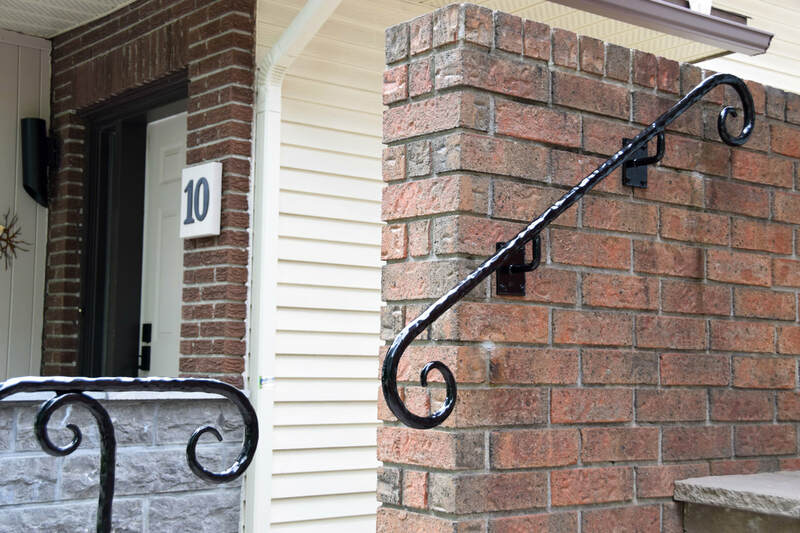 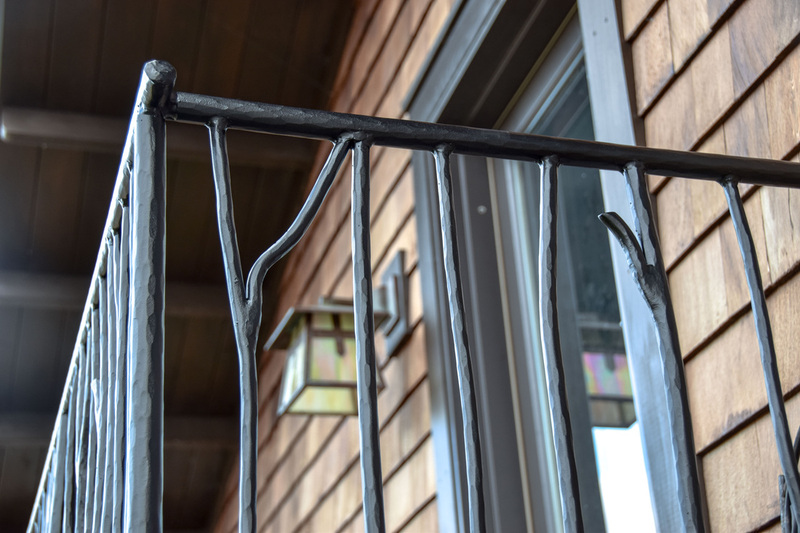 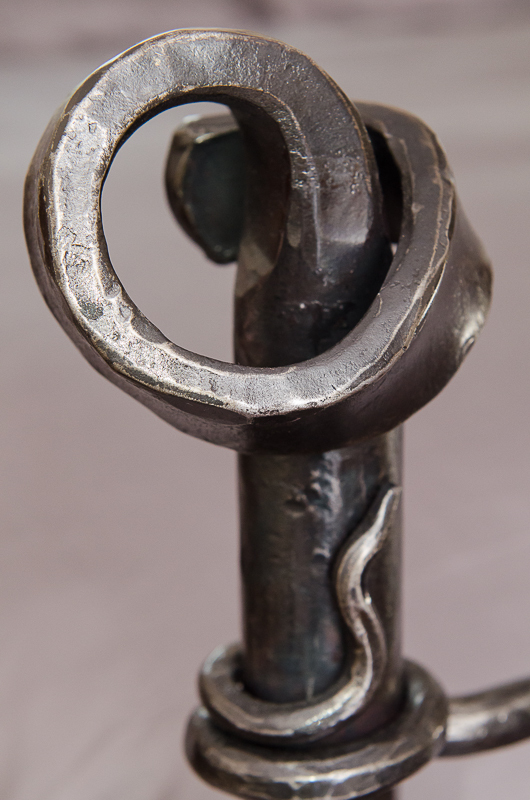 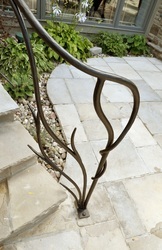 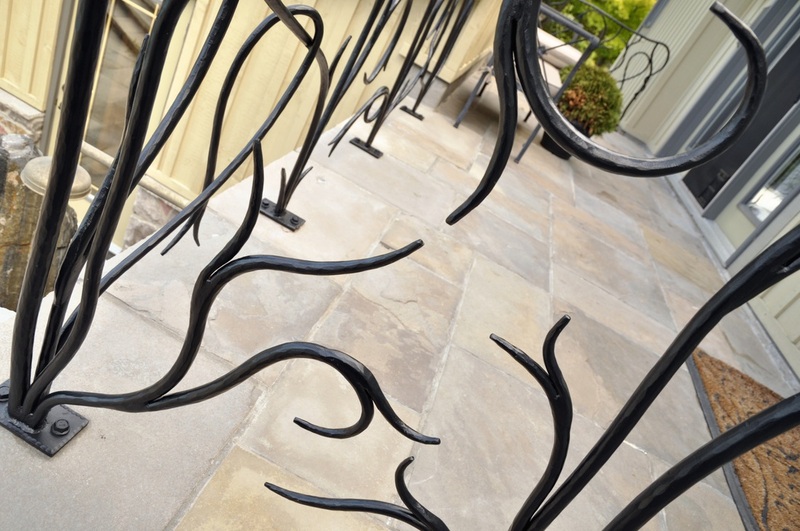 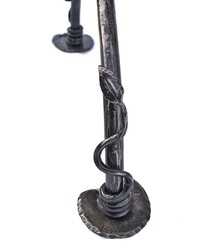 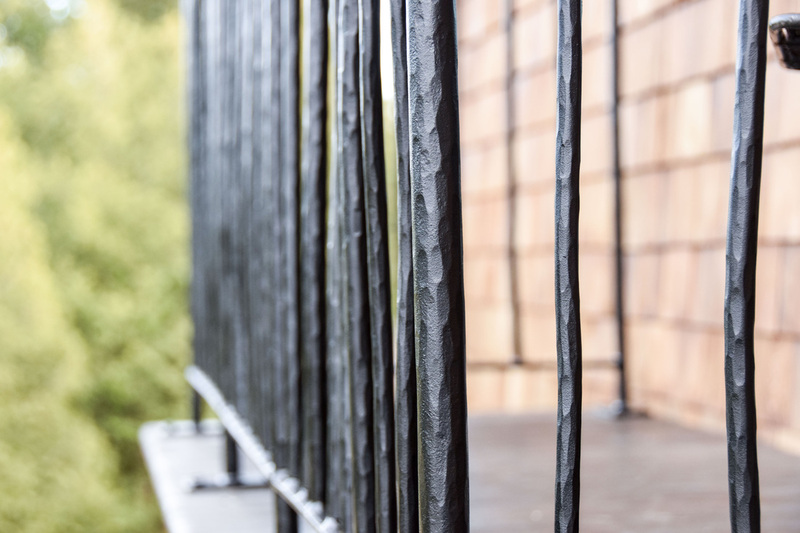 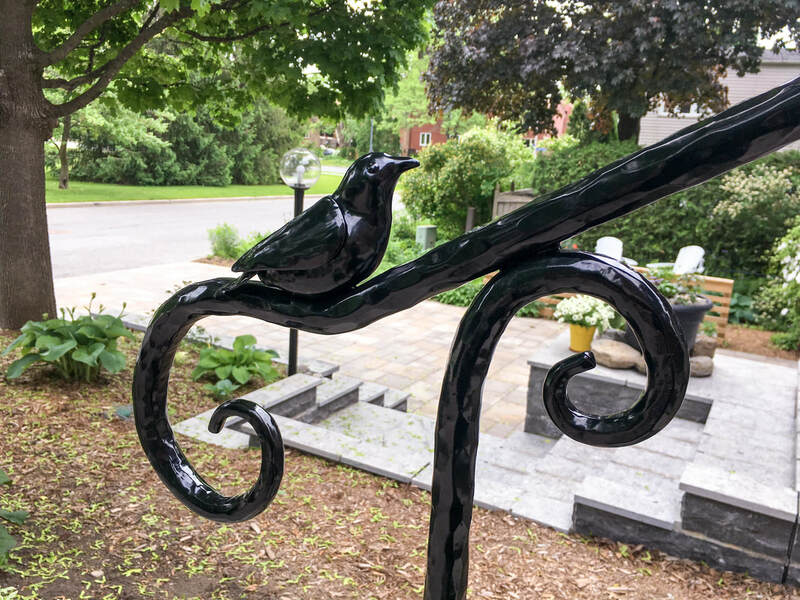 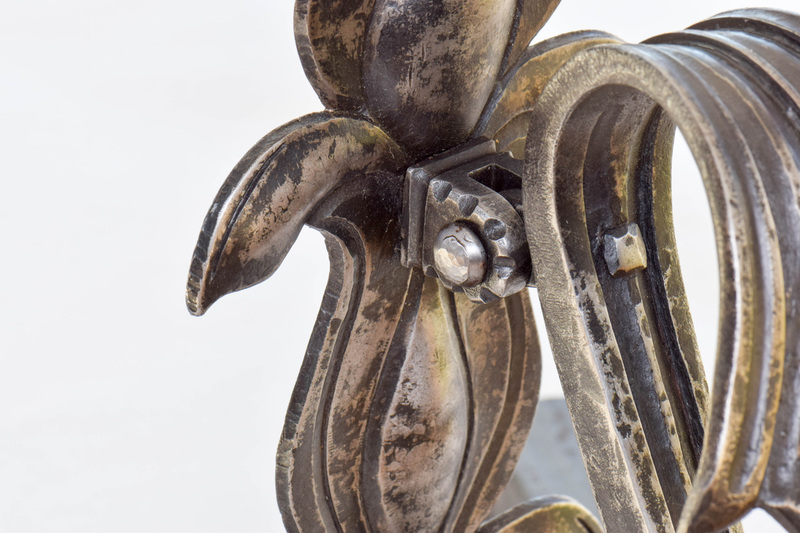 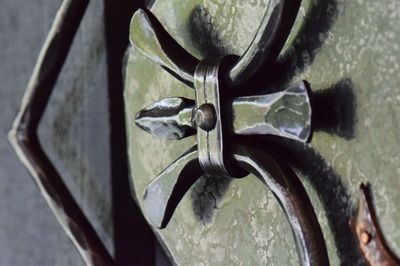 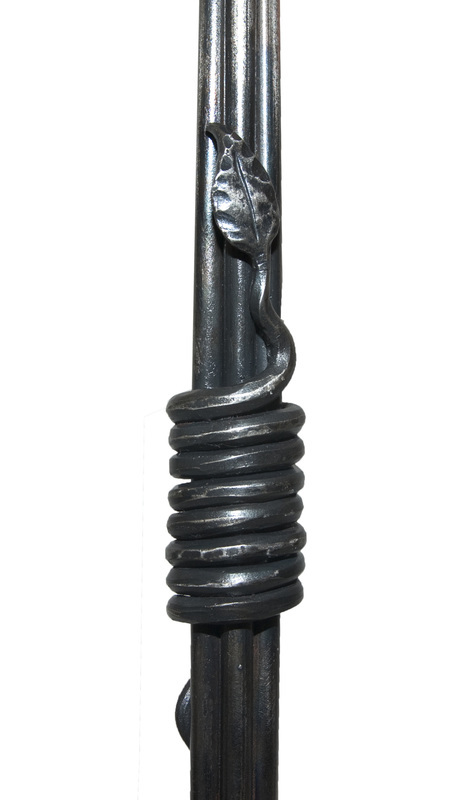 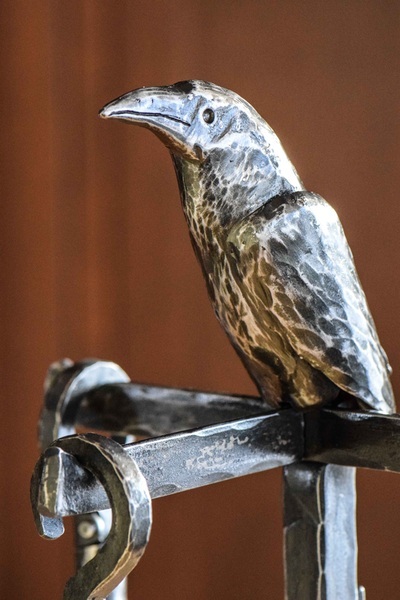 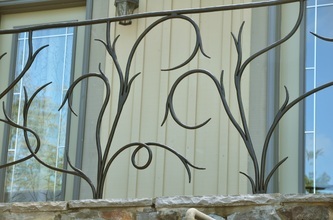 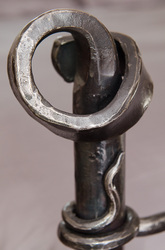 Similar to the handrails in the previous commission, this forging extends the theme to the porch railing as well. 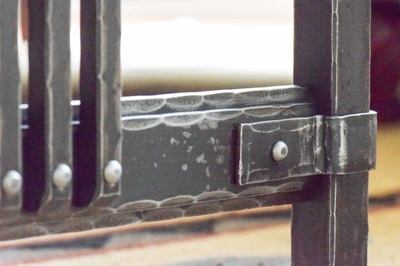 Note the hammer-texturing on the post tops which complements the flared ends on the horizontal railing elements. All fasteners used are of high quality stainless steel - including the ones into the concrete porch deck. 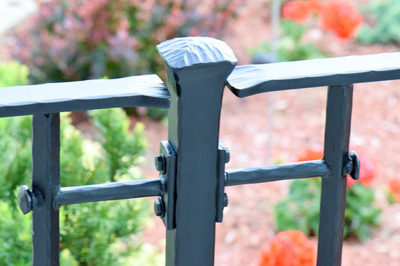 The finish is a slightly textured powder-coated paint process which will give years of maintenance-free enjoyment. 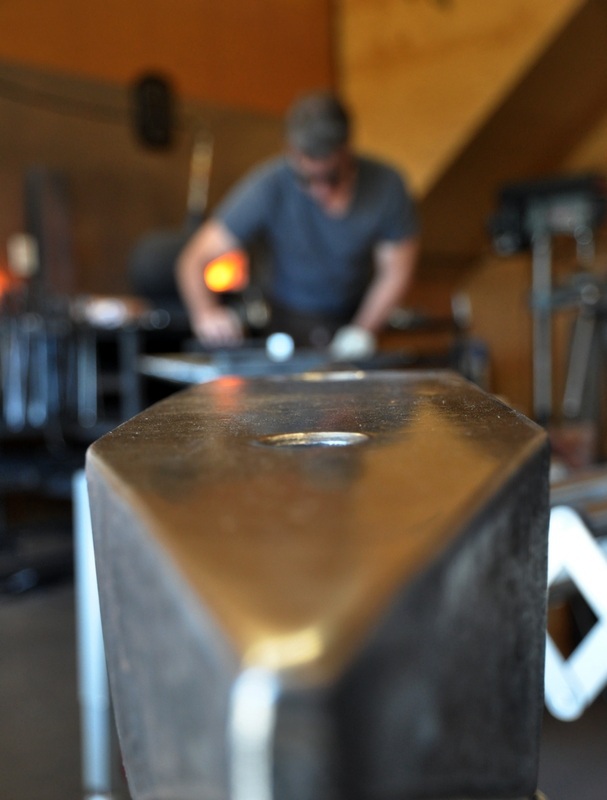 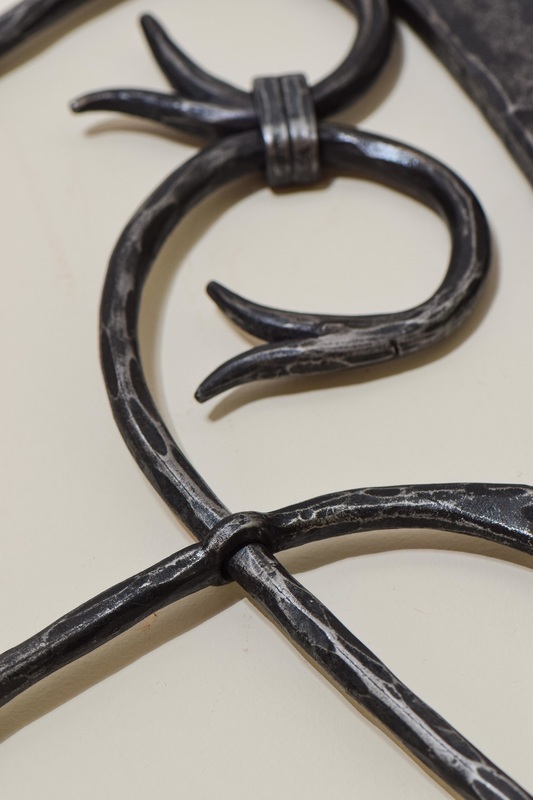 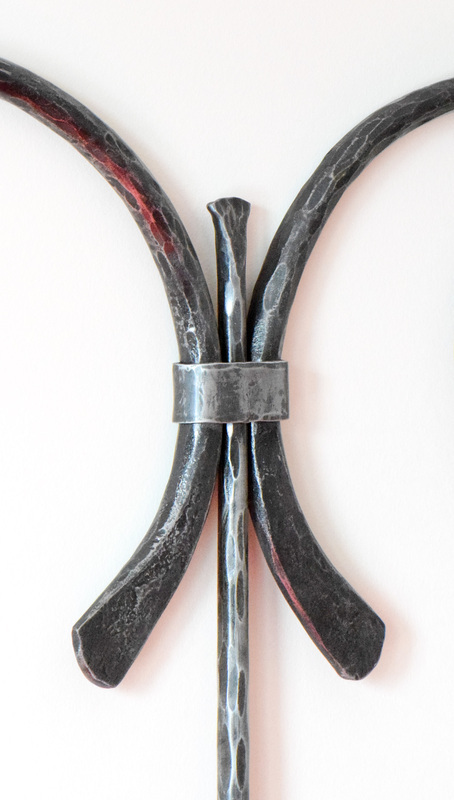 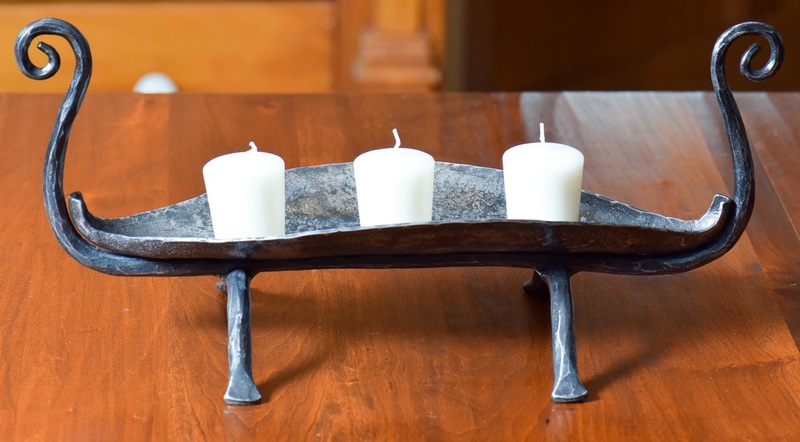 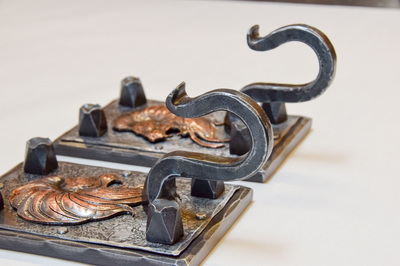 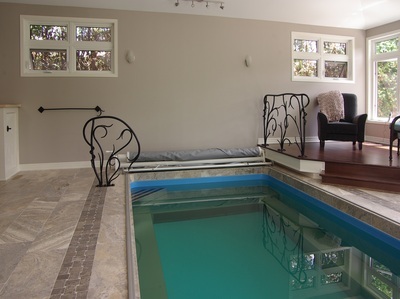 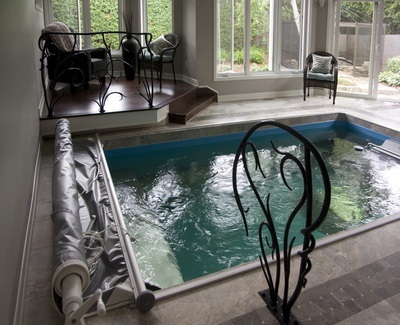 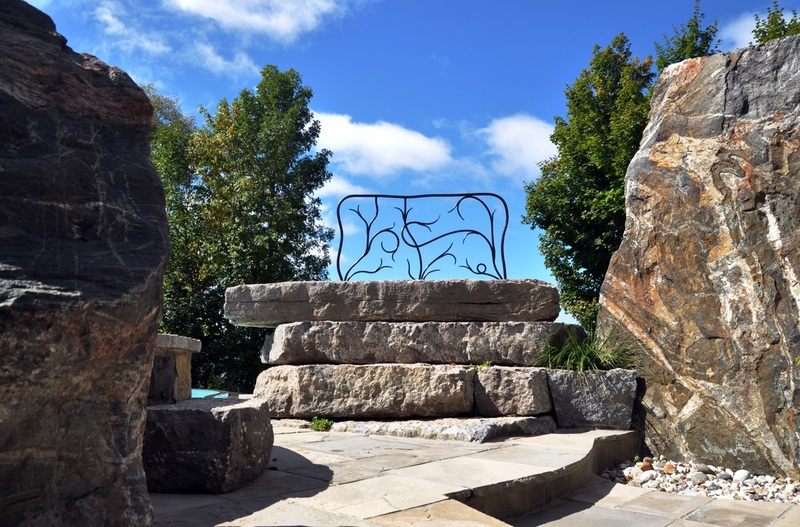 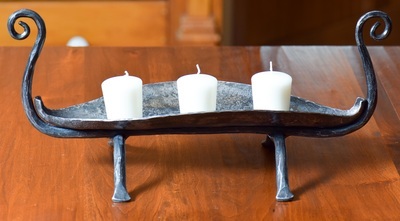 These pieces were forged as part of a commission for an indoor pool in a private residence. 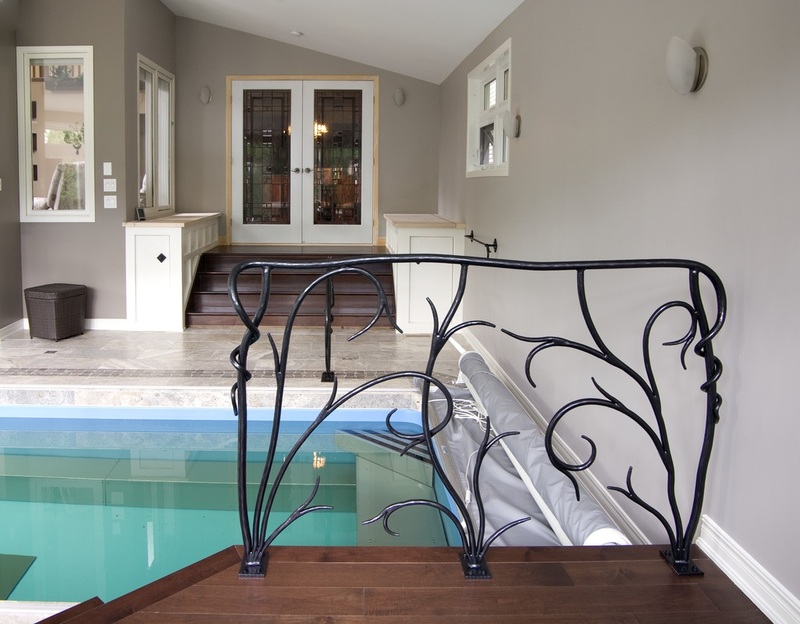 The small railing that leads into the pool was an interesting challenge. 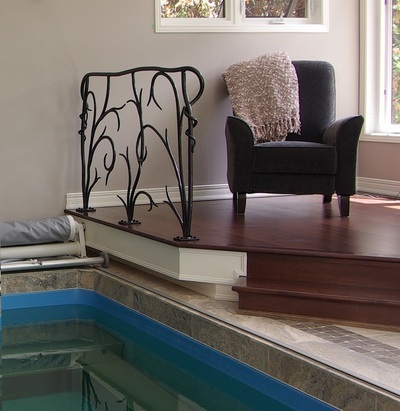 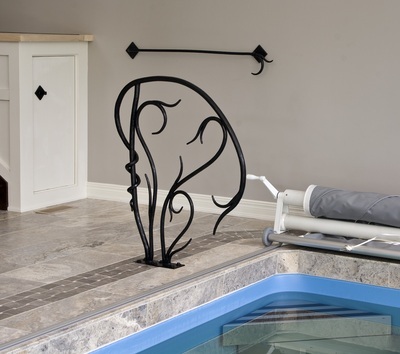 The steps into the pool were quite steep so this small railing needed to integrate several different grab points to ease the entry and exit from the pool. This is a commission for a Juliet balcony that was installed on a beautiful house outside of Perth, Ontario. The direction given was to make it look like I went into the woods to collect somewhat straight branches yet the design had to meet the requirements of the Ontario Building Code. 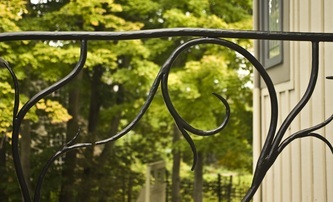 This placed restrictions on spacing between the vertical elements as well as on the movement of the branches themselves. 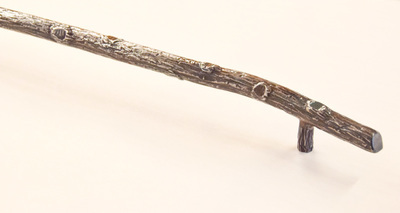 Sometimes I wish I could actually use branches. 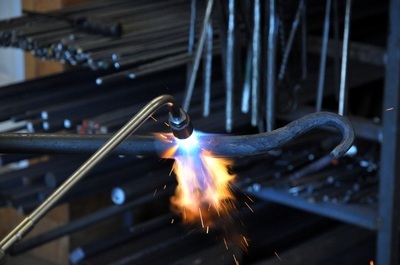 It would be so much lighter than iron for moving around my shop and loading into my truck! This commissioned railing comprises 4 main sections. The client had an idea for an organic-looking design and we worked closely to come up with this final design. 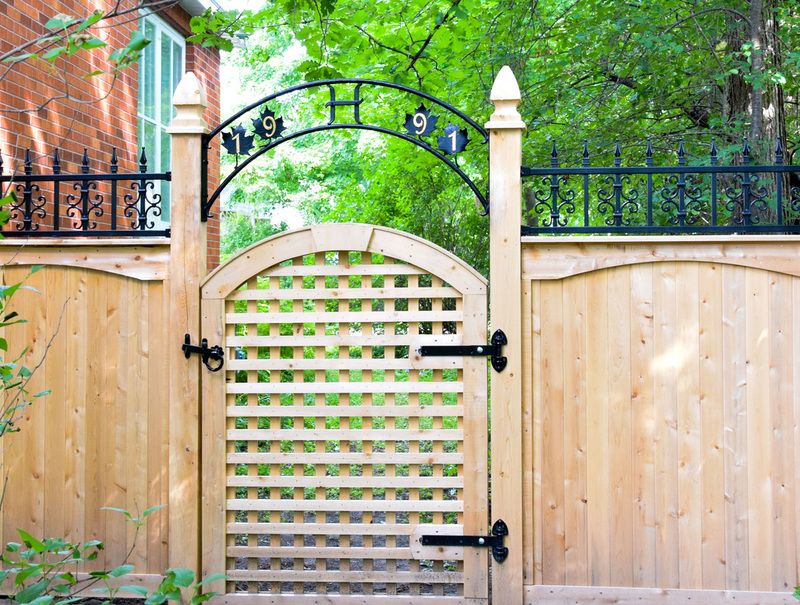 This was a very enjoyable project from start to finish. Over 330 hours at the anvil and enough propane BTUs consumed by the forge to bring the equivalent of 67,000 lbs of water to a boil!